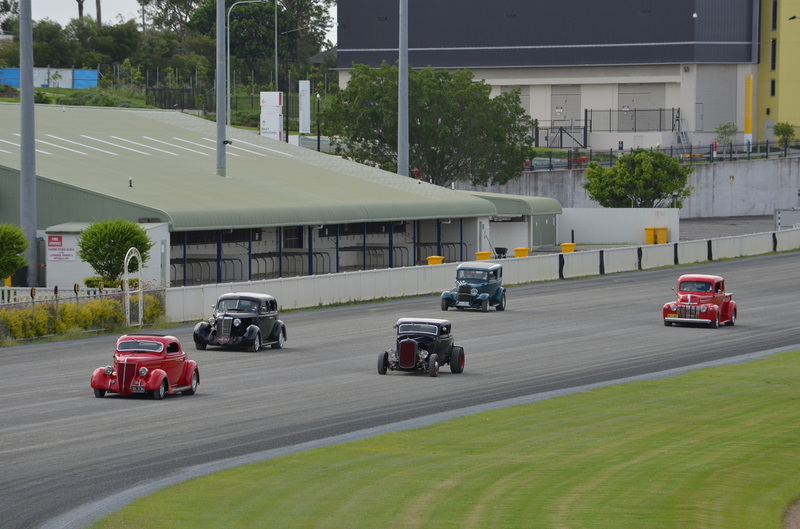 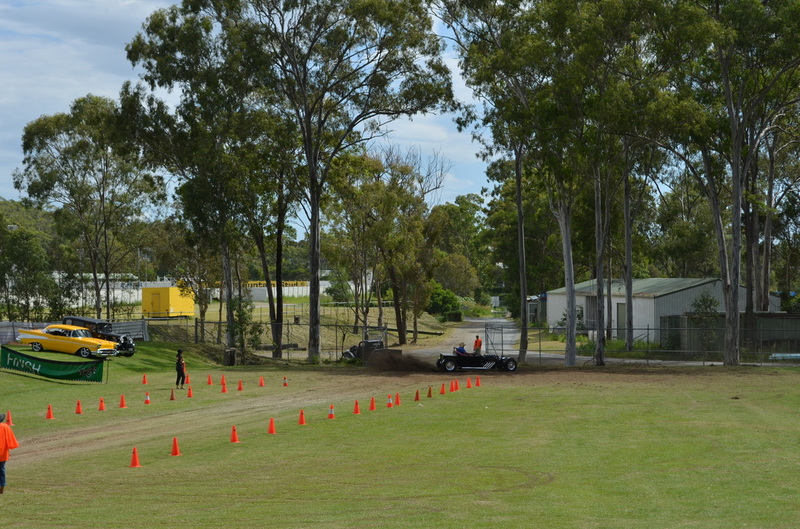 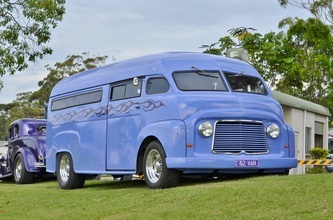 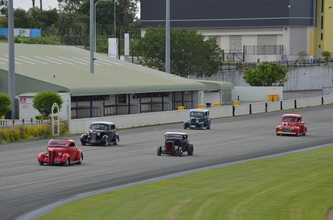 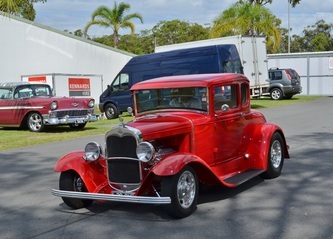 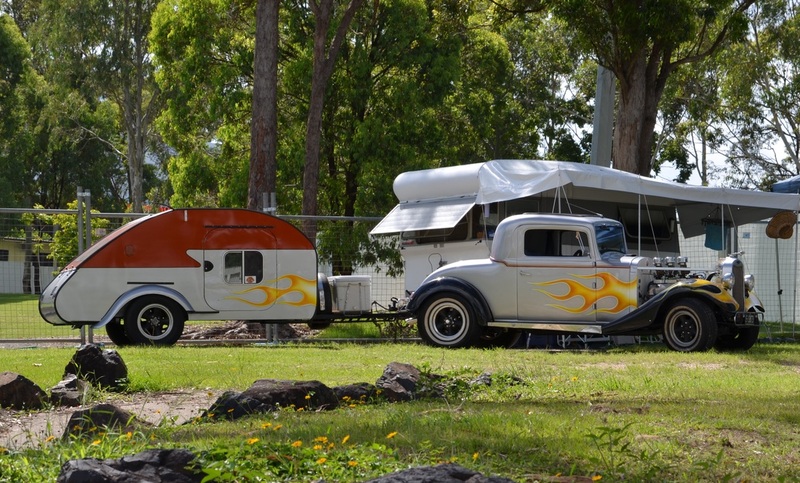 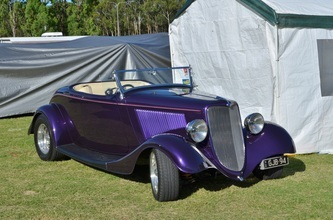 The 2013 ASRF Nationals at Parklands on the Gold Coast saw 15 of our members attend the event and 9 rods from the club make the trip North. 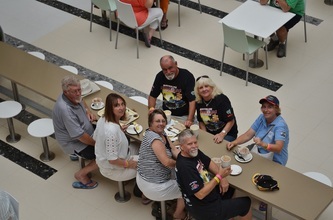 It was not all smooth sailing getting there with Pete having lots of problems and Bob having a few but in the end we all made it on time. 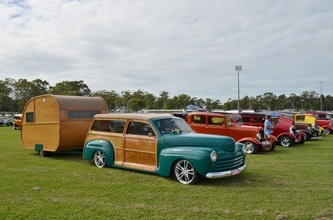 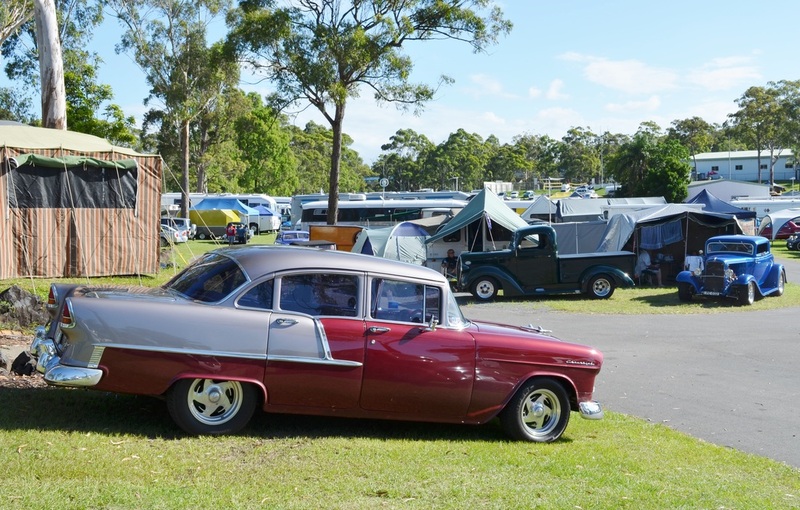 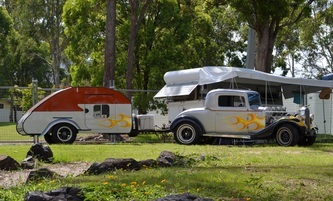 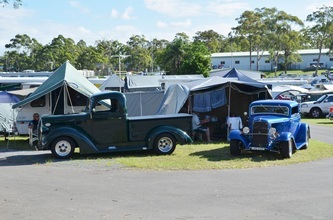 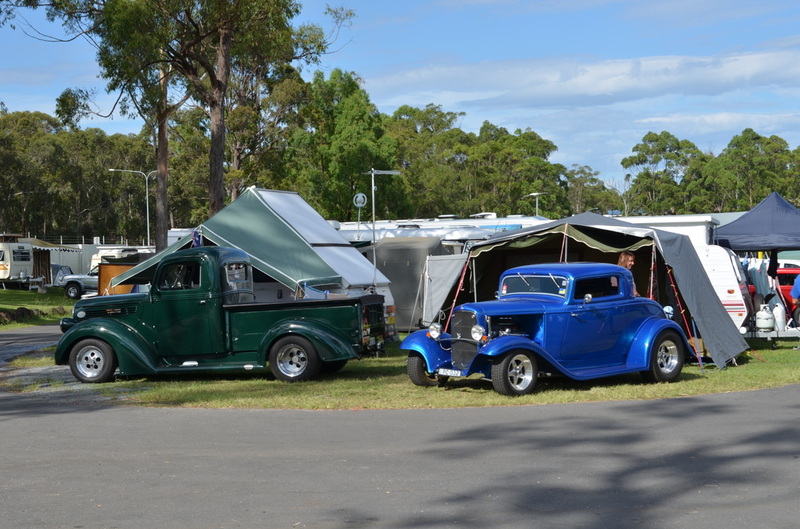 Camping at the ground was great fun with plenty of rods to see, people to talk to and entertainment supplied. 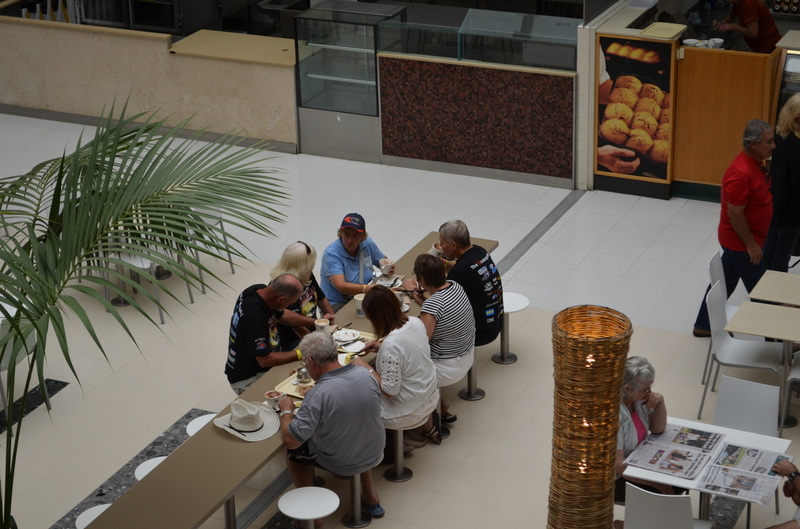 The facilities were clean and well looked after and if you need sleep like I do everyone was considerate. 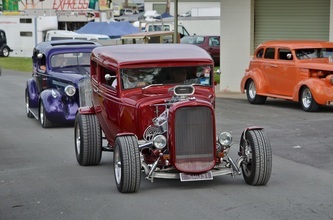 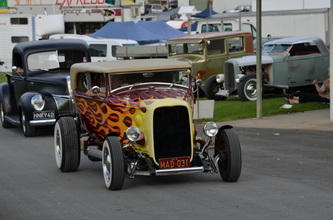 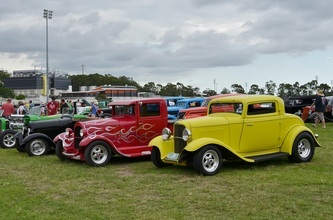 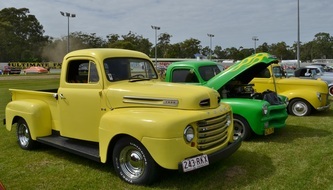 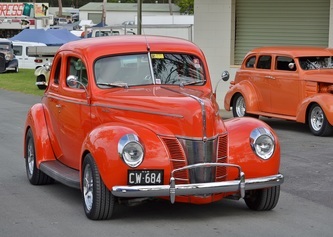 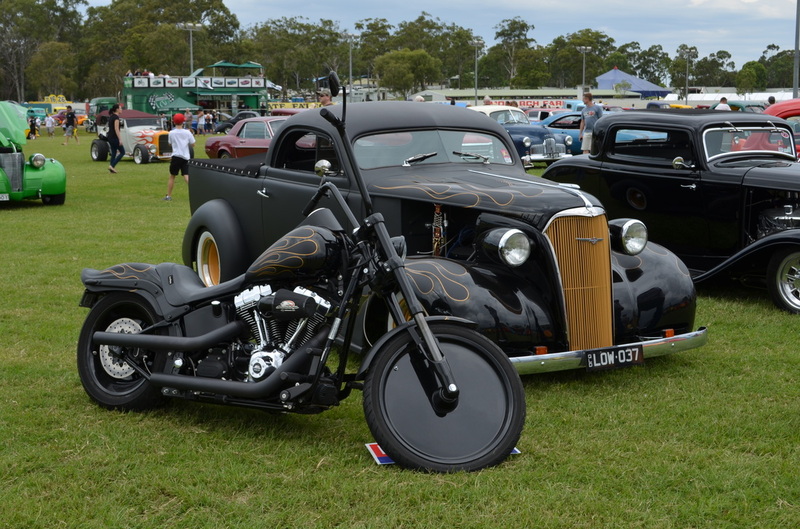 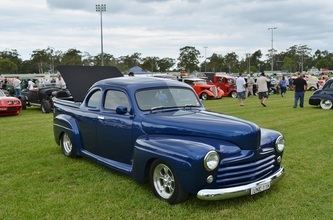 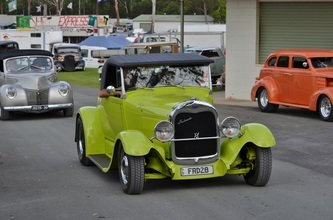 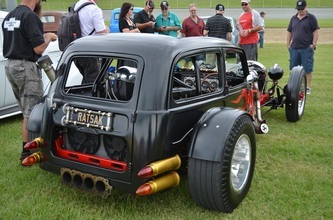 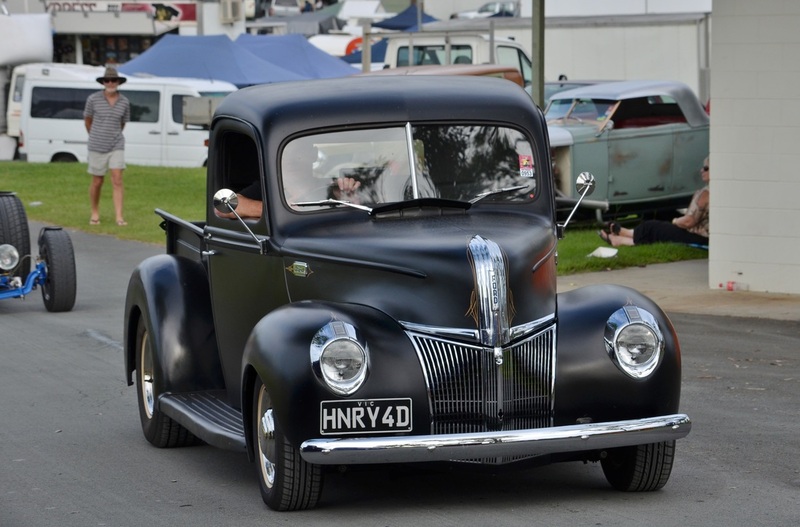 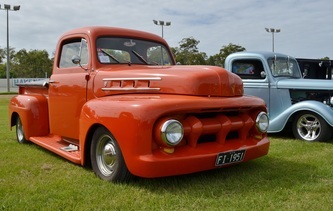 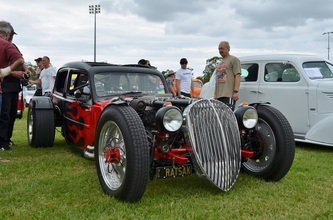 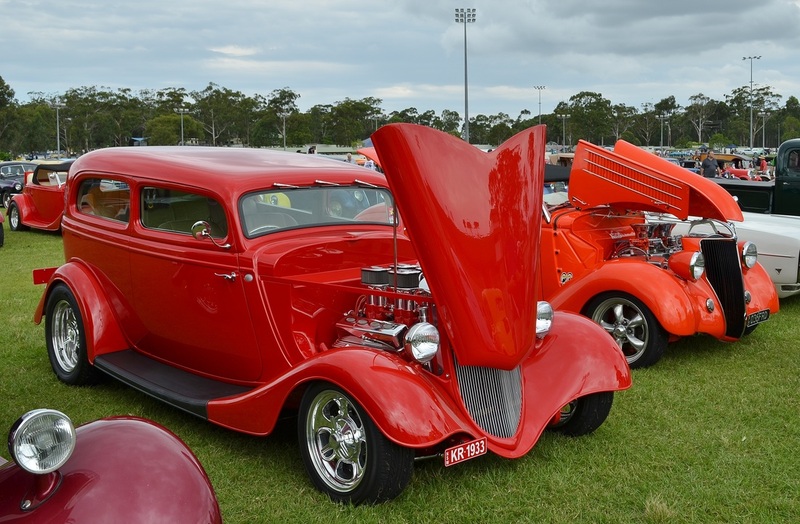 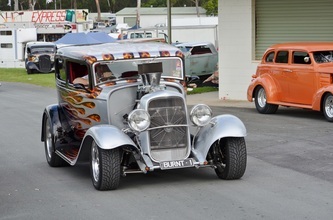 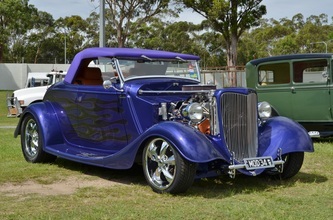 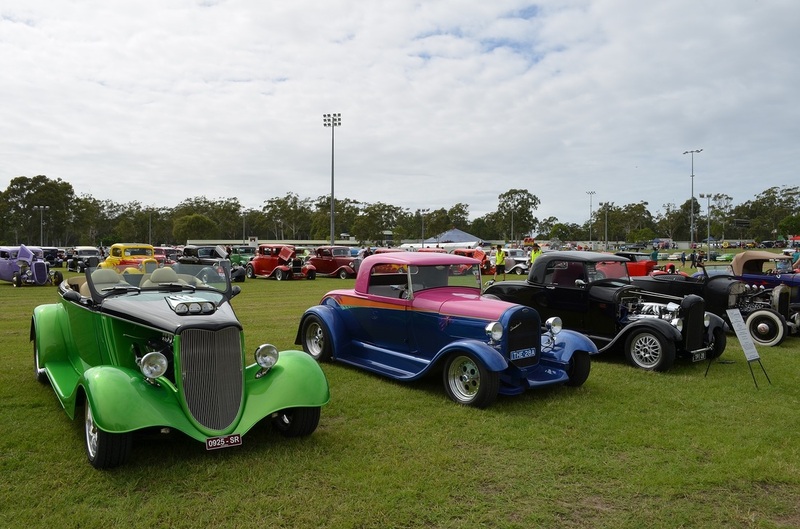 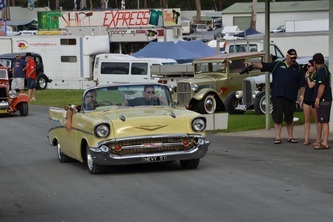 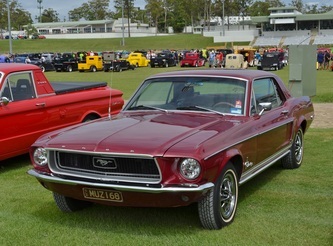 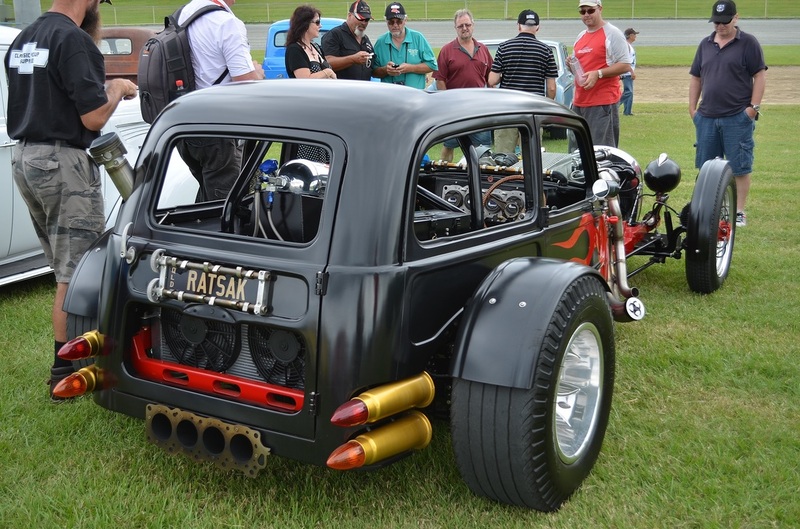 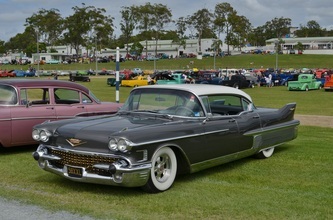 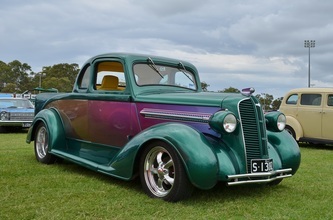 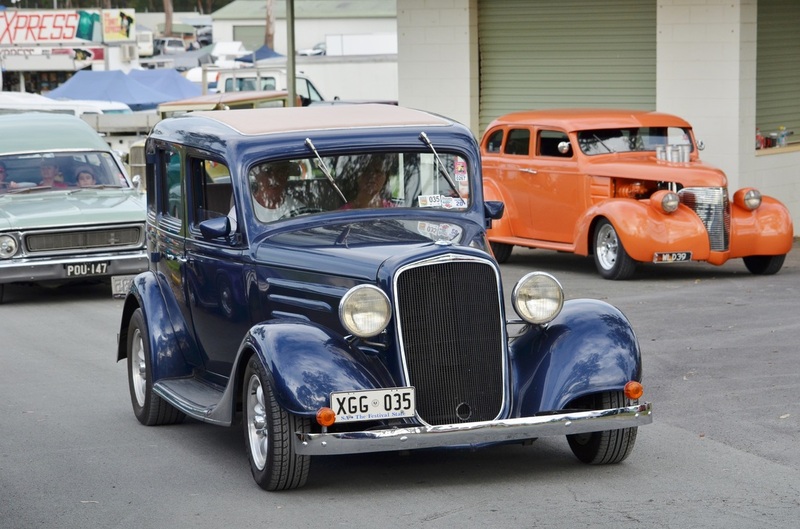 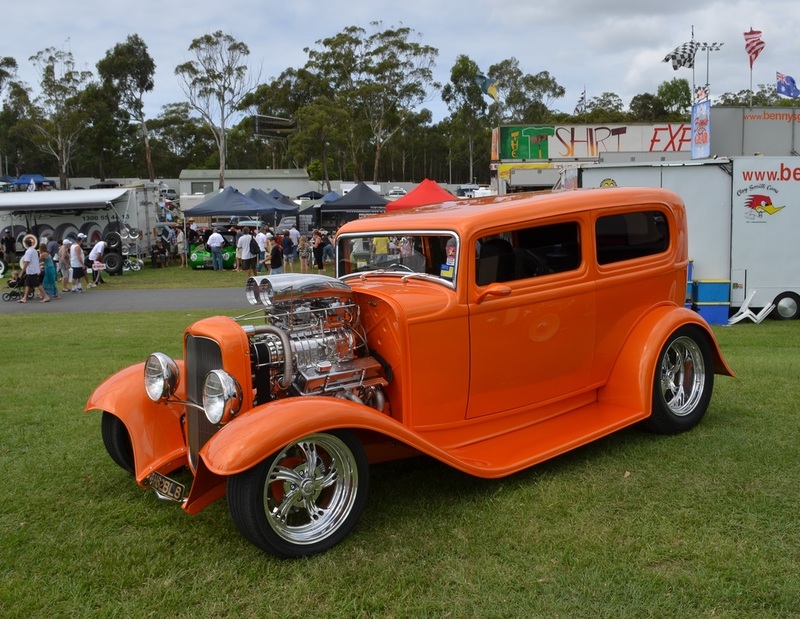 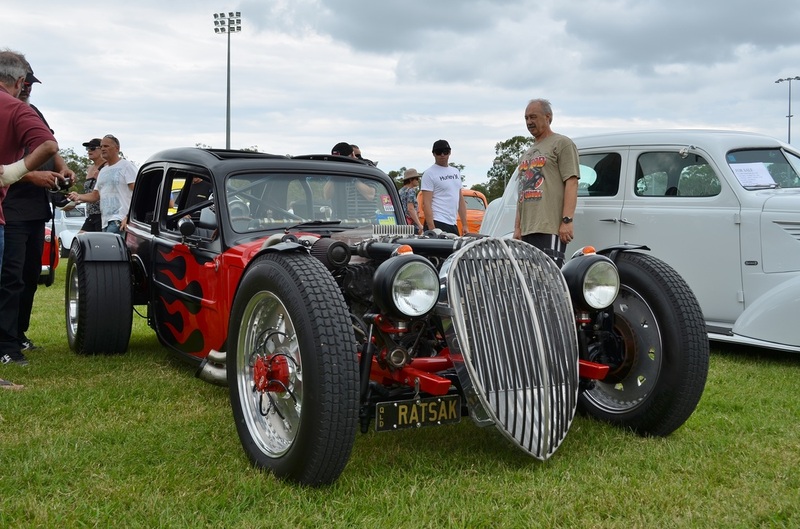 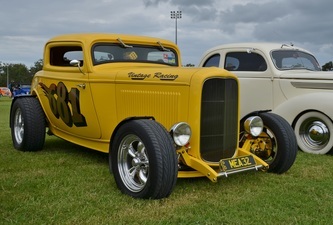 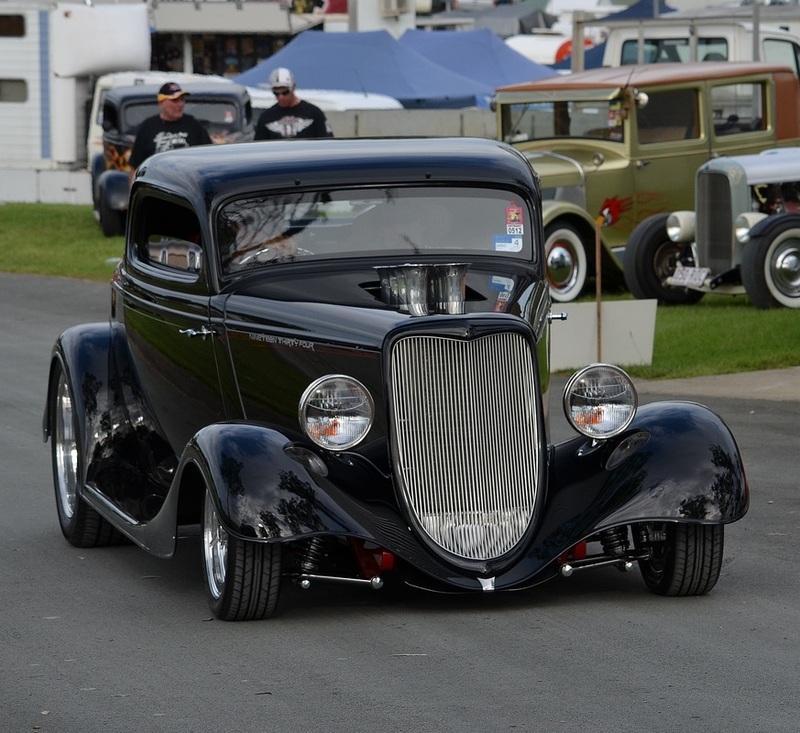 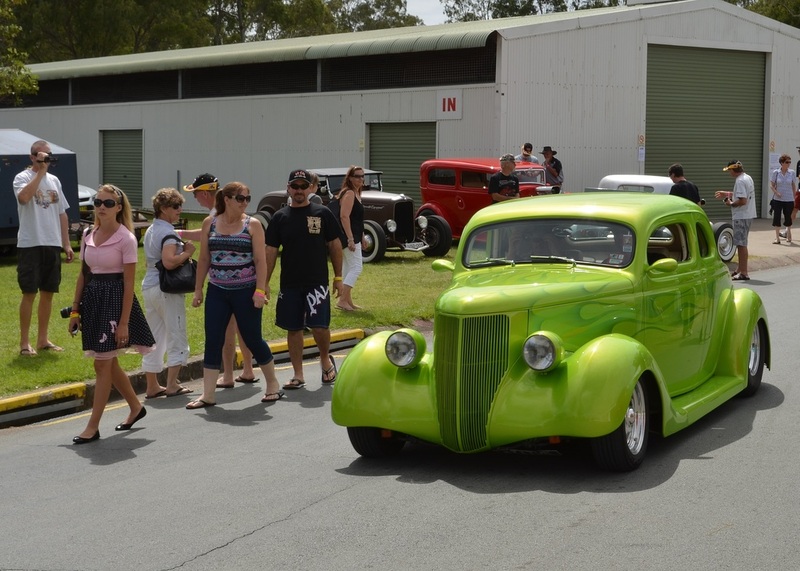 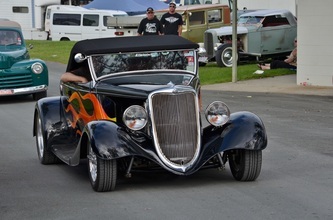 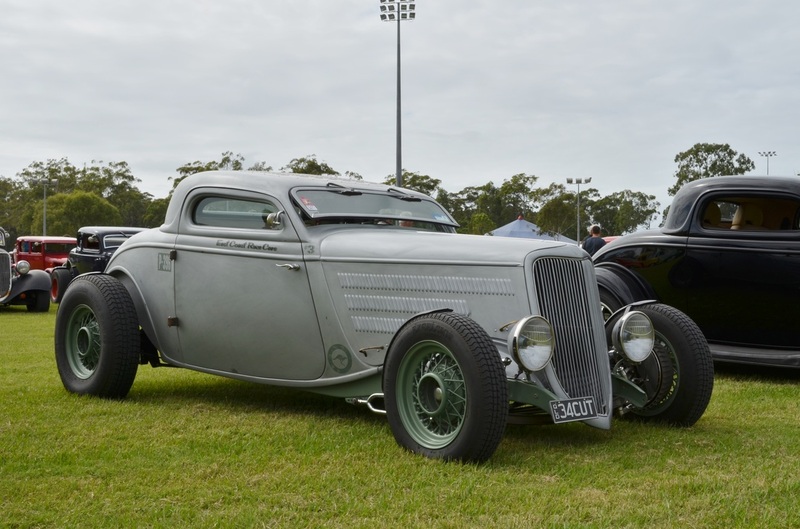 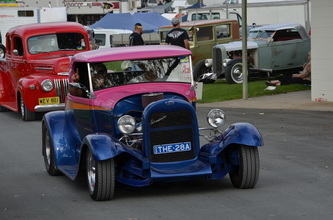 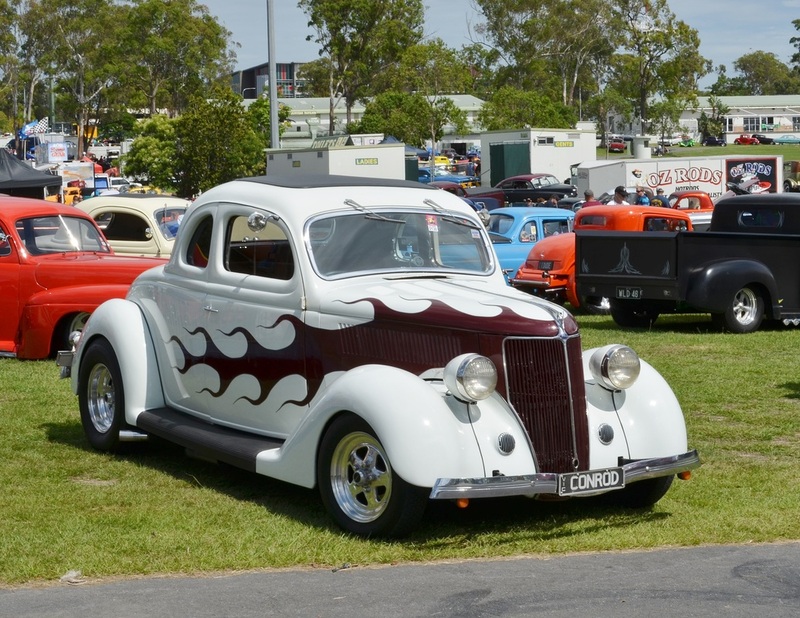 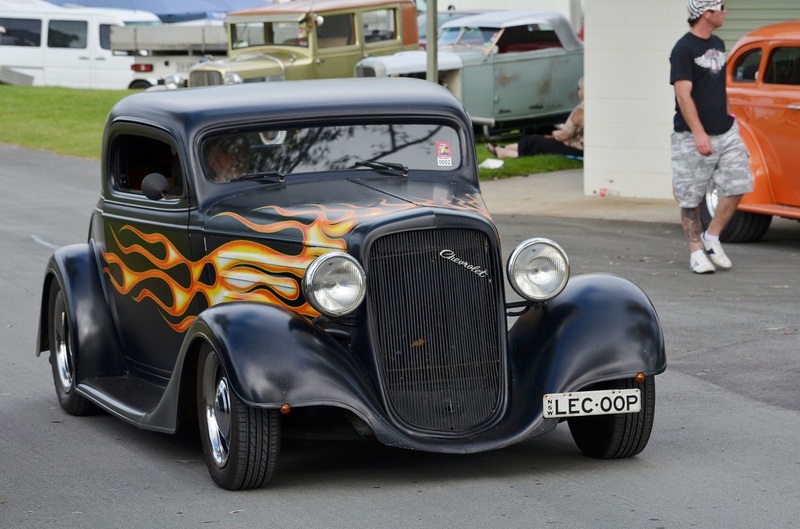 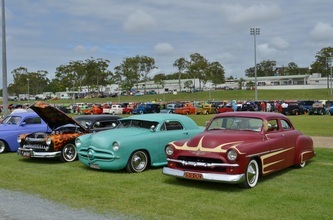 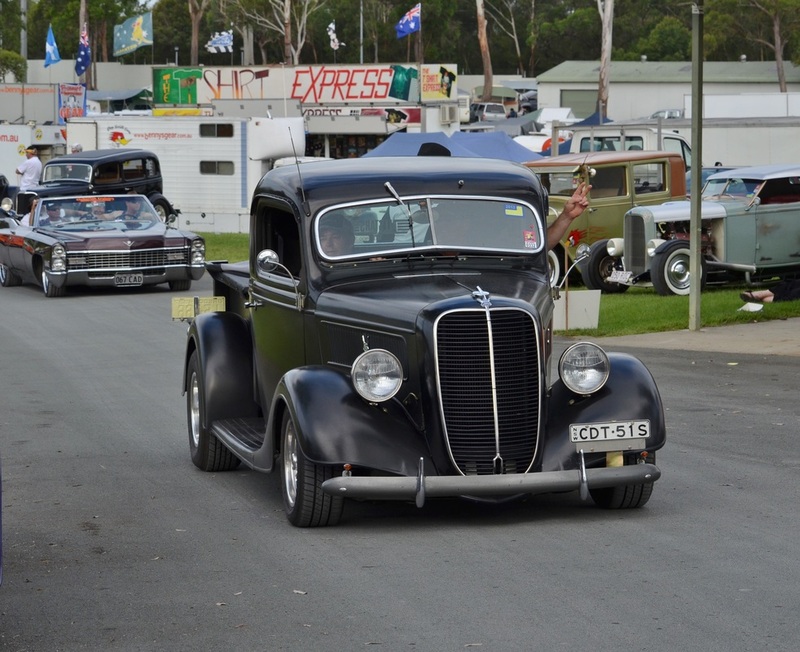 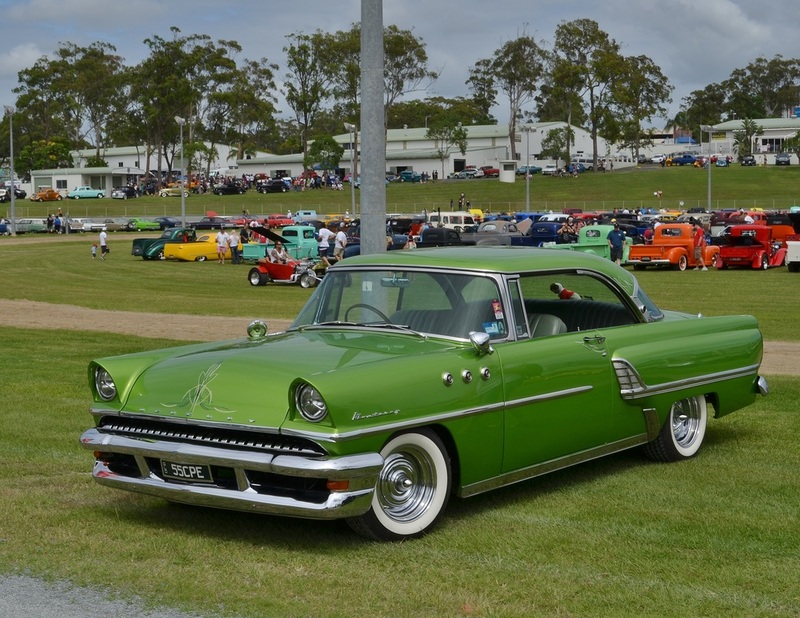 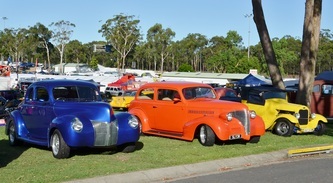 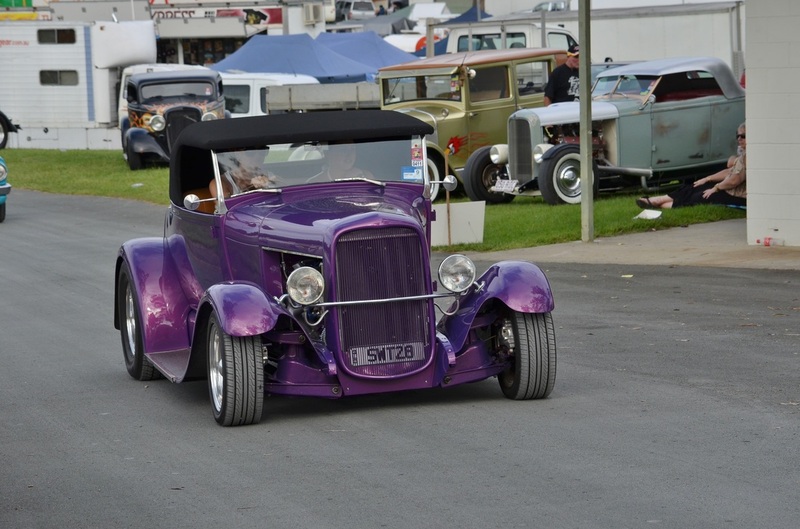 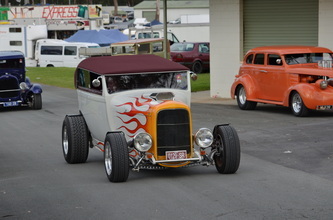 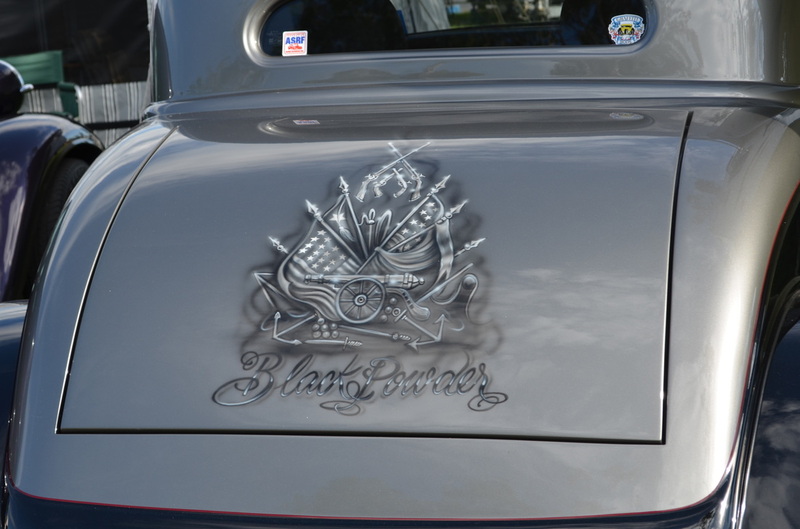 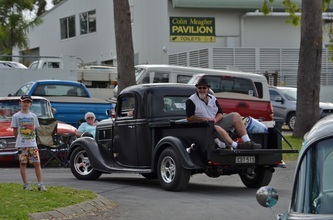 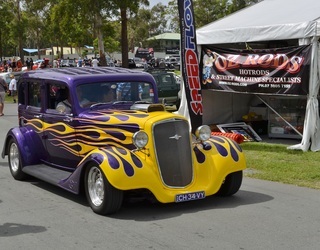 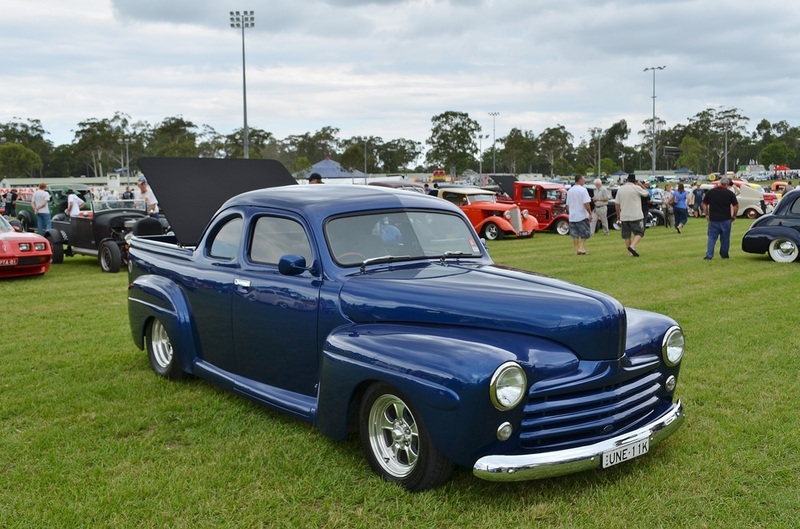 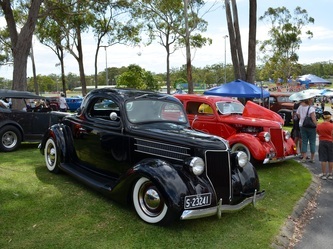 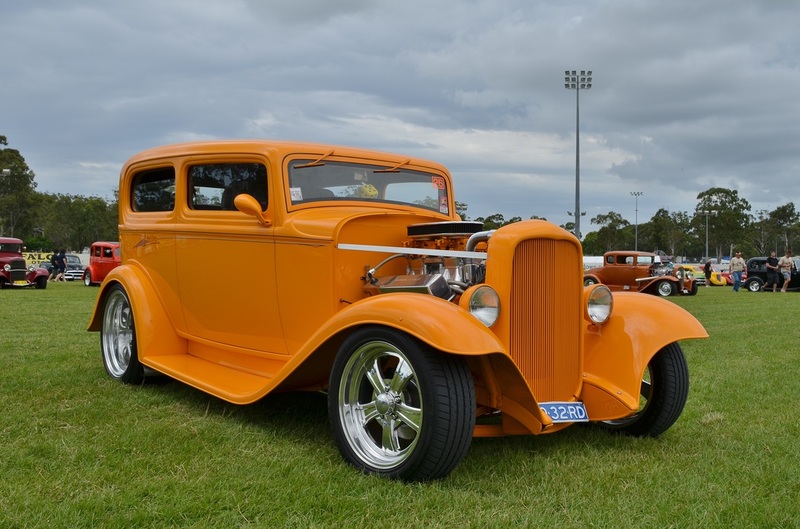 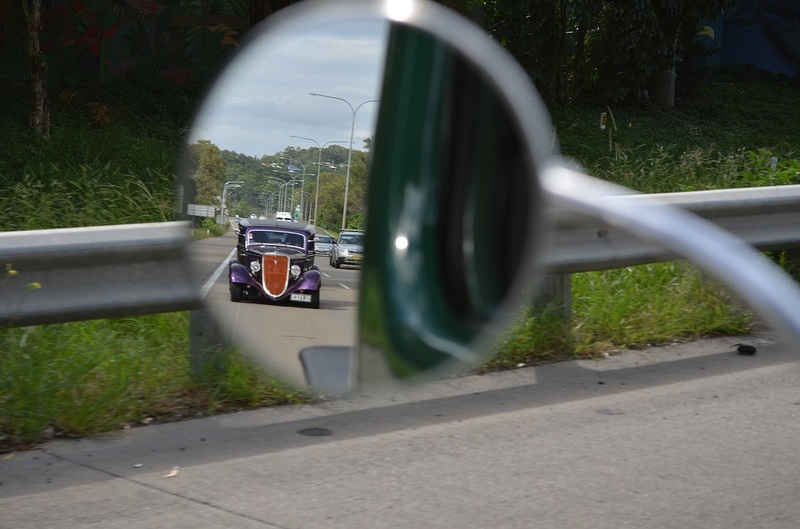 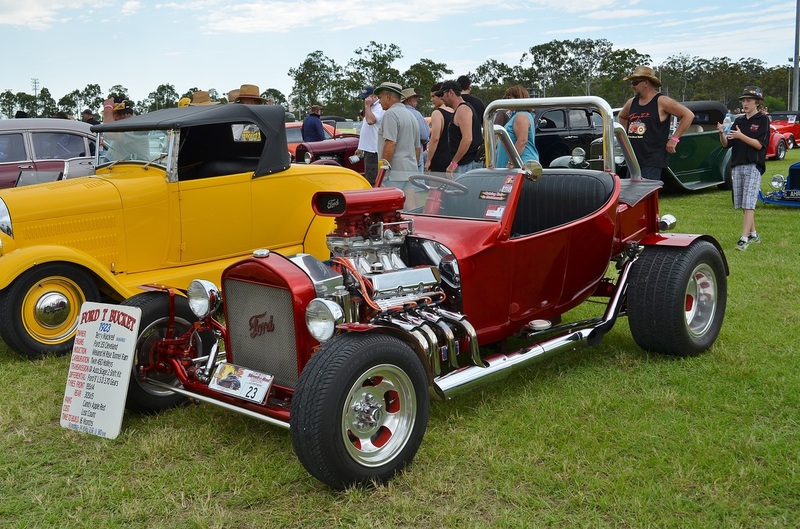 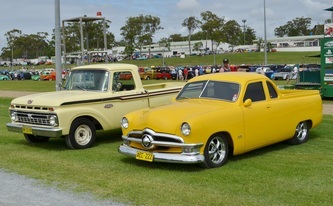 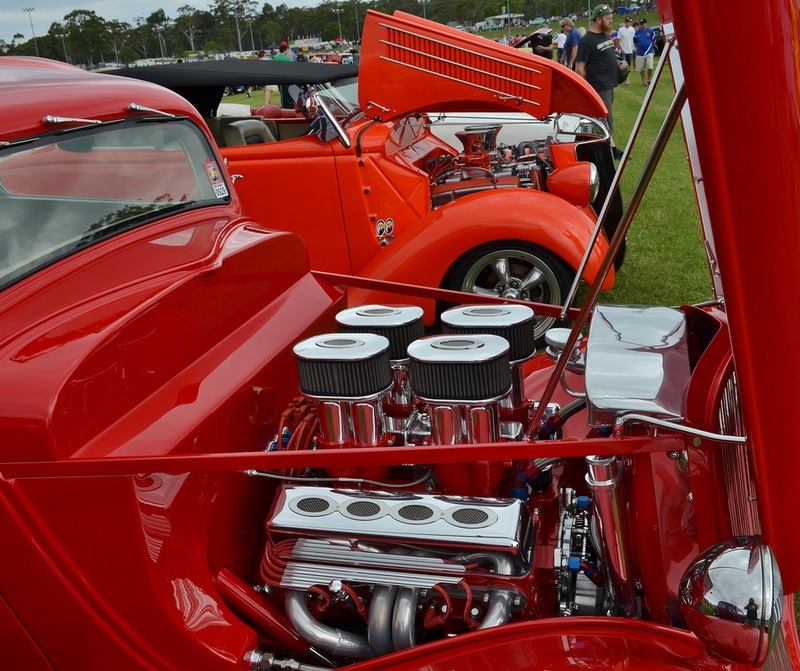 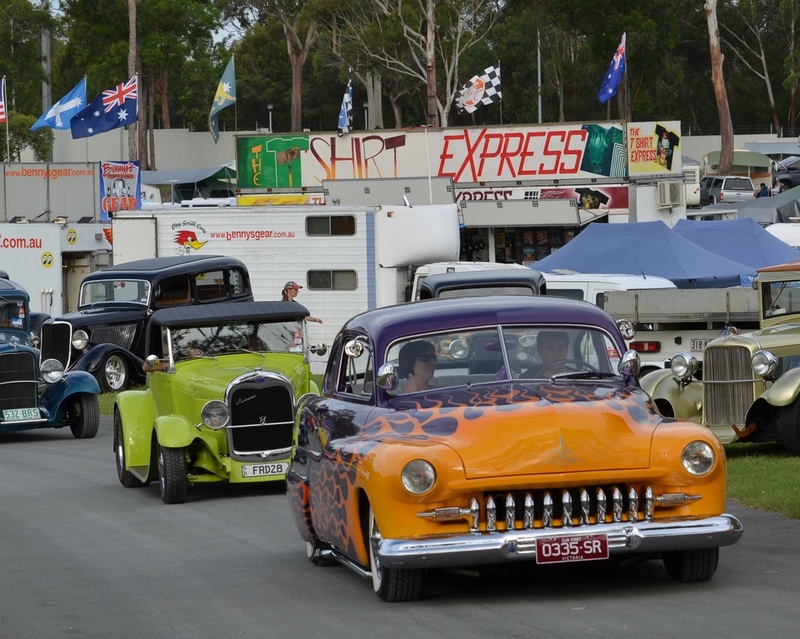 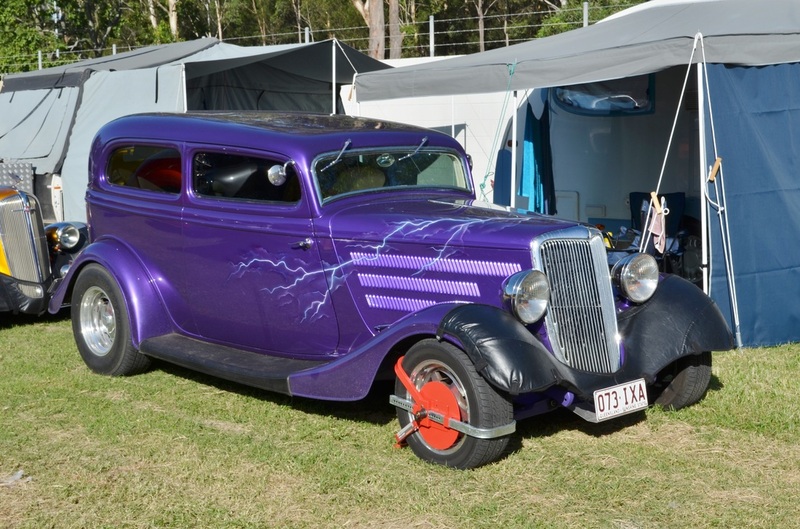 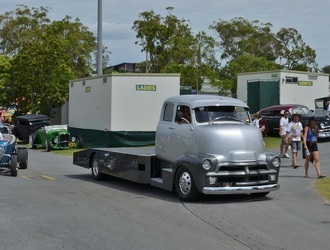 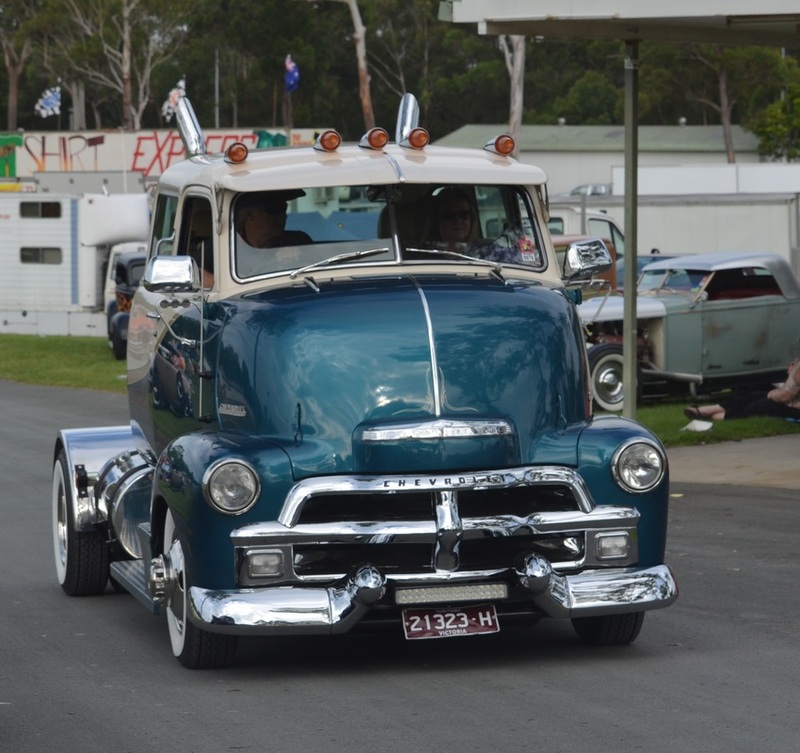 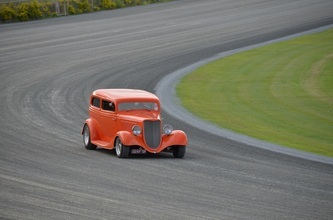 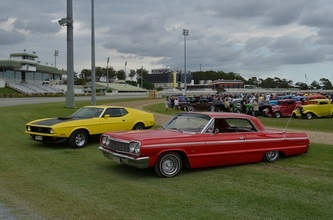 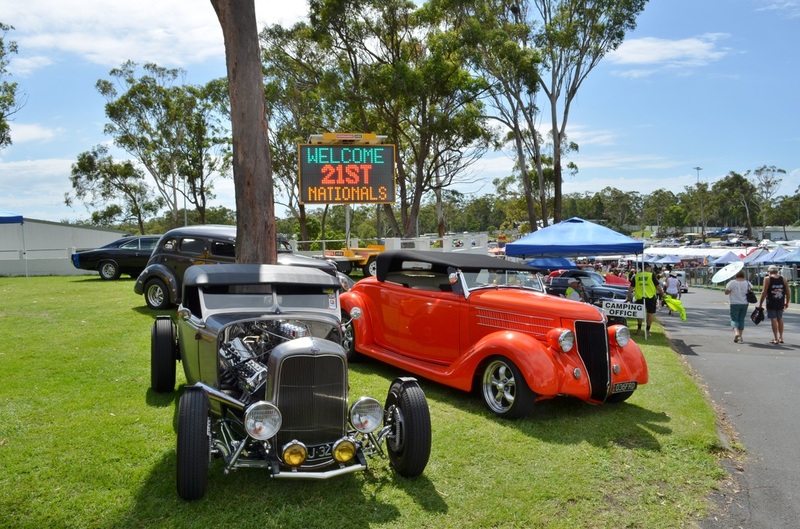 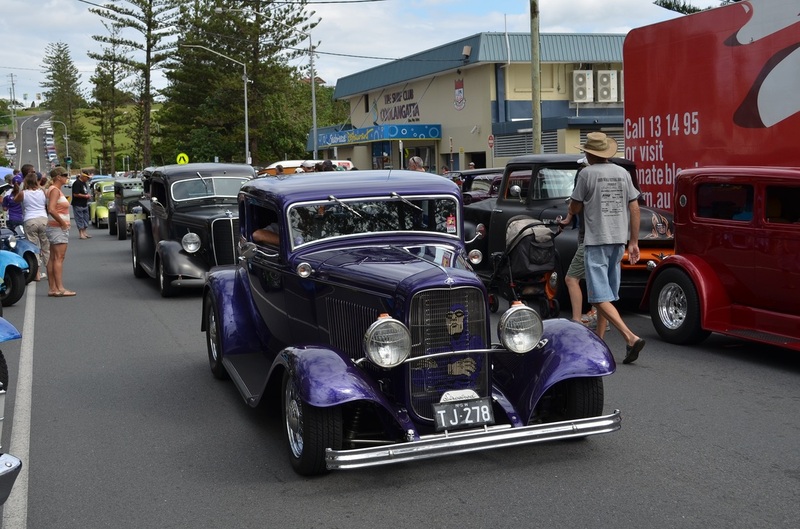 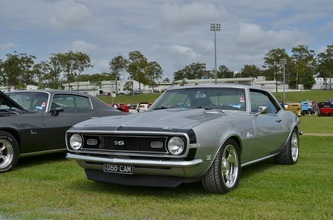 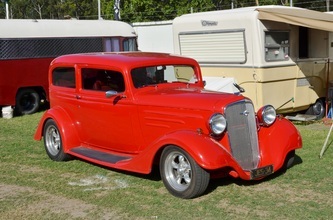 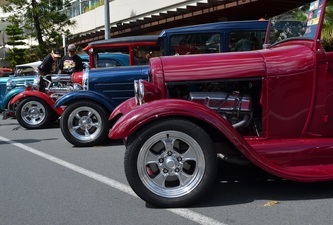 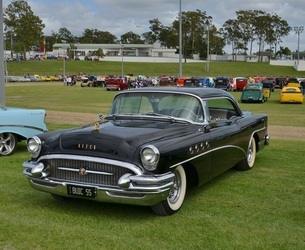 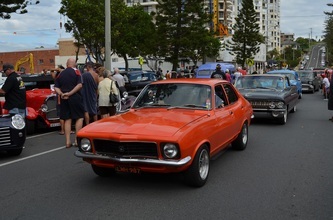 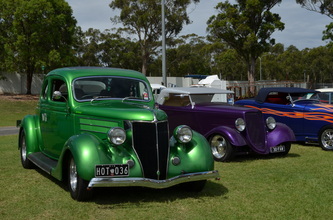 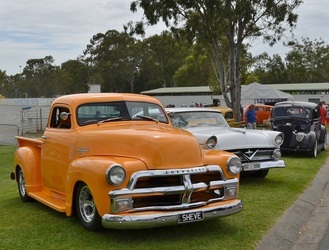 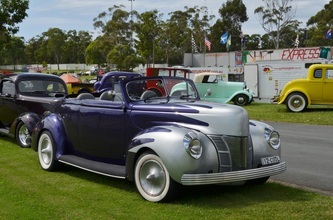 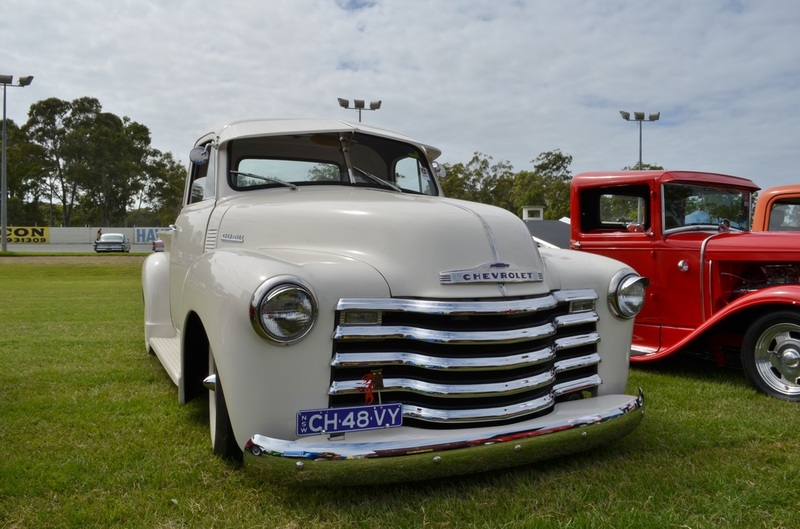 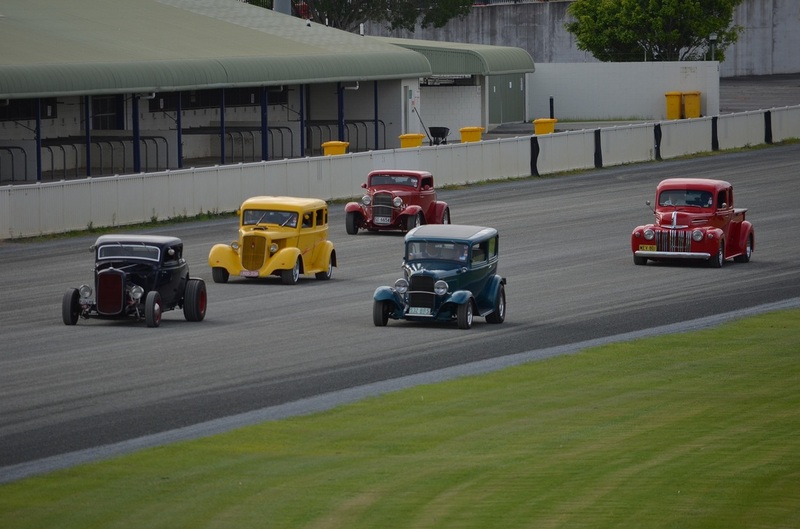 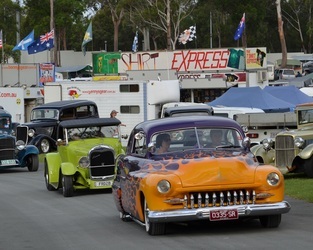 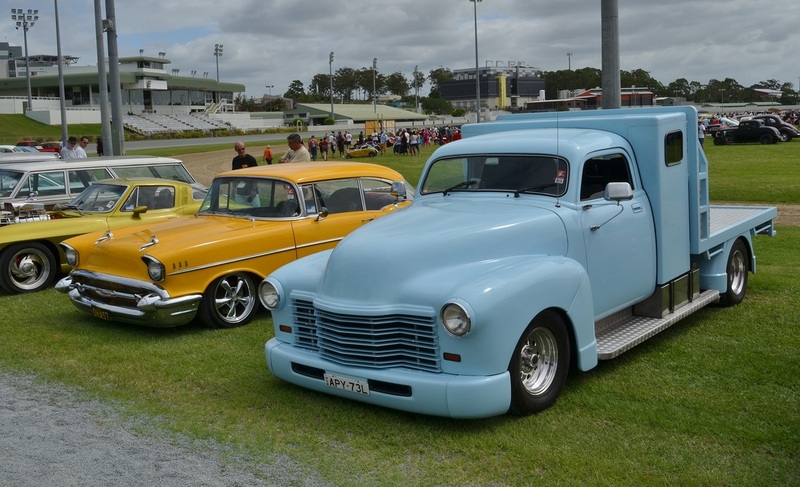 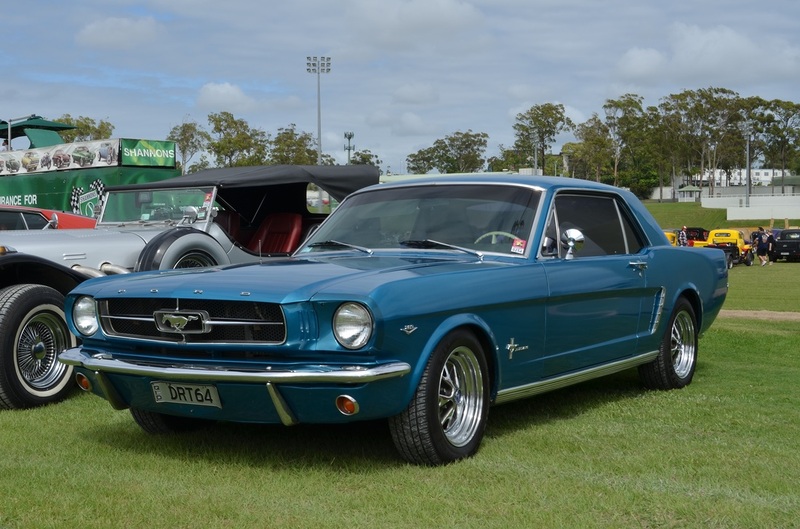 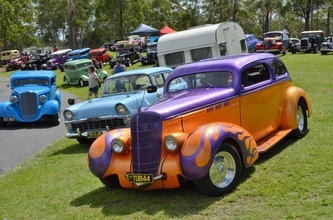 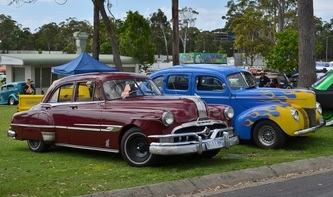 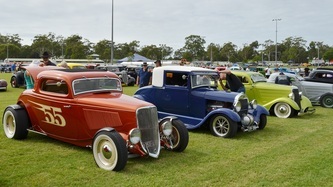 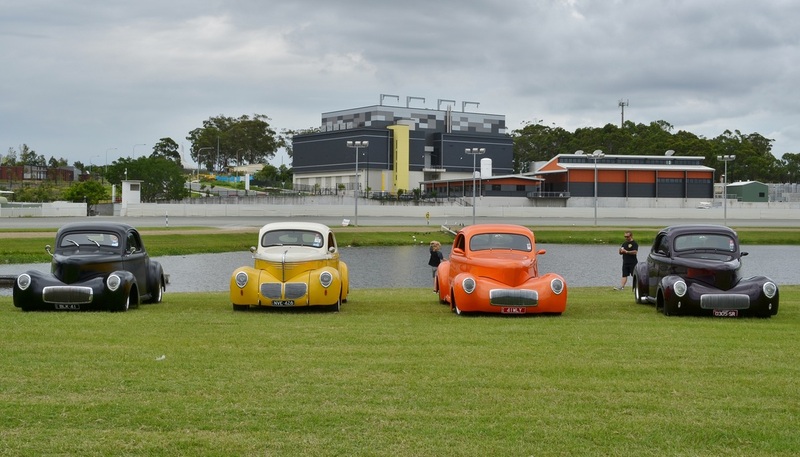 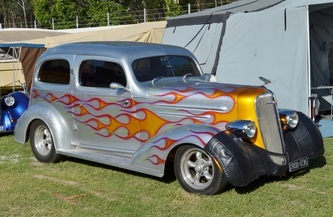 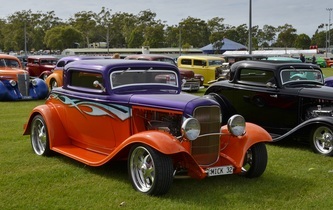 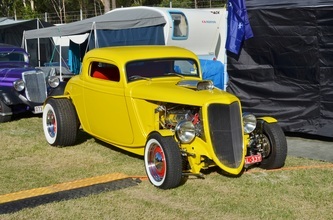 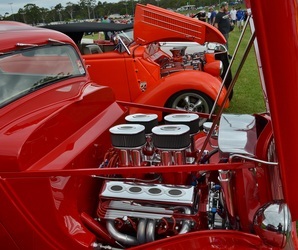 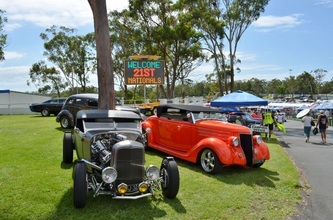 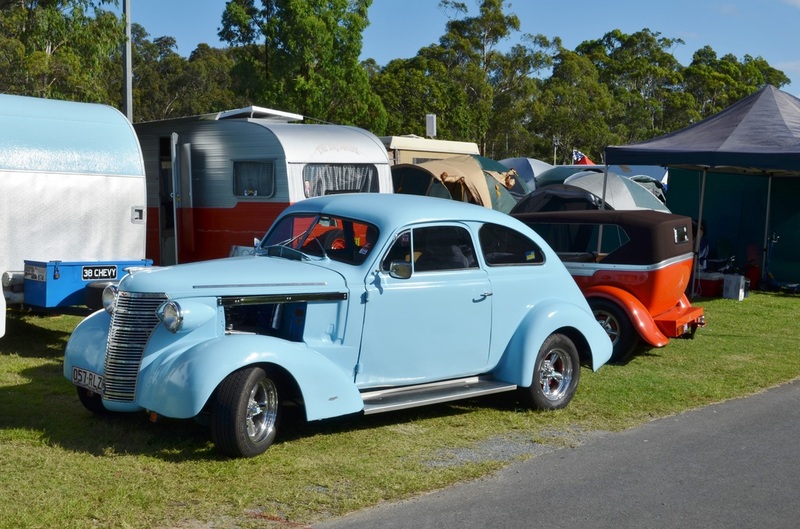 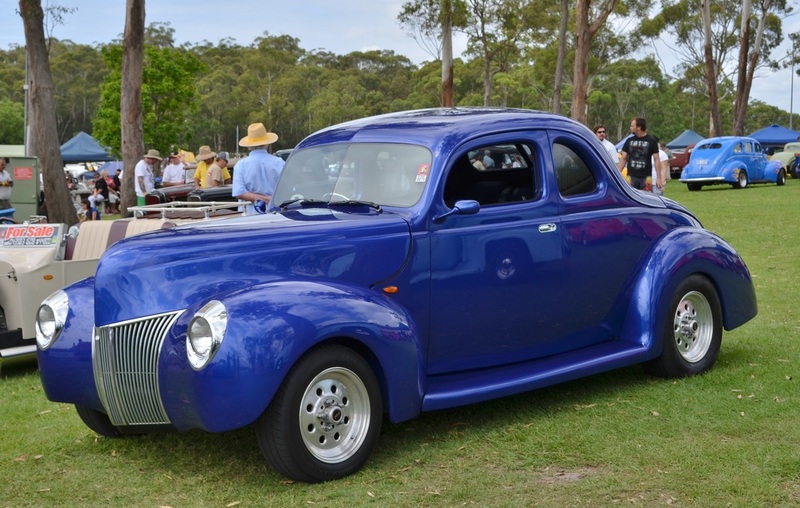 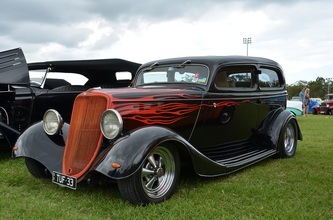 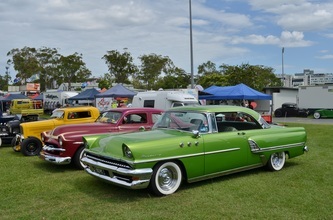 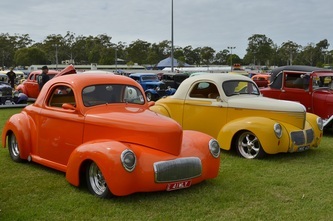 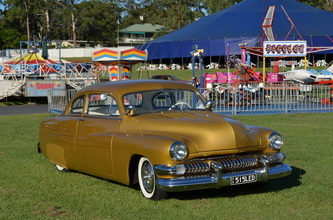 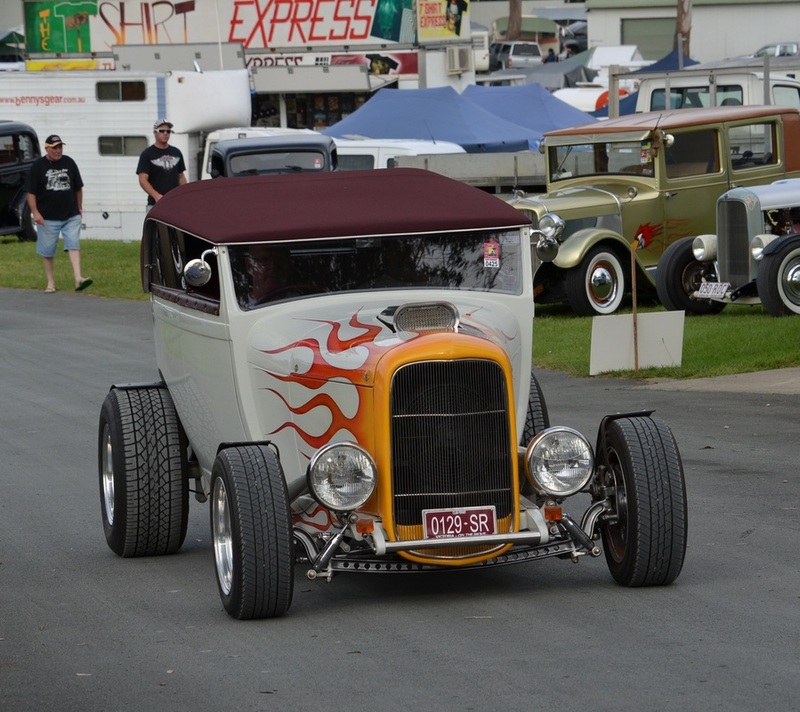 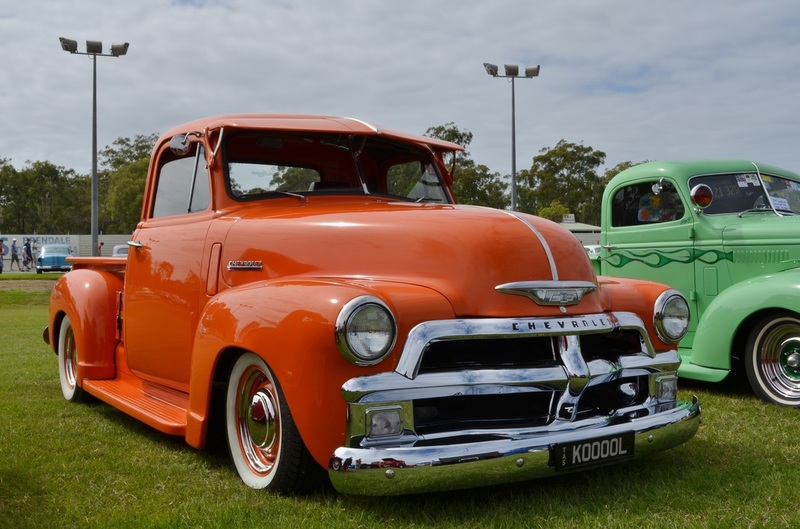 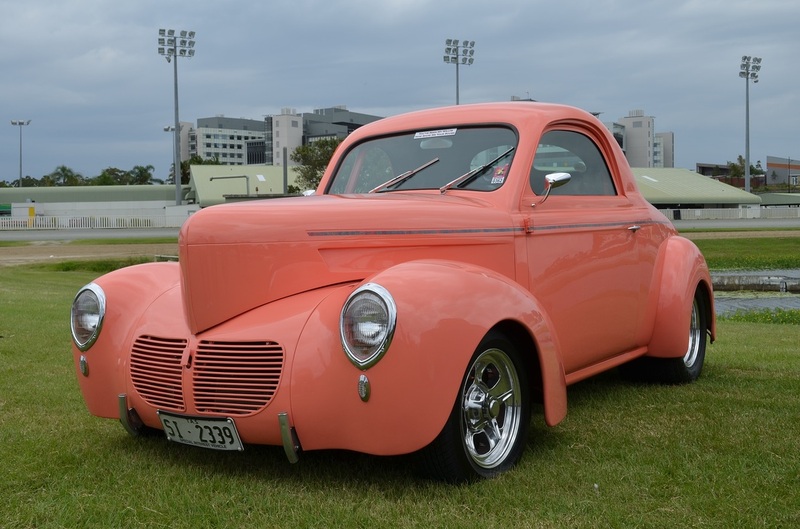 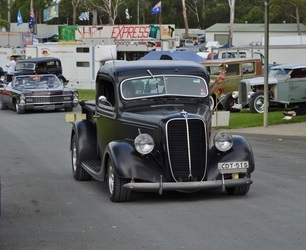 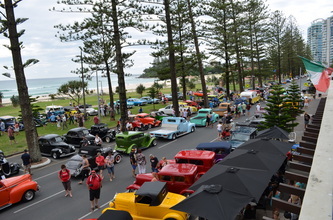 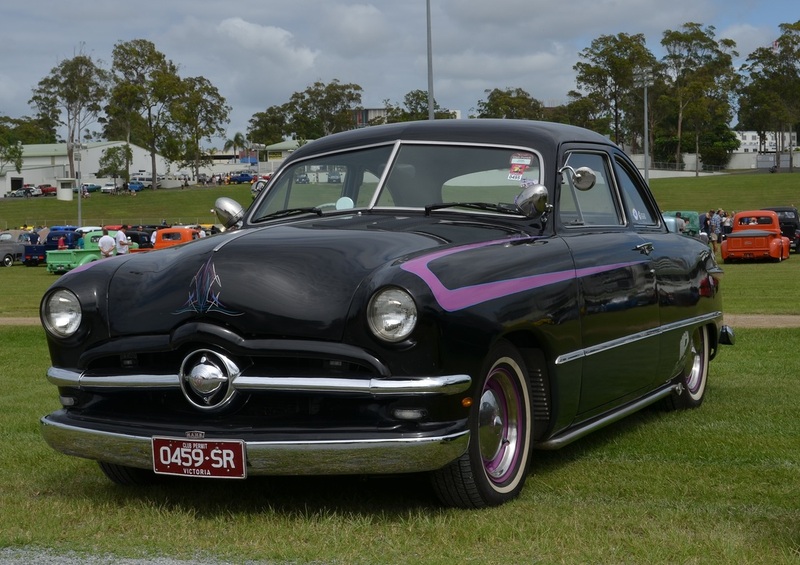 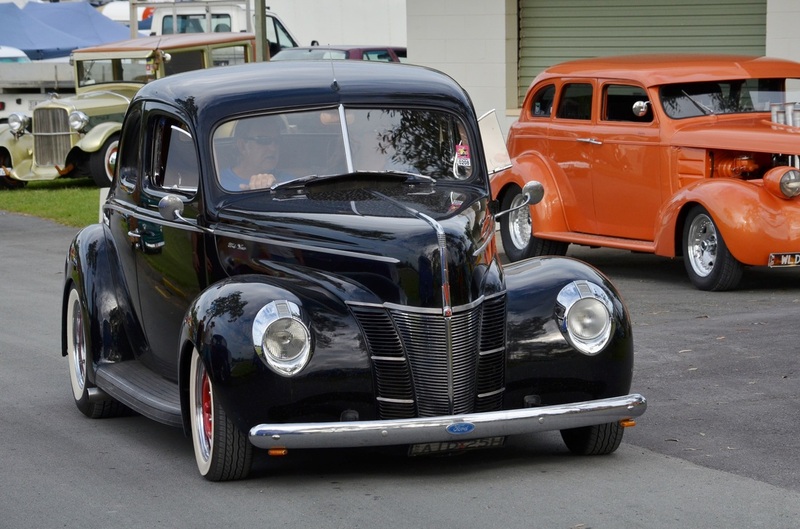 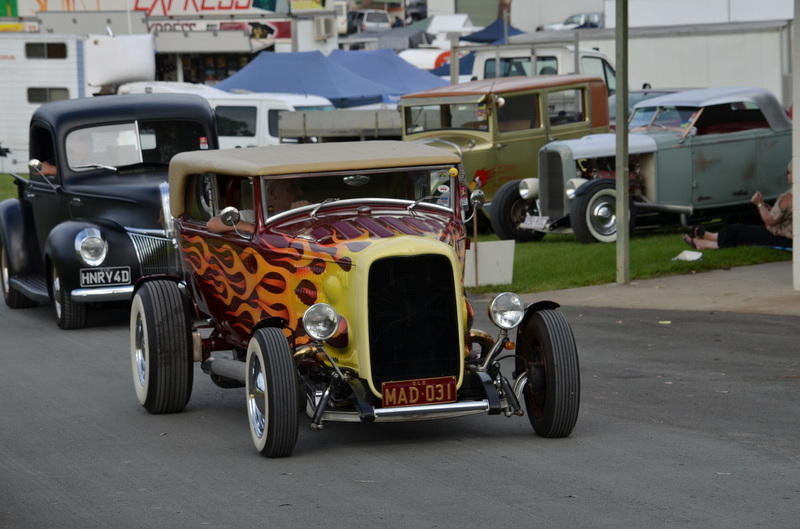 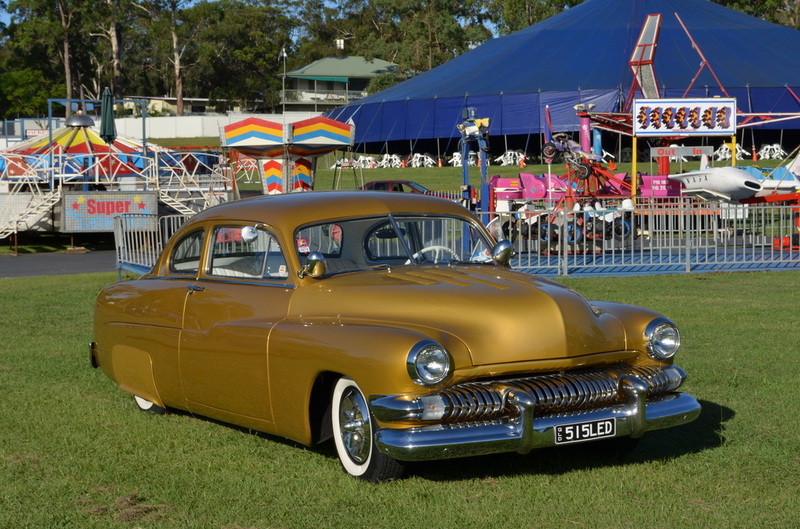 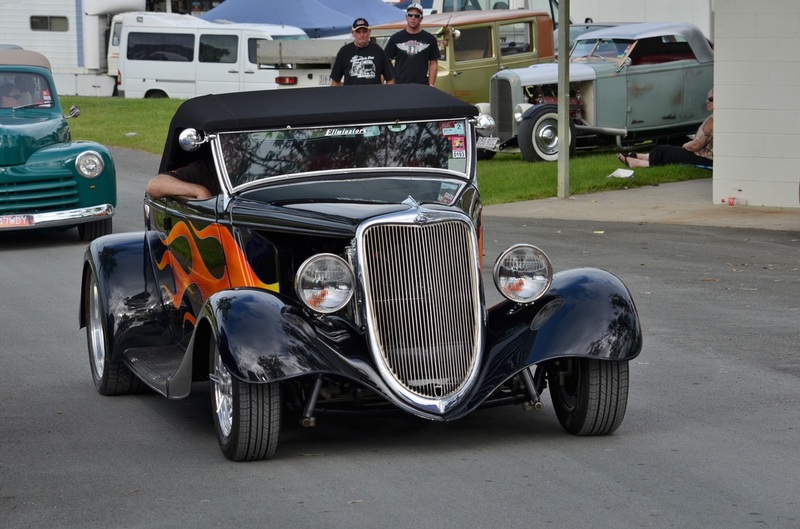 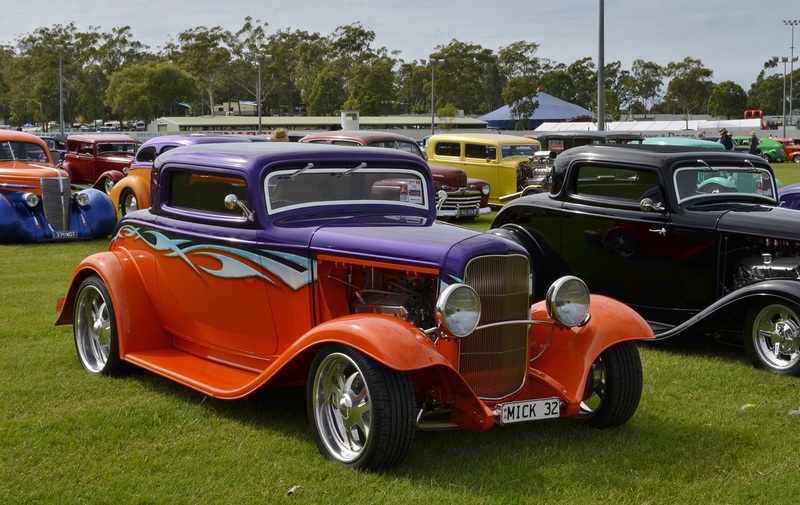 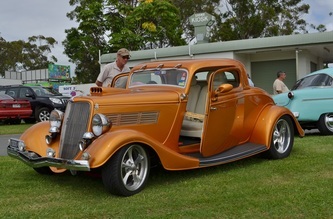 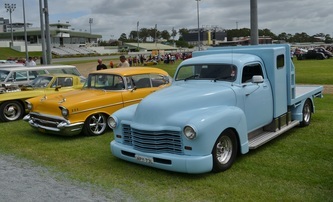 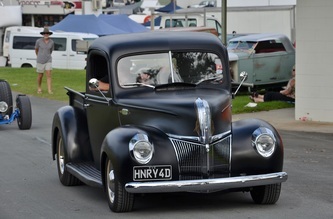 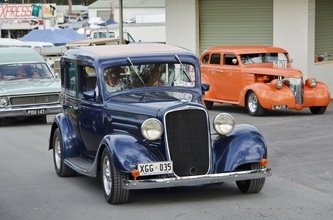 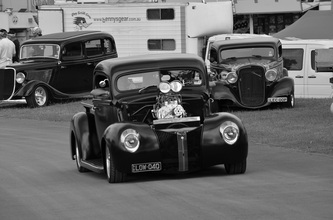 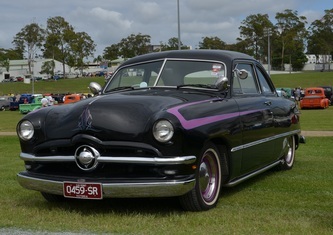 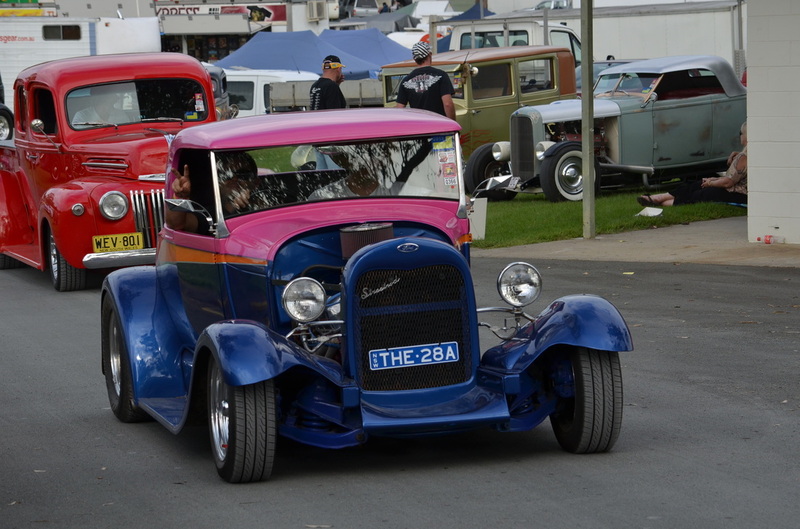 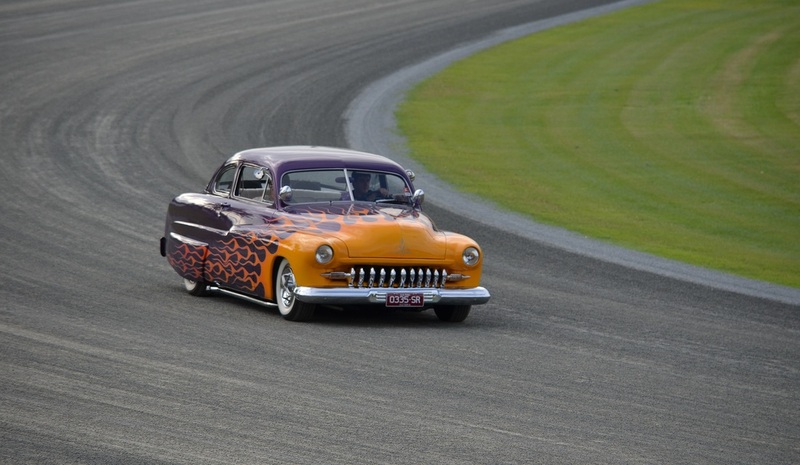 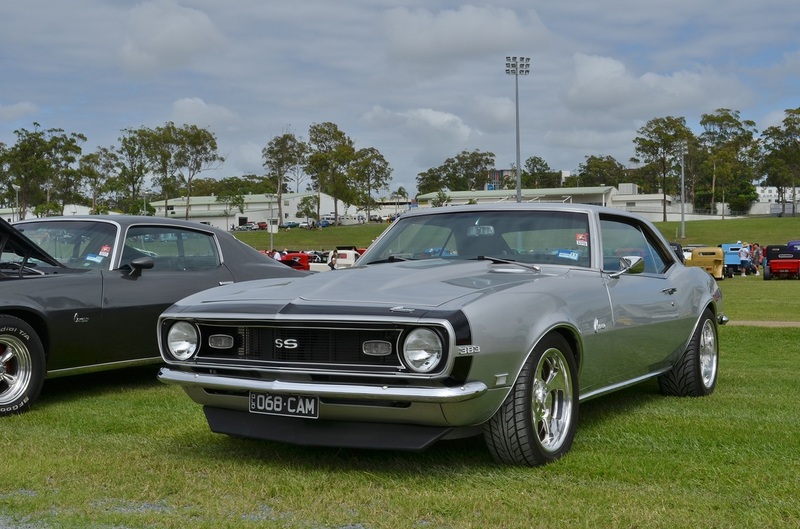 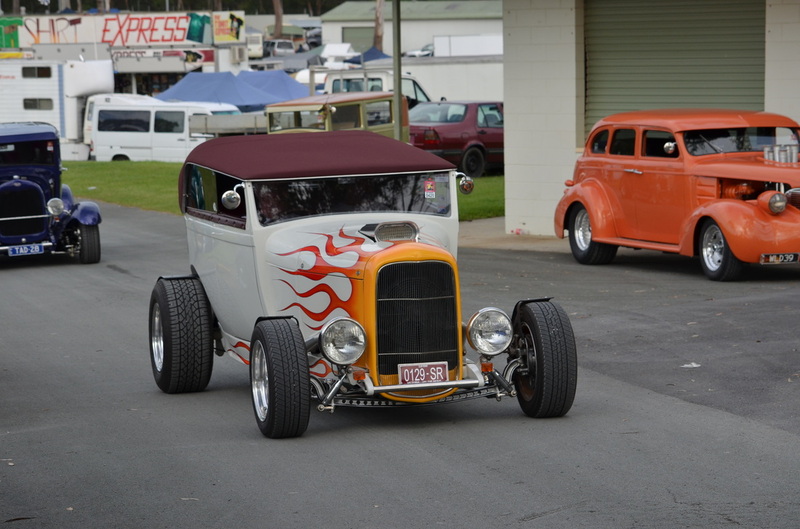 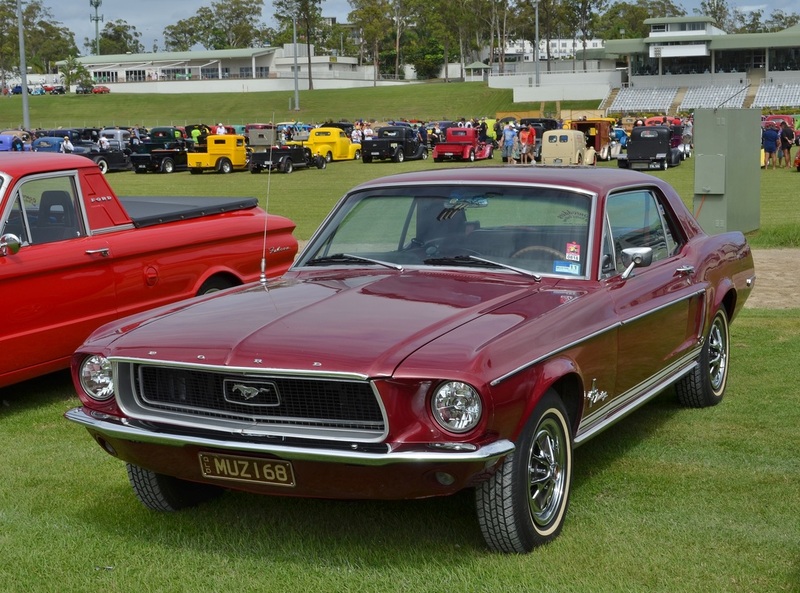 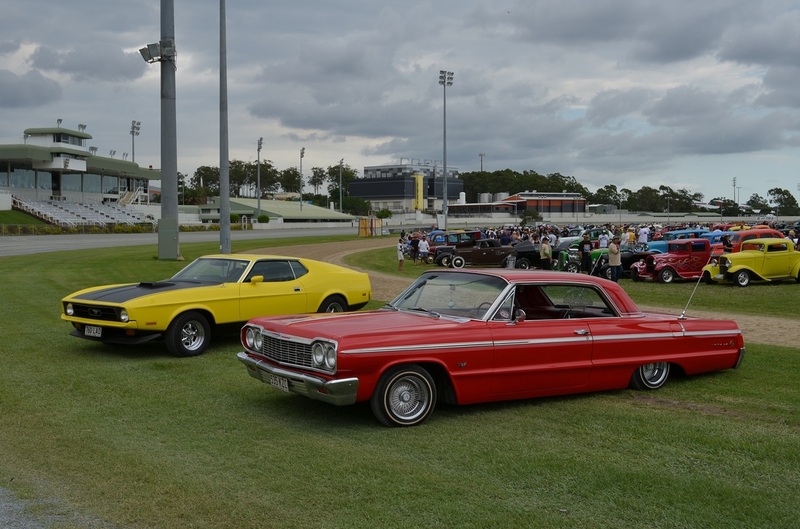 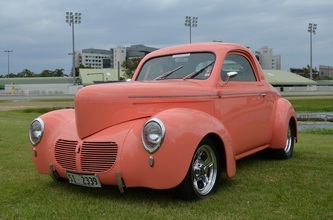 There were, by reports, 1018 rods entered with a great number of spectacular rides. 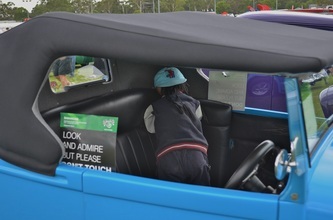 This year the driving events were held on grass which disappointed some but those who had a go really enjoyed themselves including Lisa-Marie who did the slalom and washed the car afterwards even when 6 months pregnant. 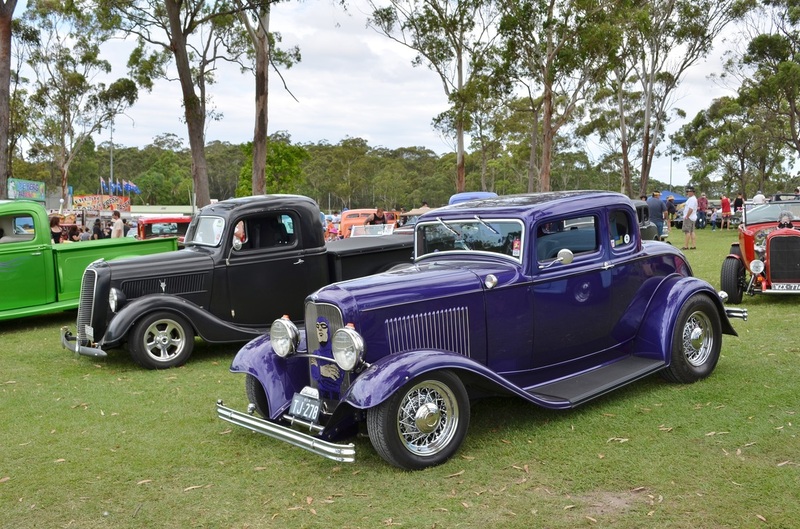 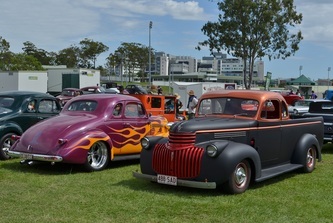 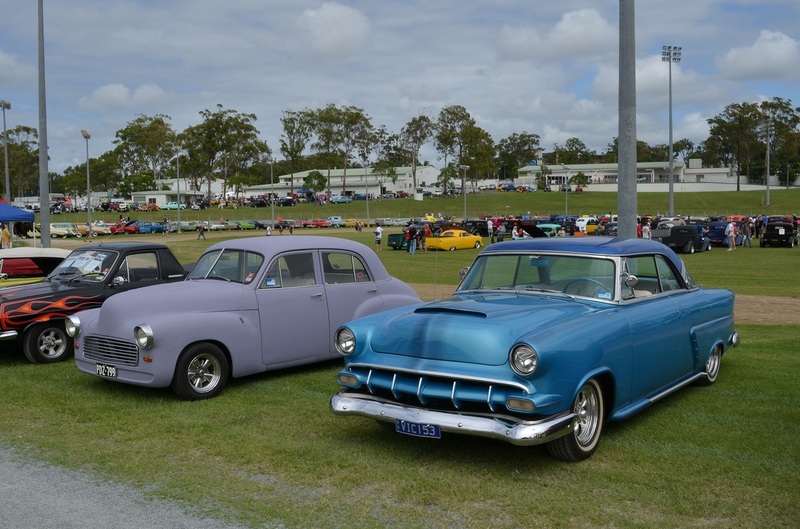 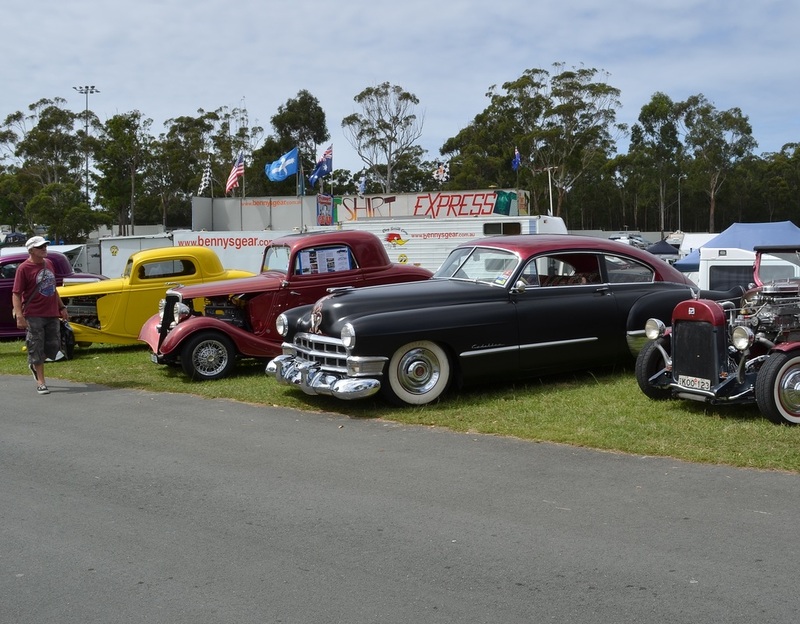 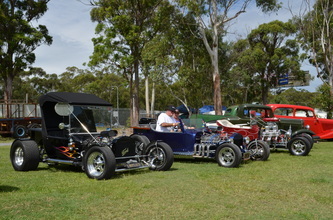 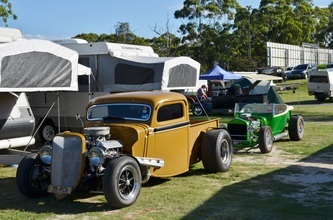 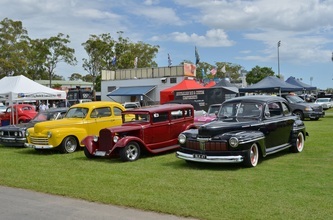 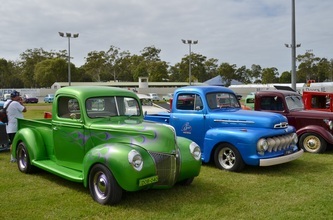 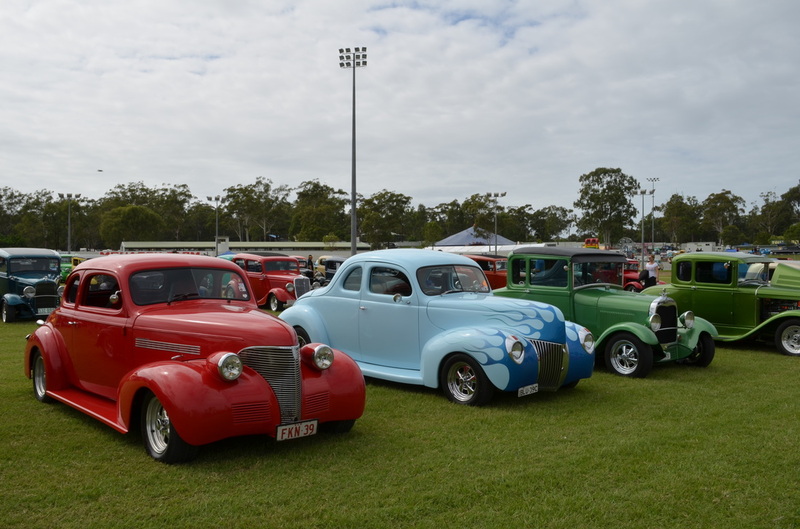 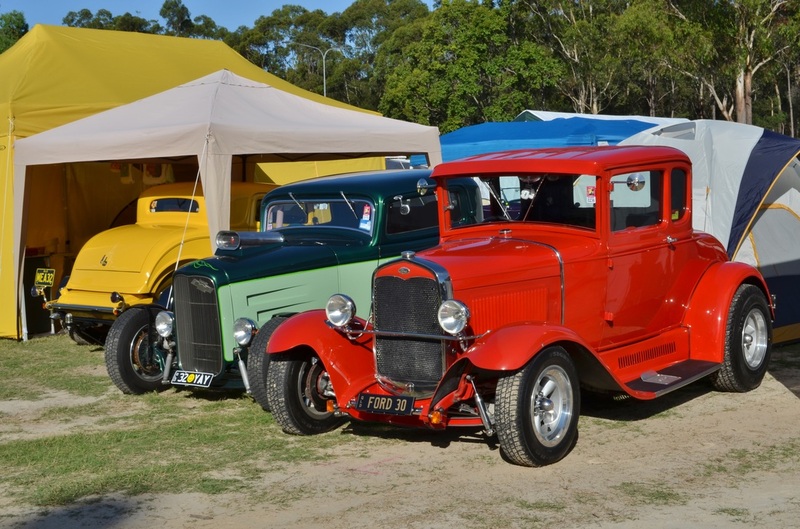 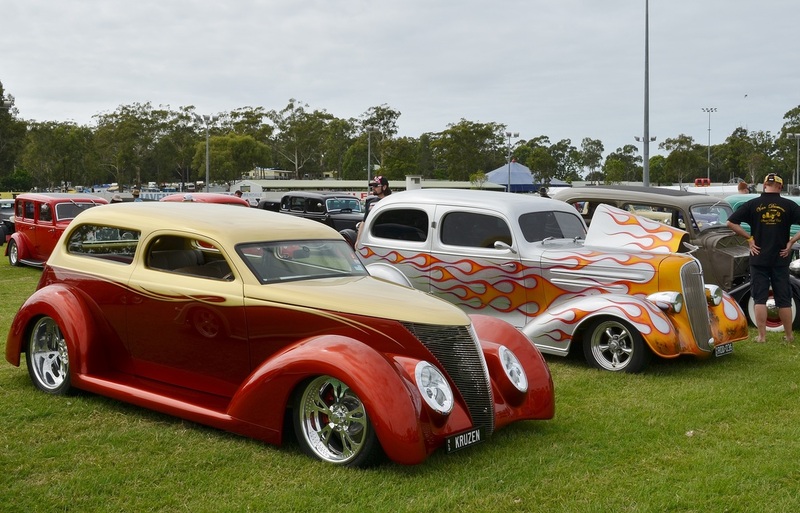 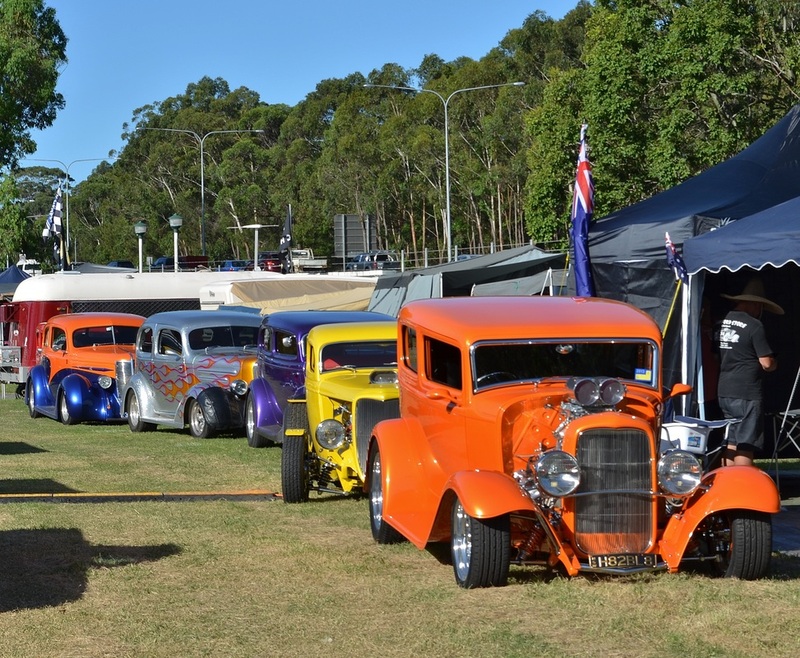 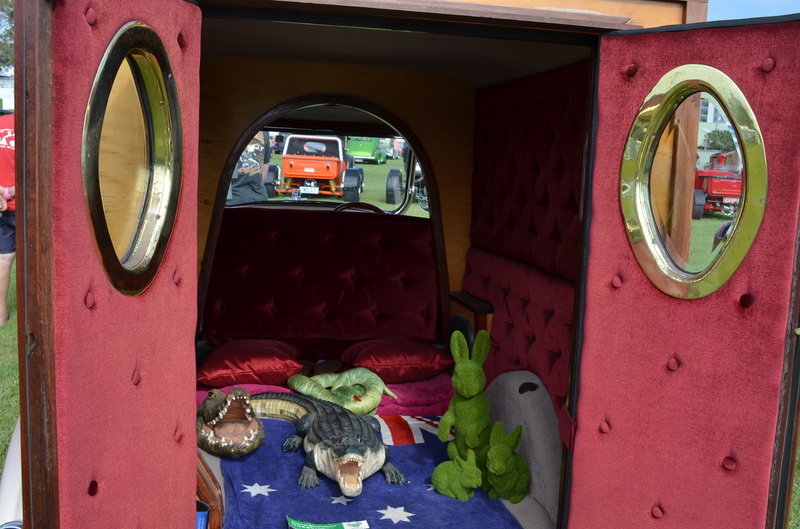 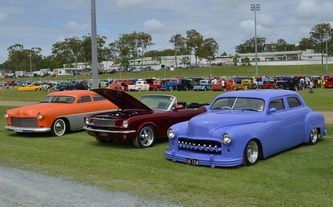 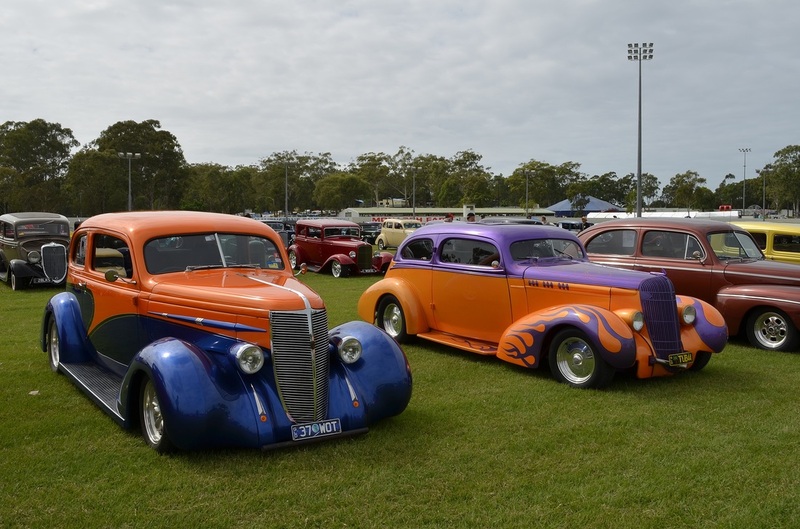 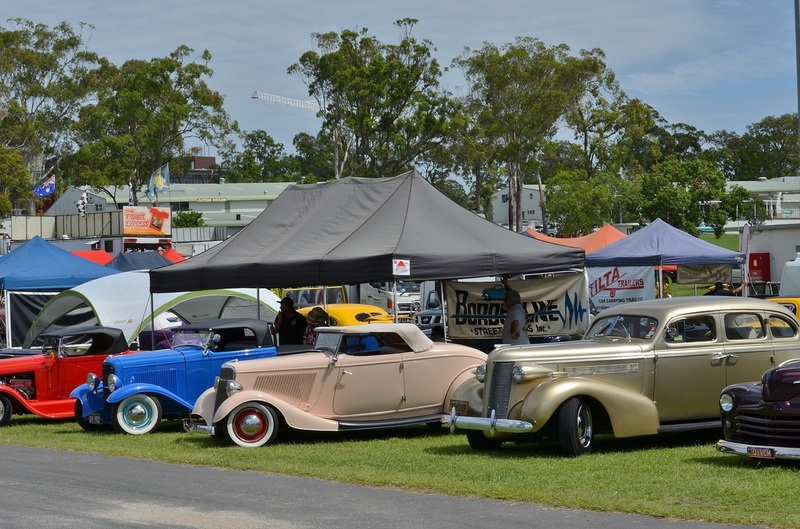 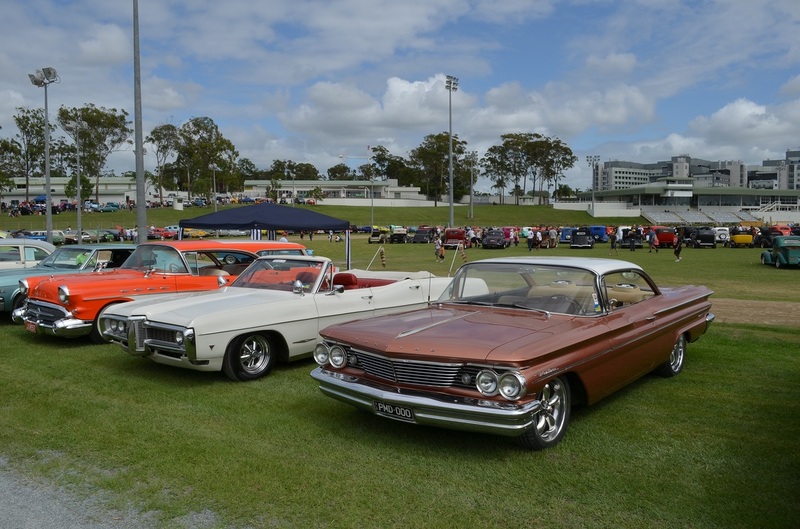 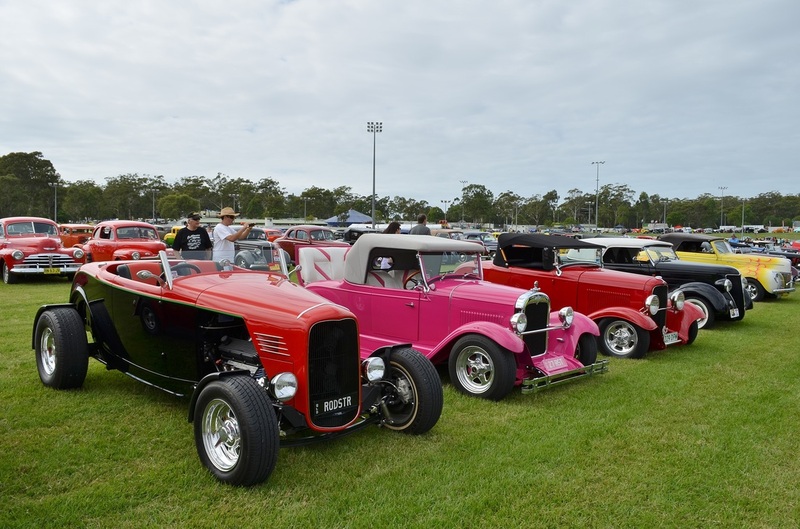 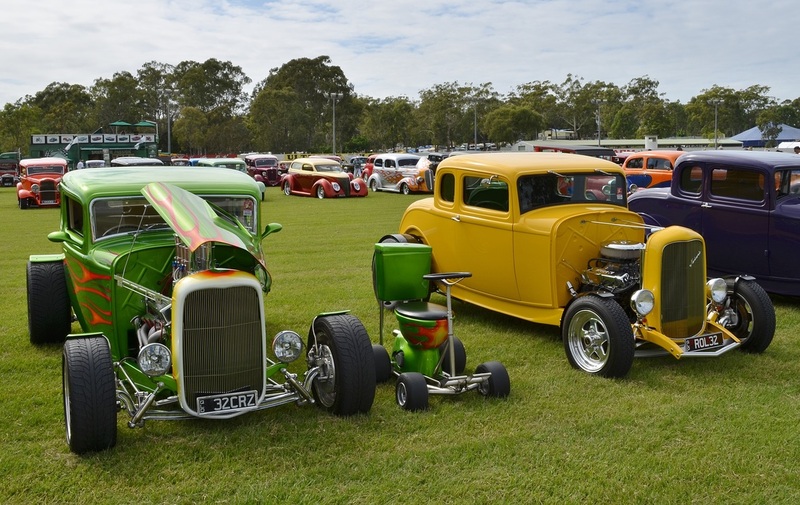 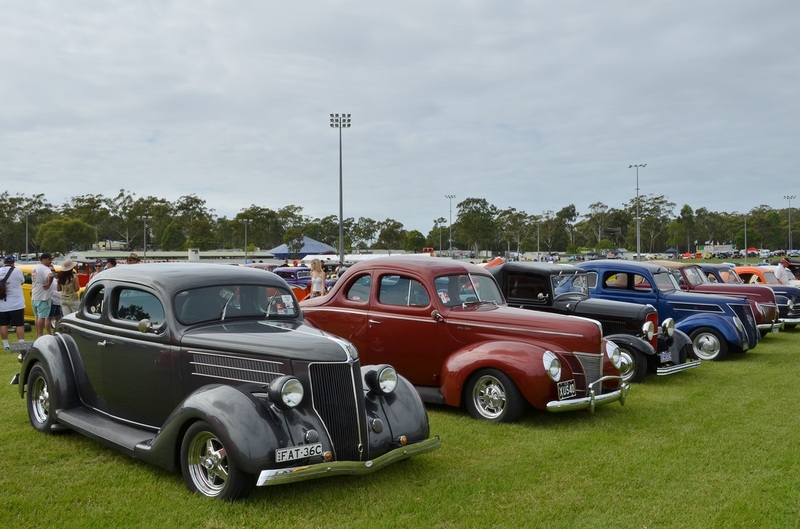 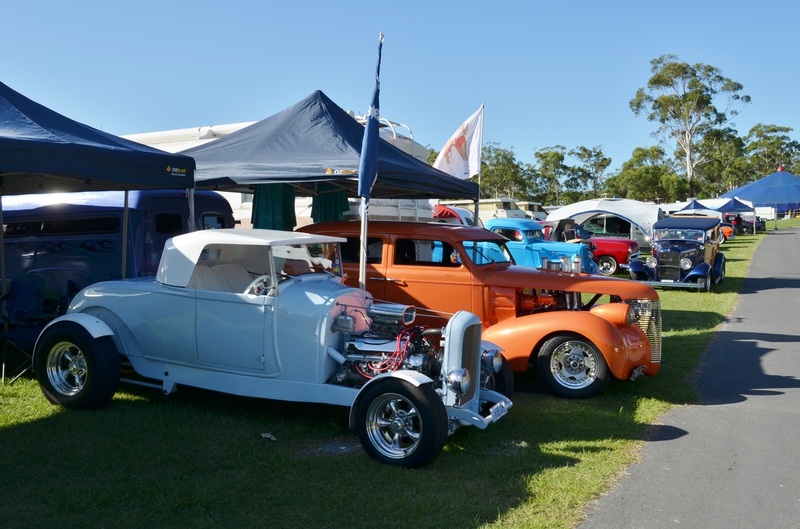 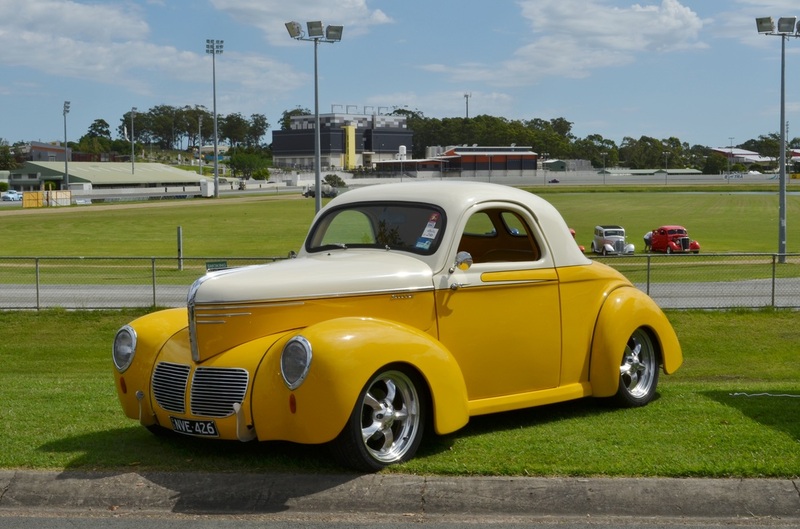 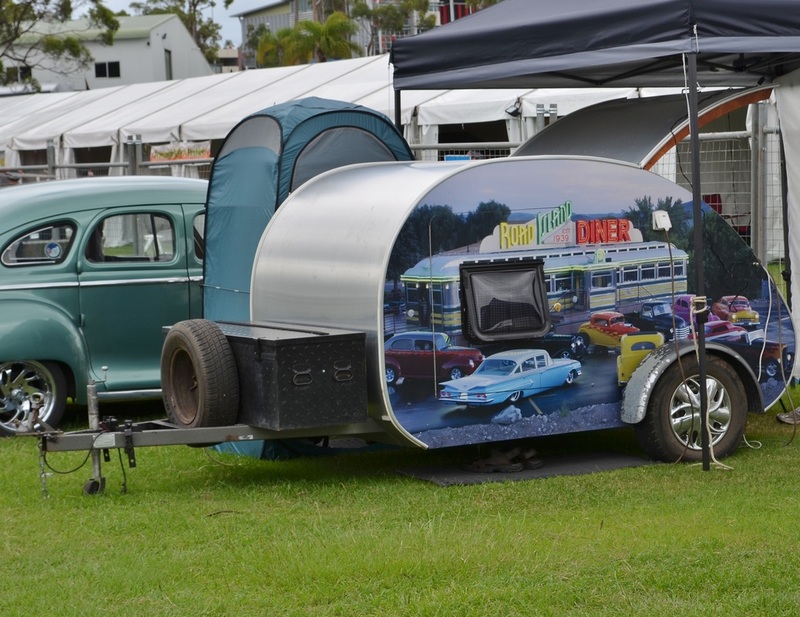 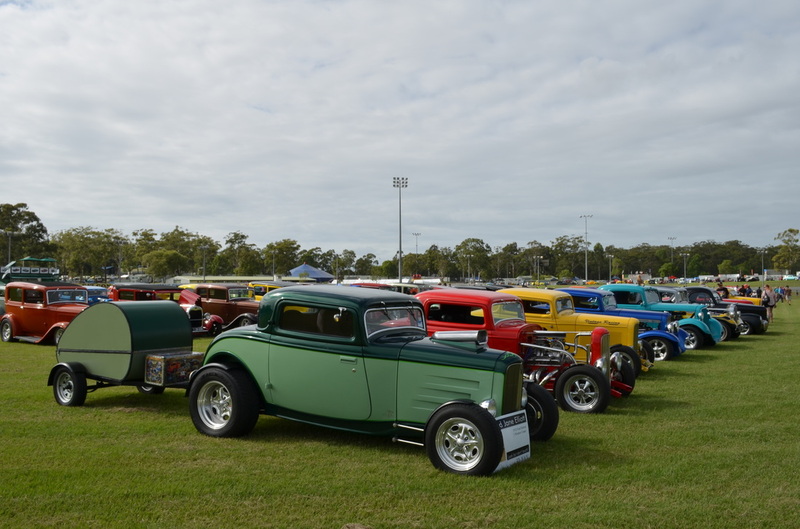 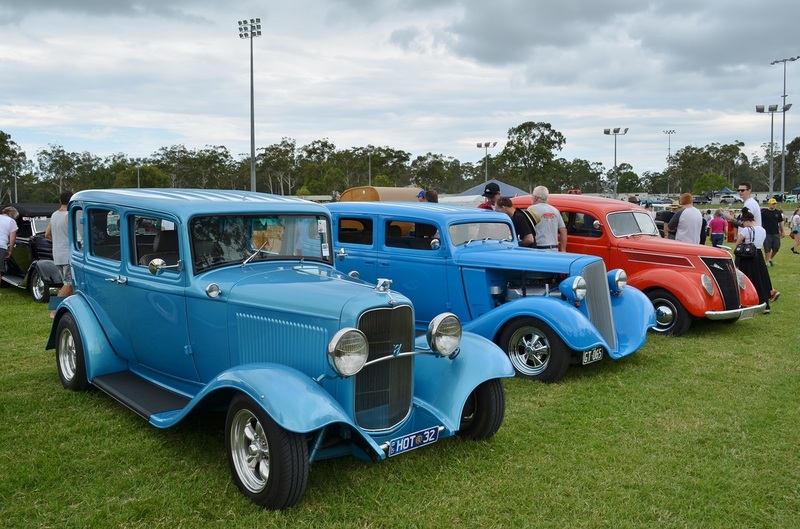 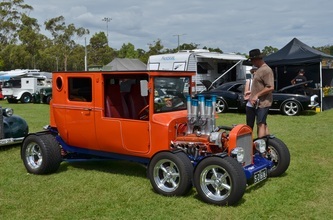 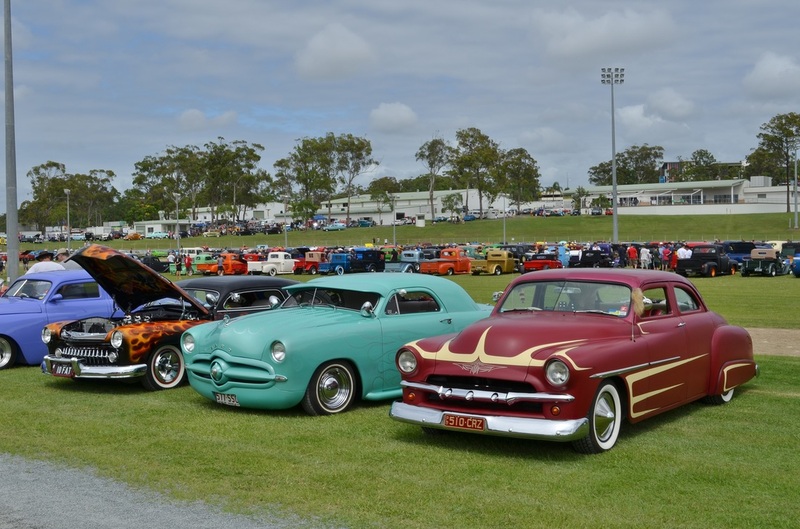 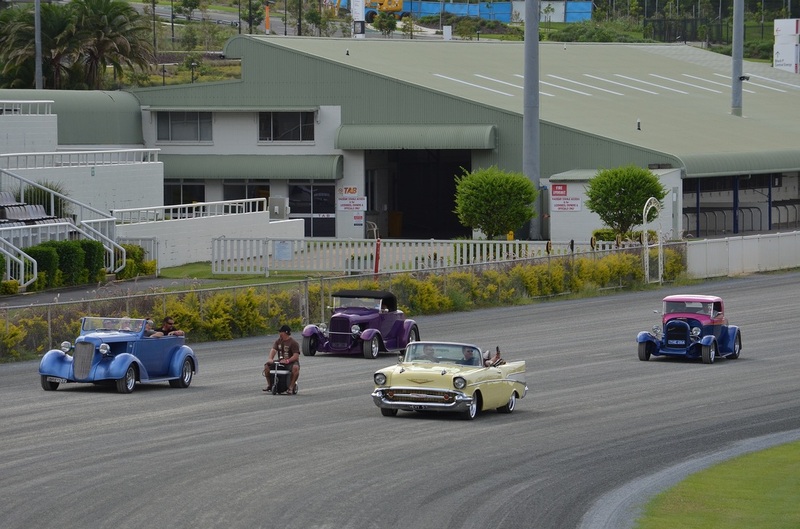 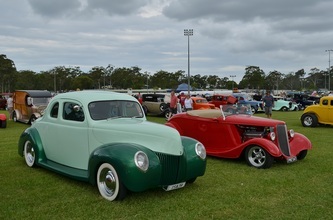 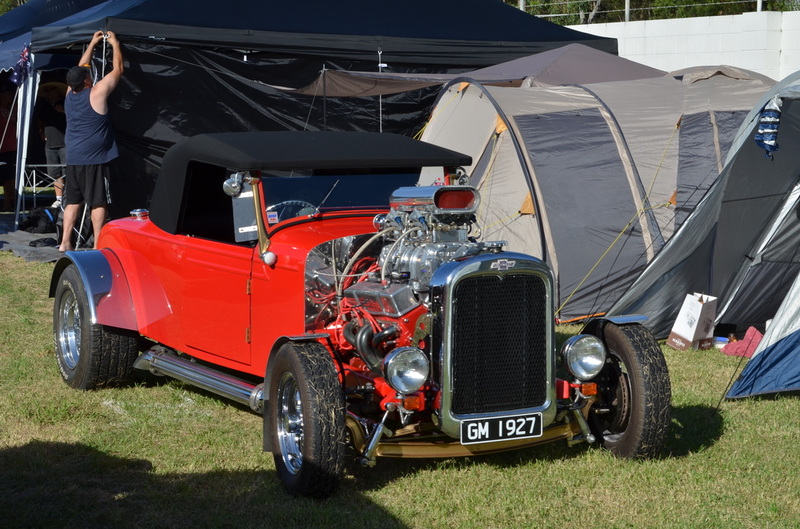 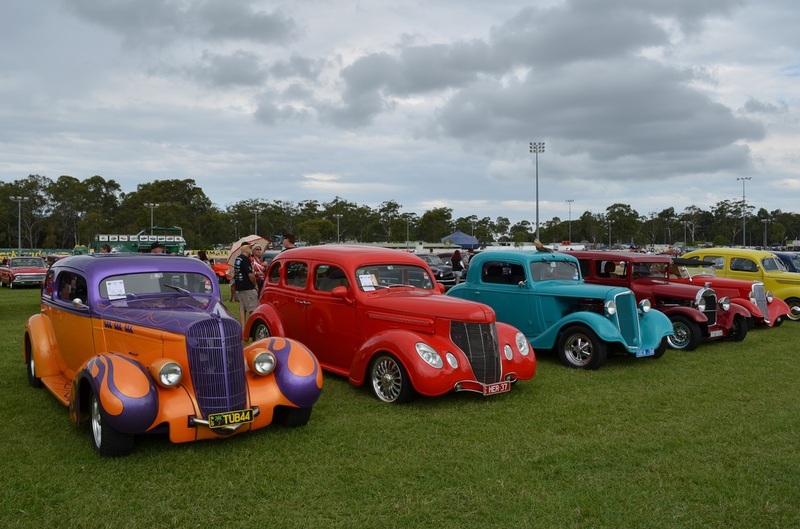 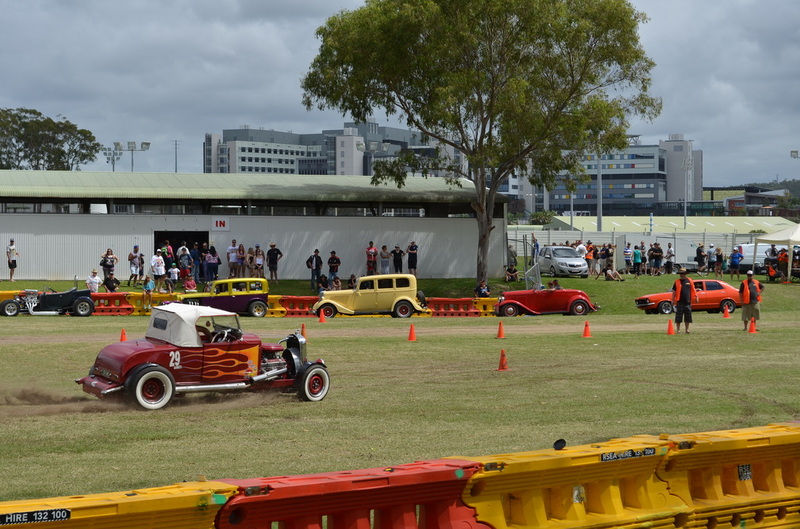 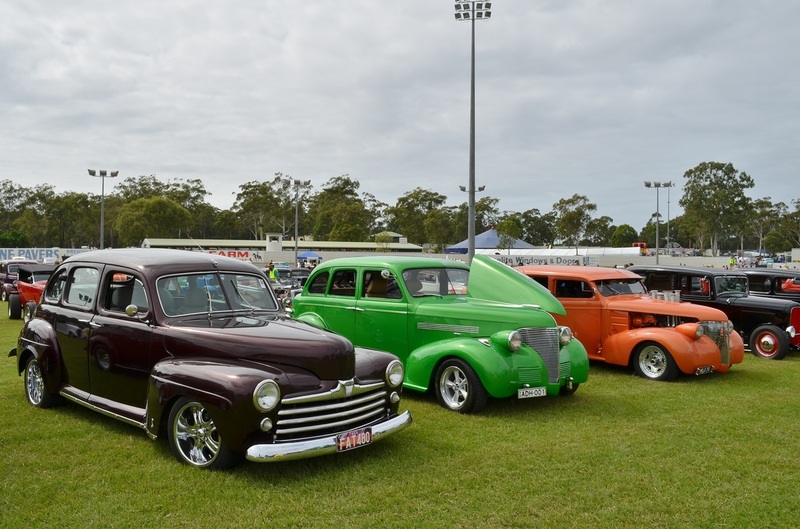 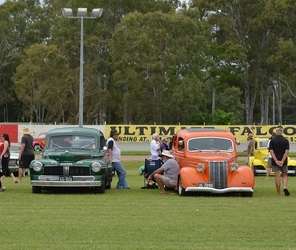 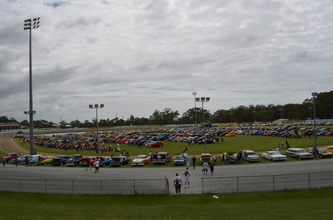 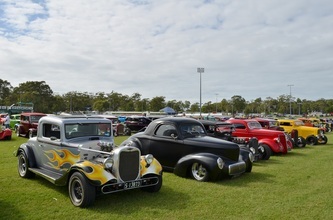 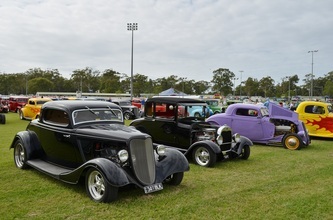 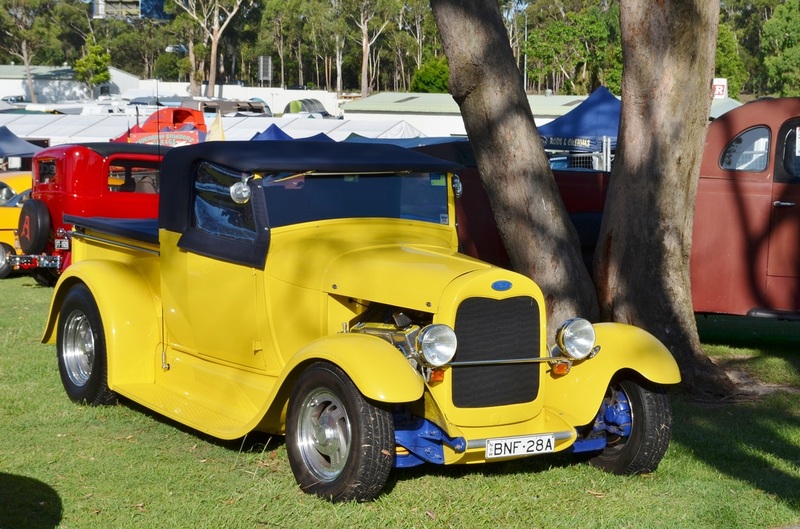 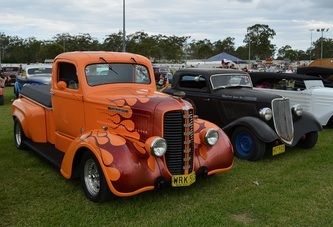 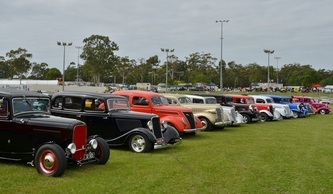 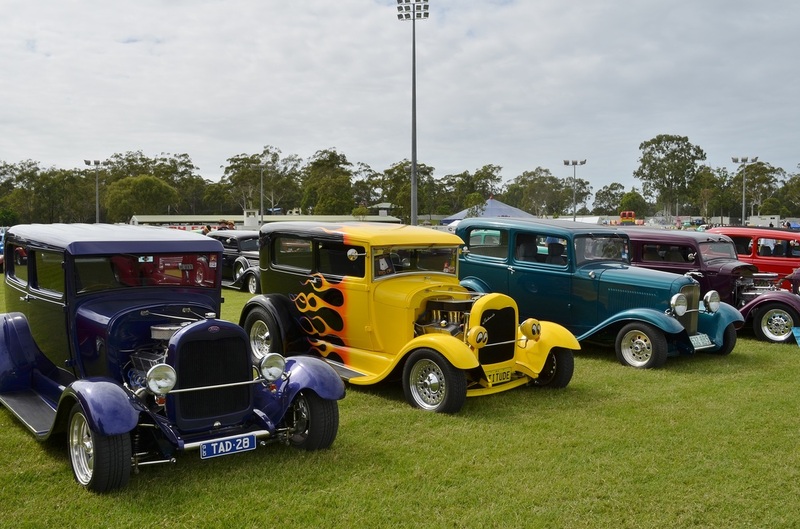 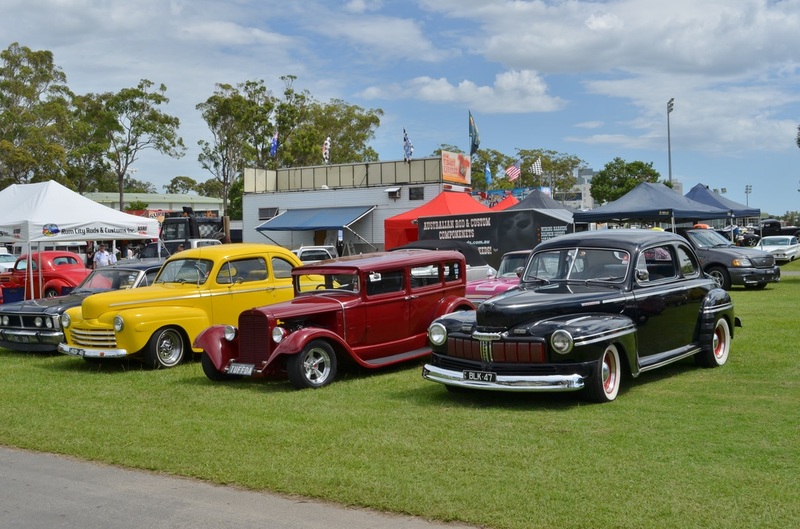 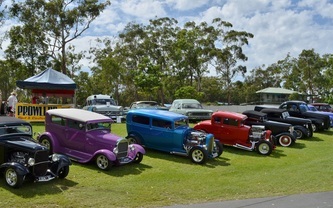 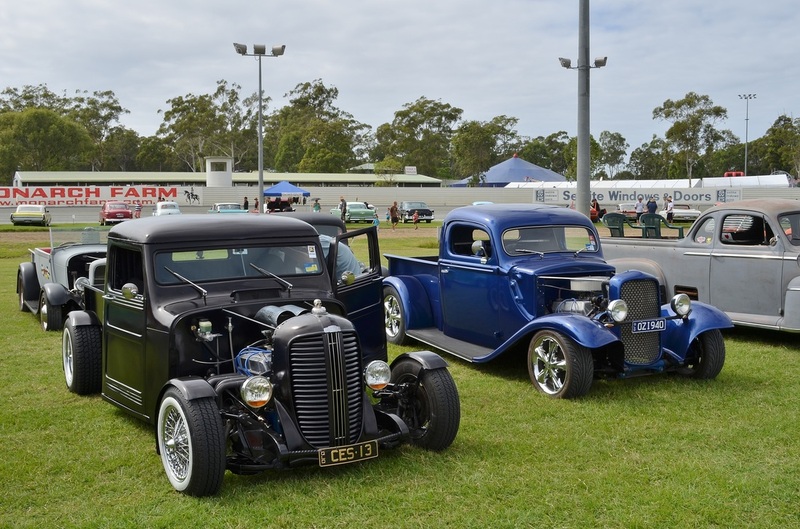 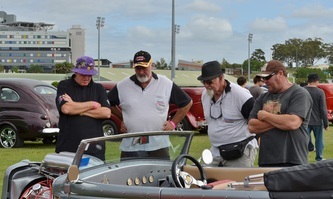 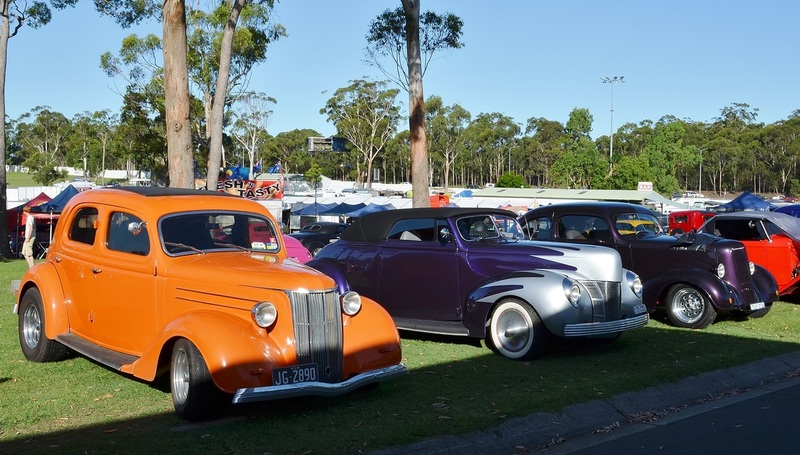 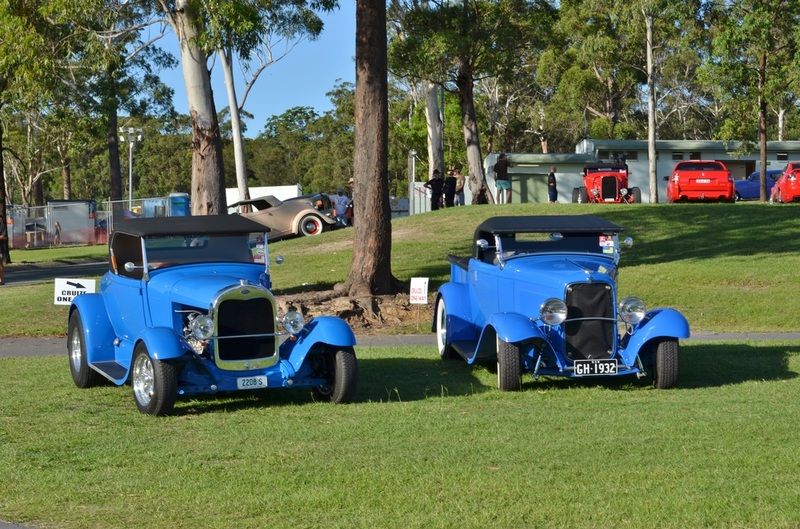 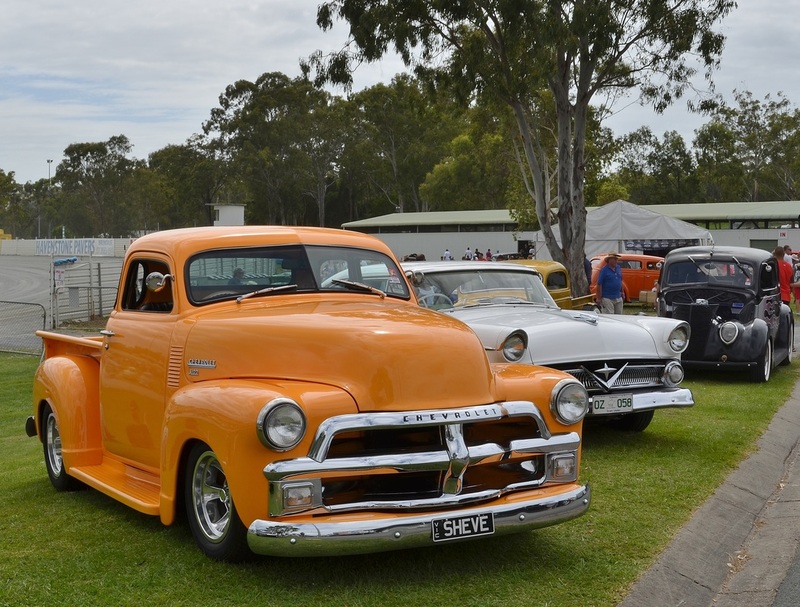 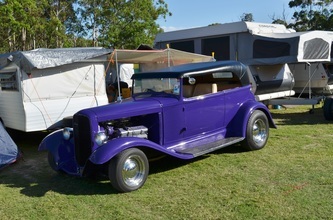 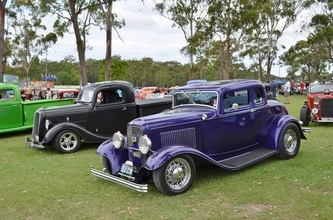 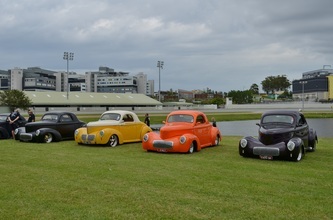 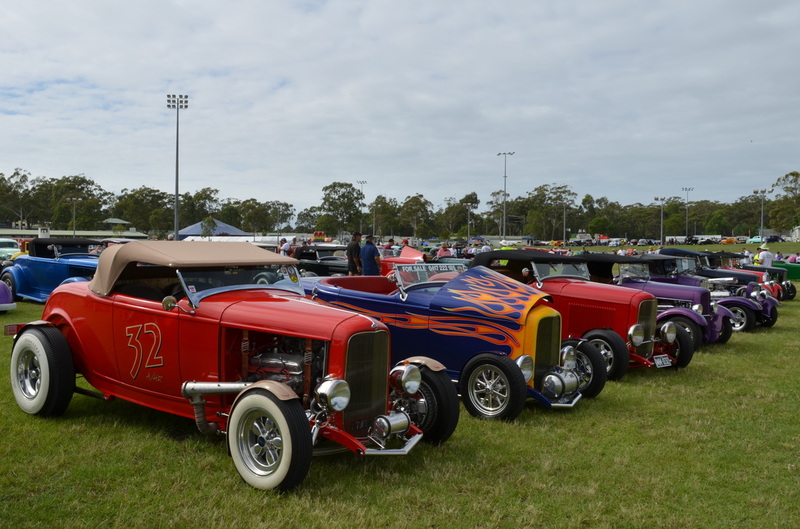 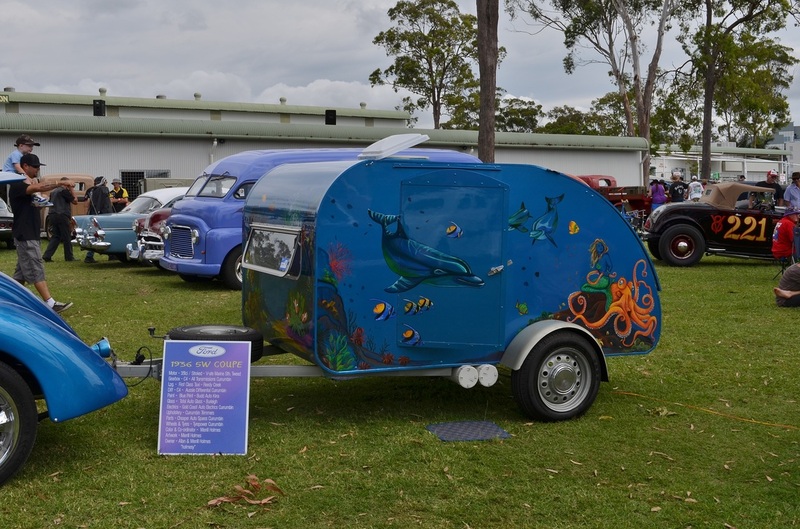 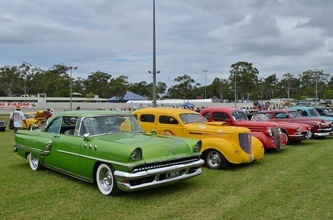 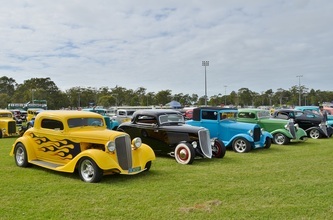 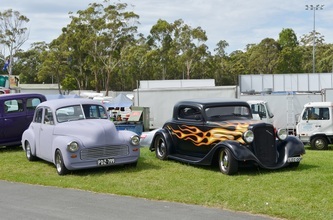 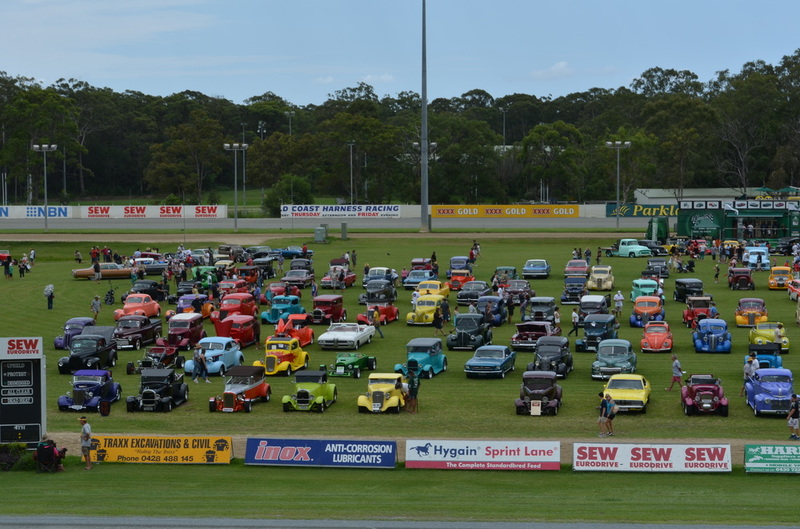 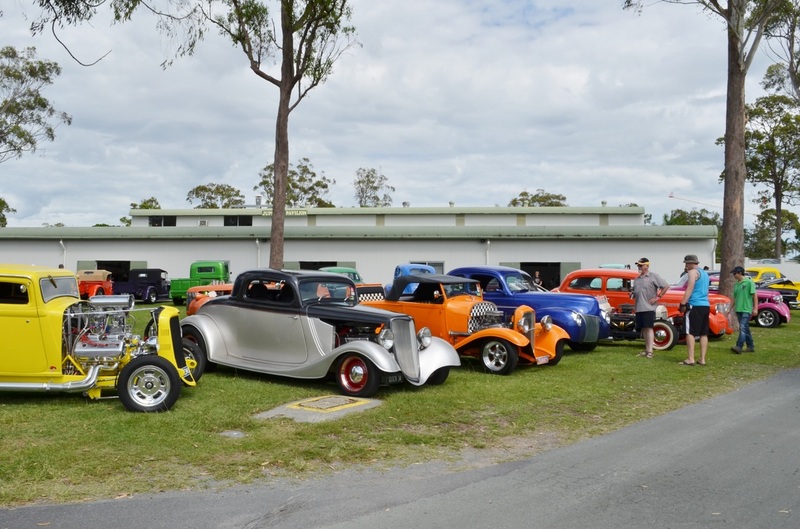 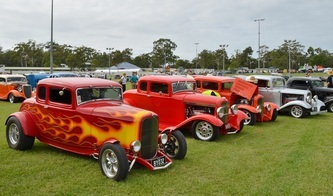 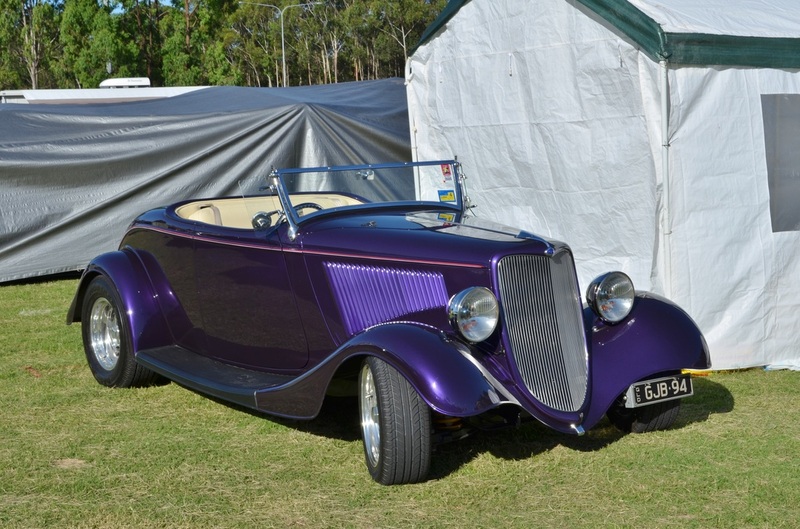 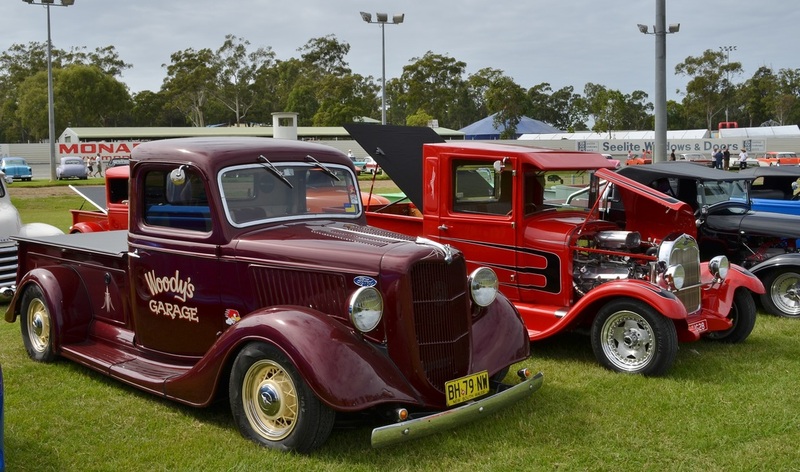 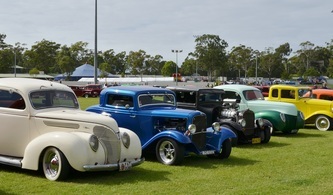 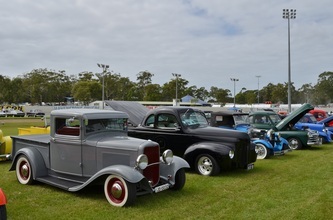 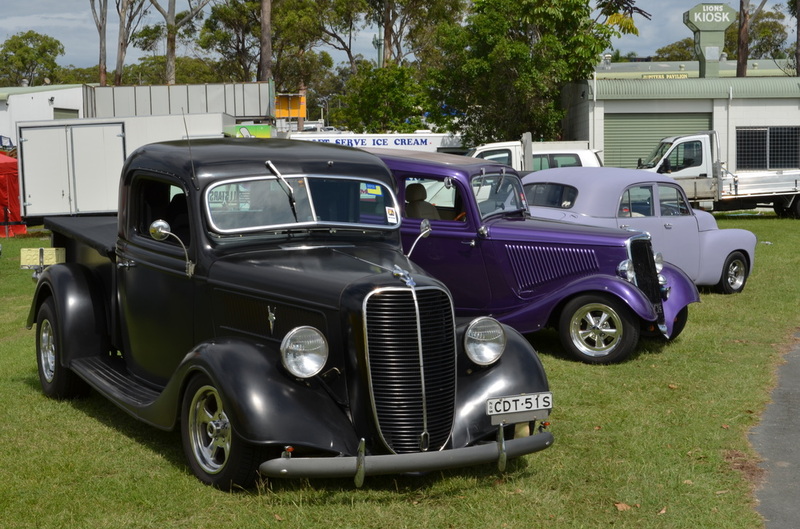 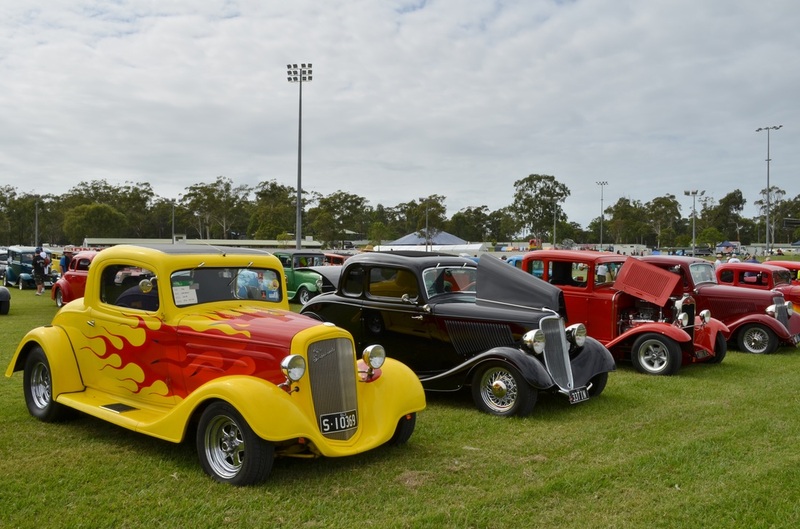 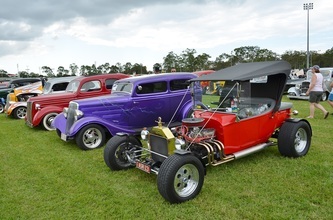 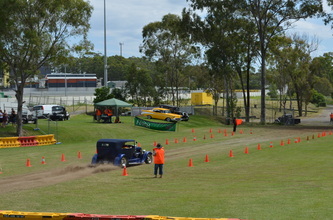 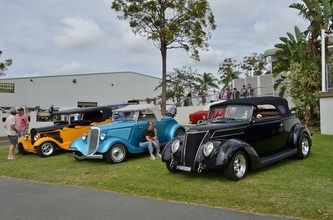 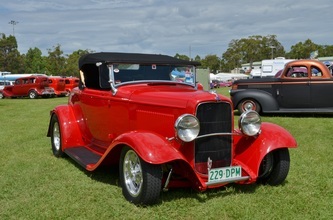 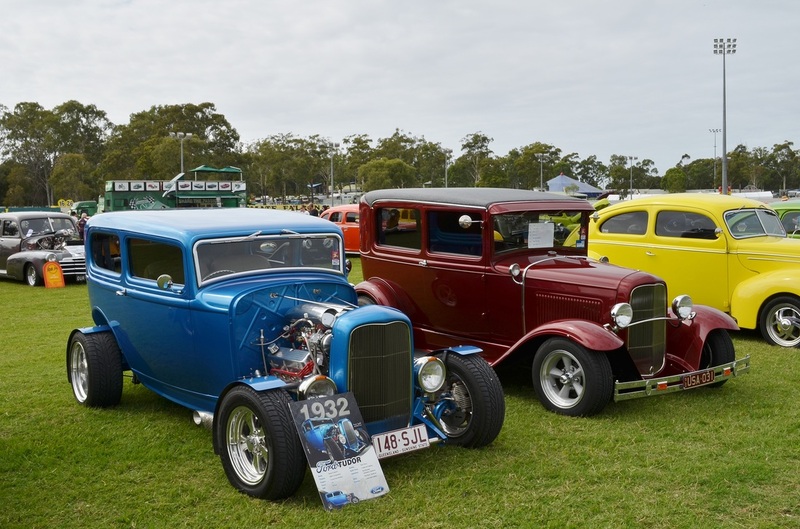 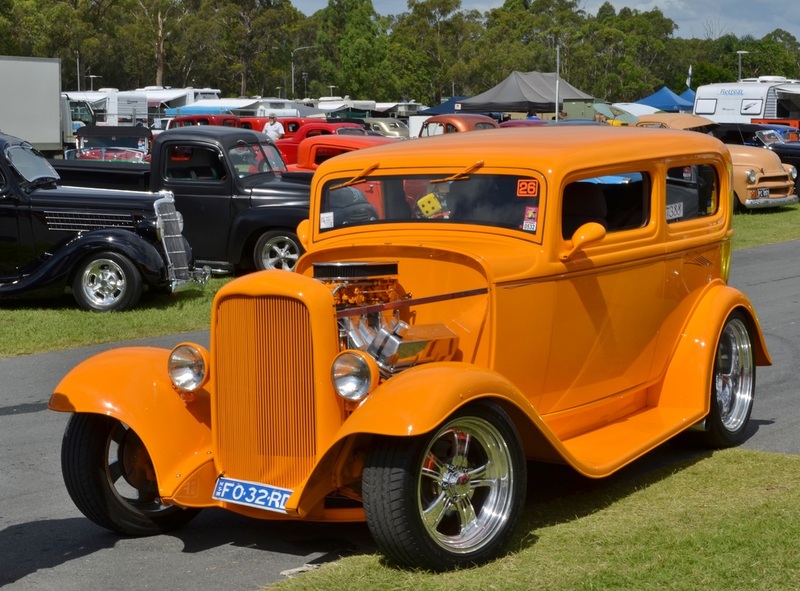 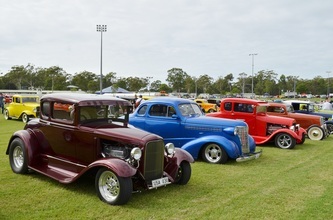 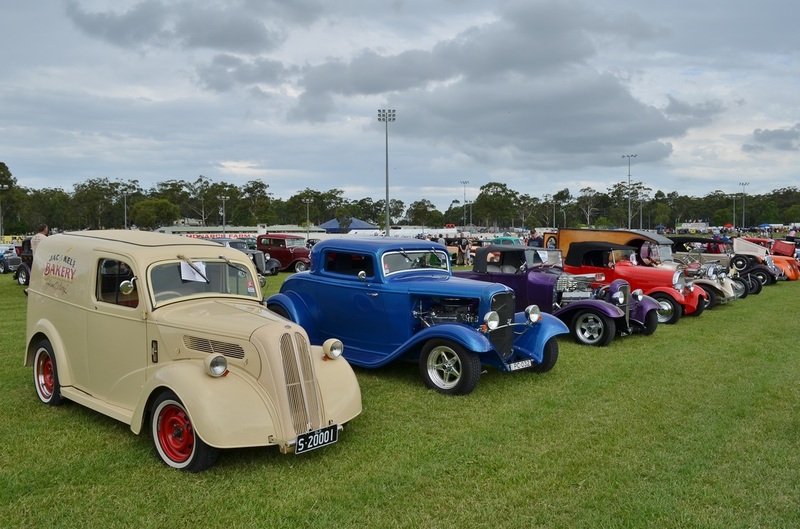 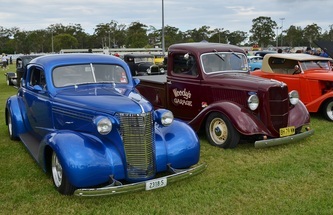 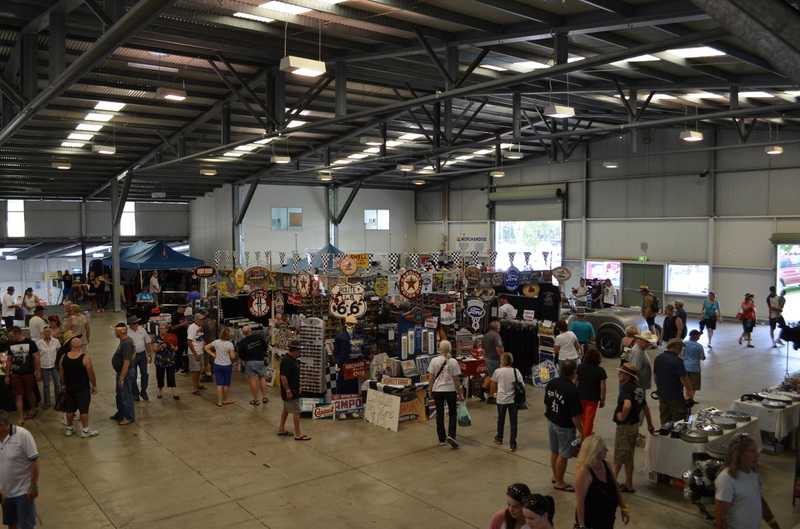 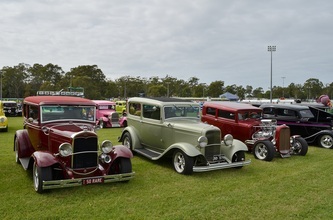 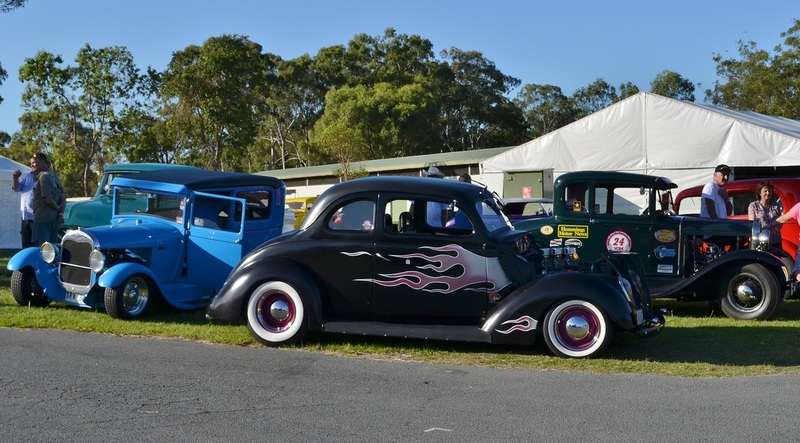 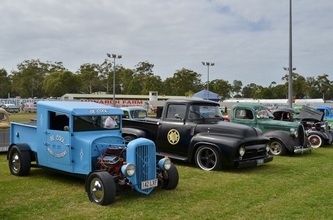 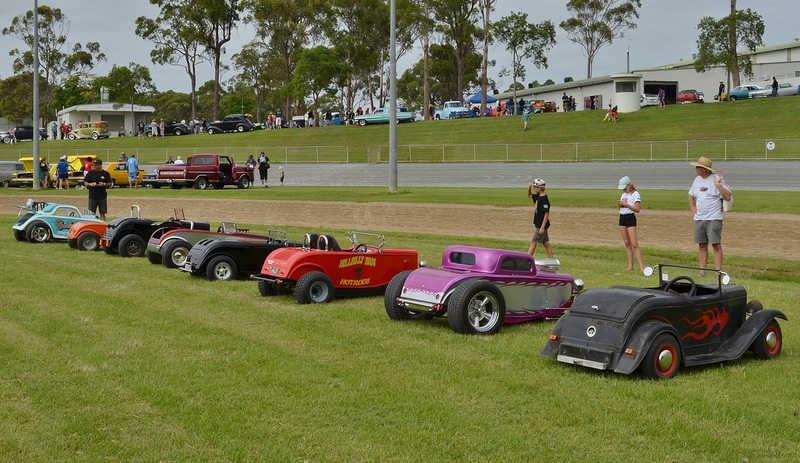 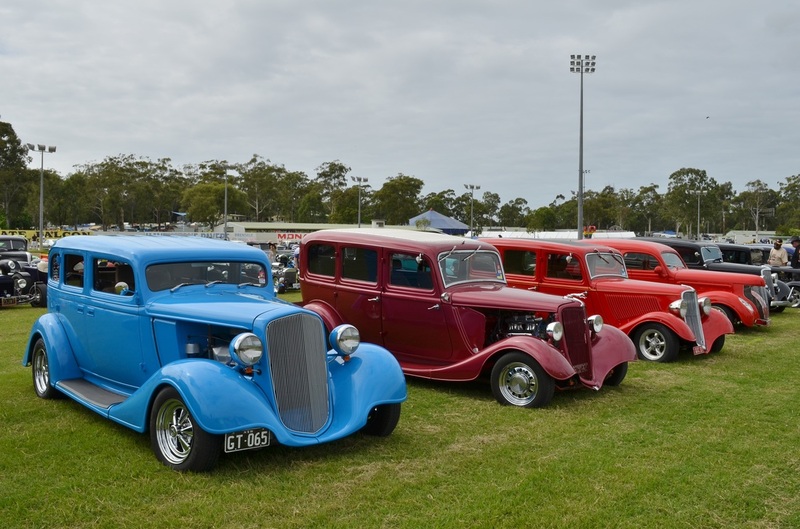 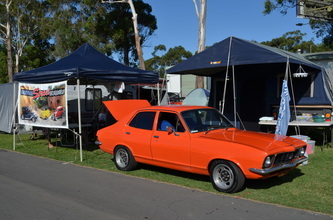 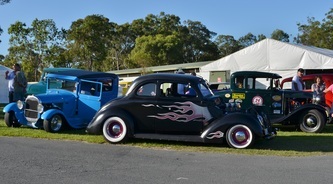 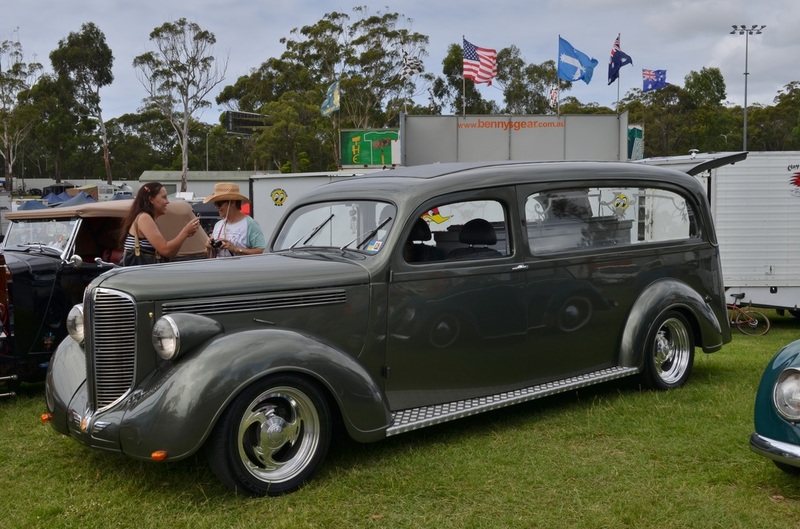 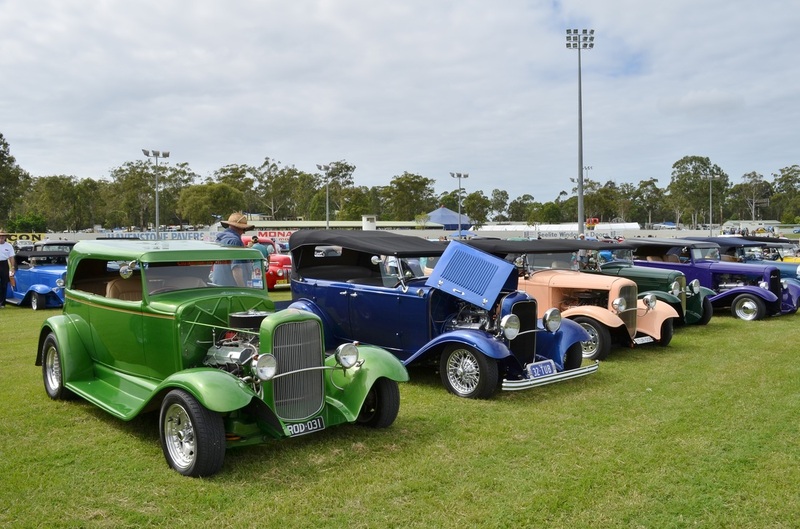 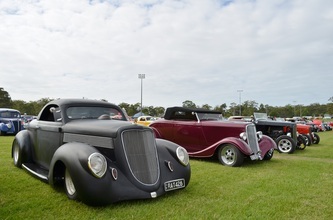 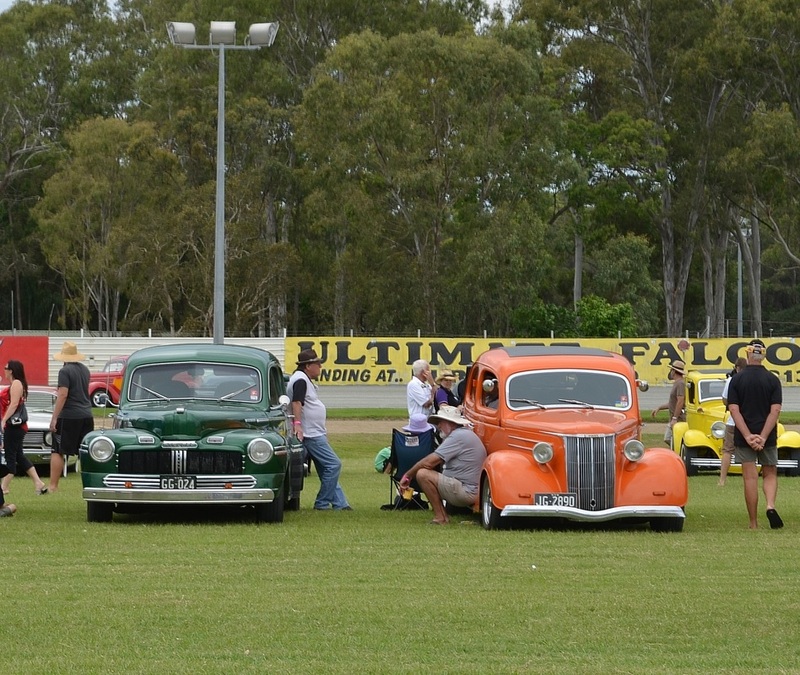 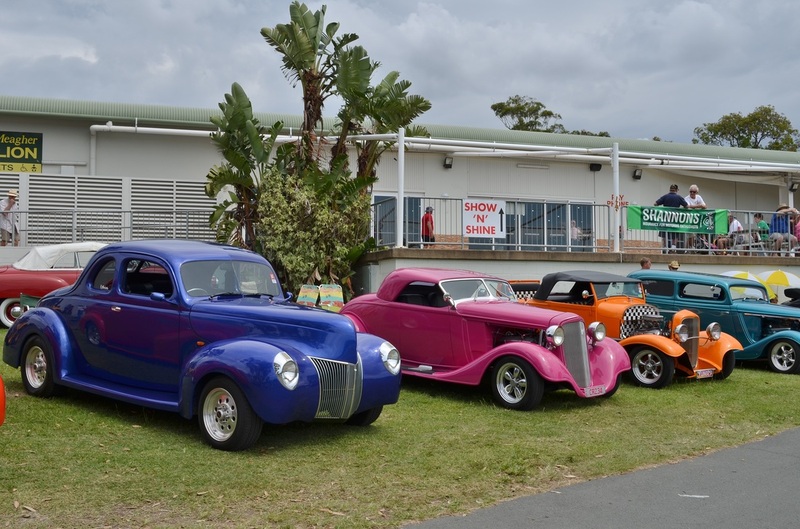 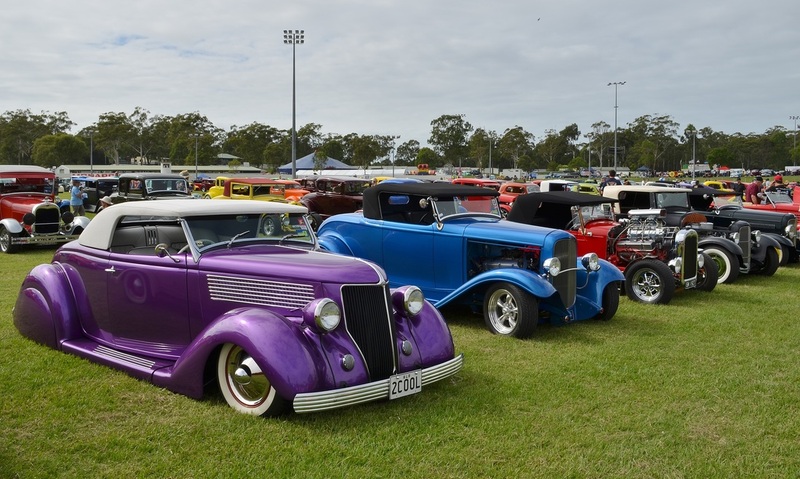 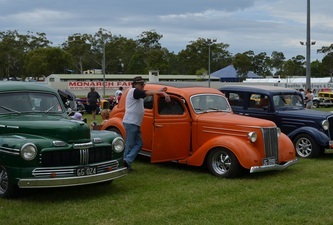 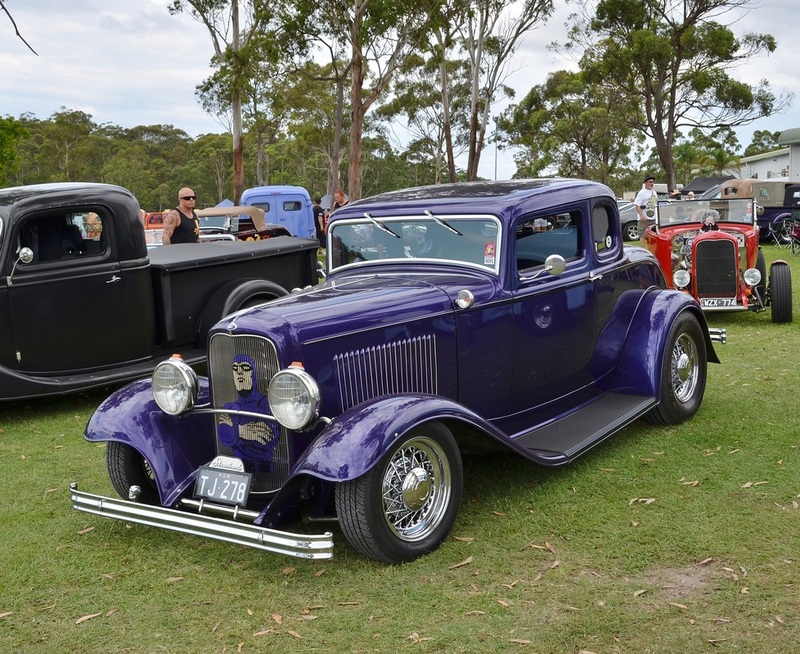 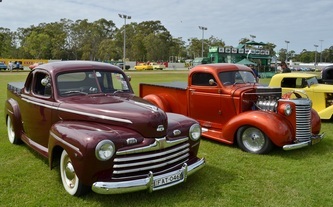 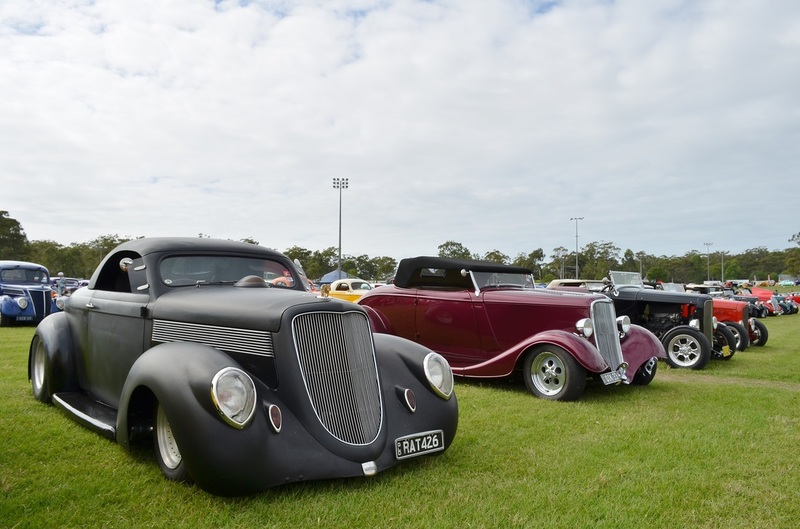 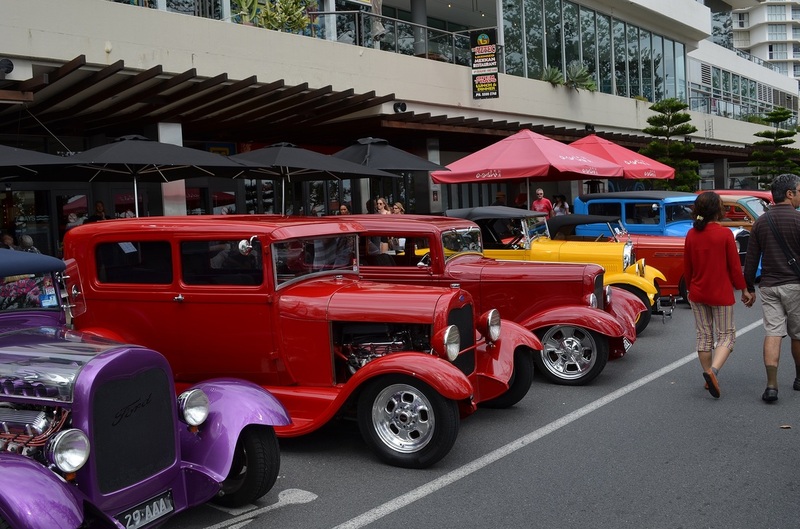 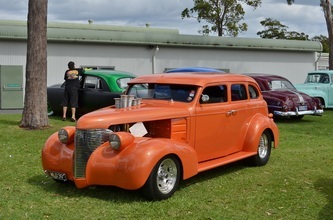 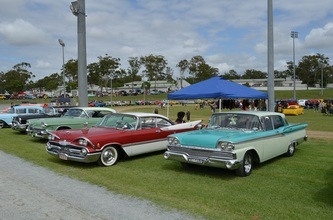 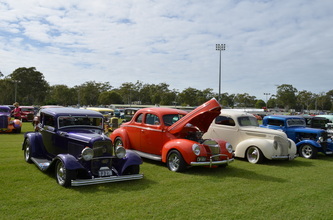 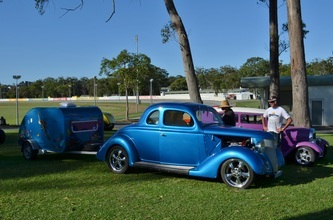 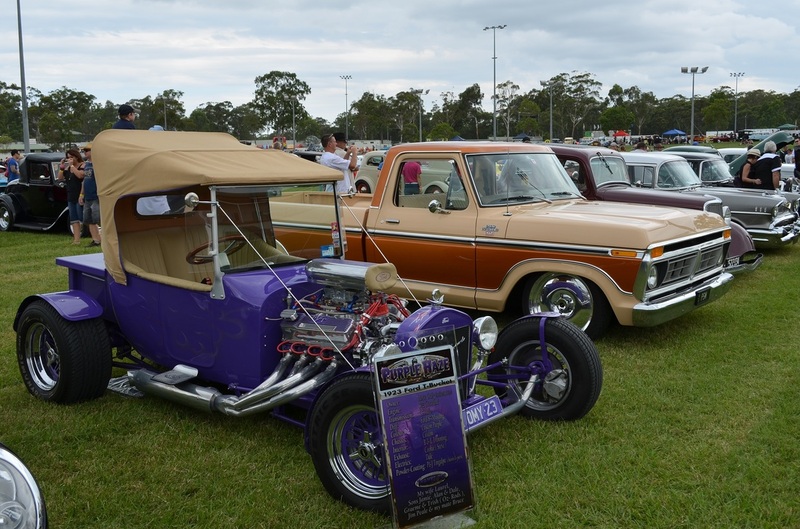 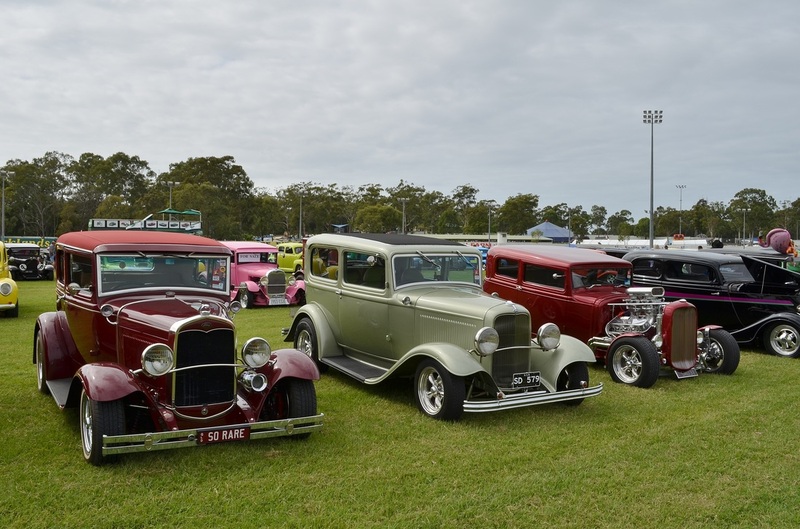 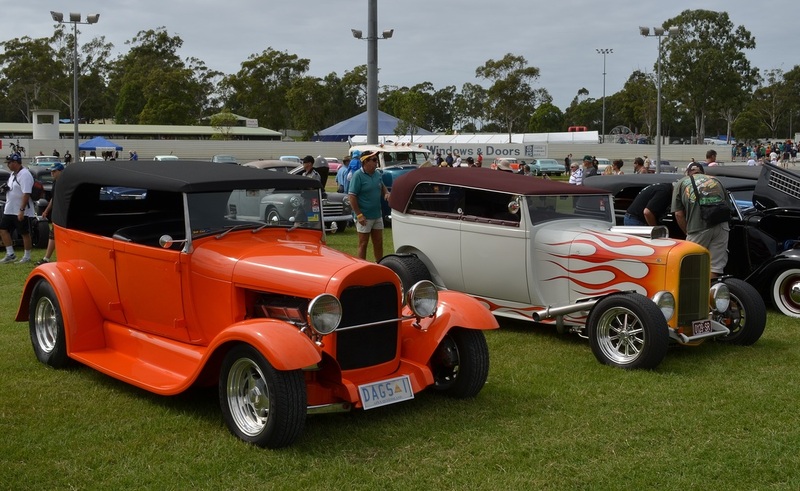 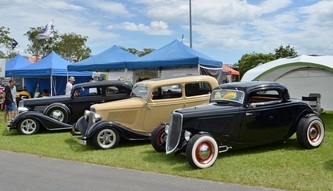 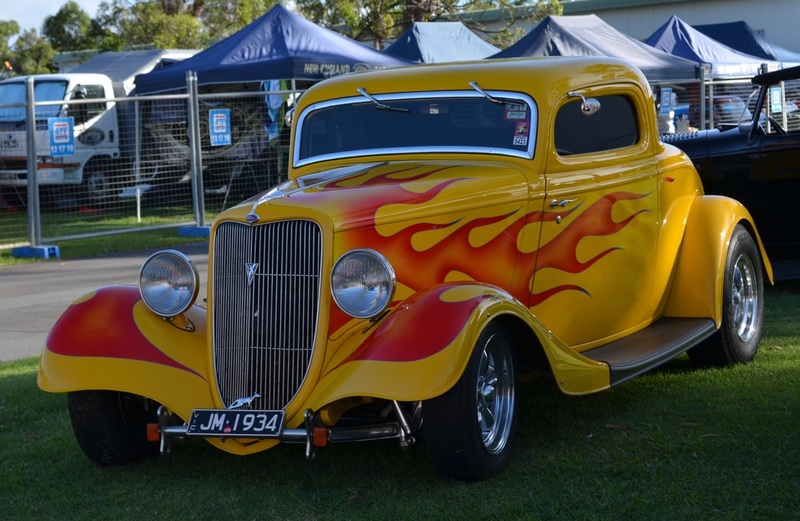 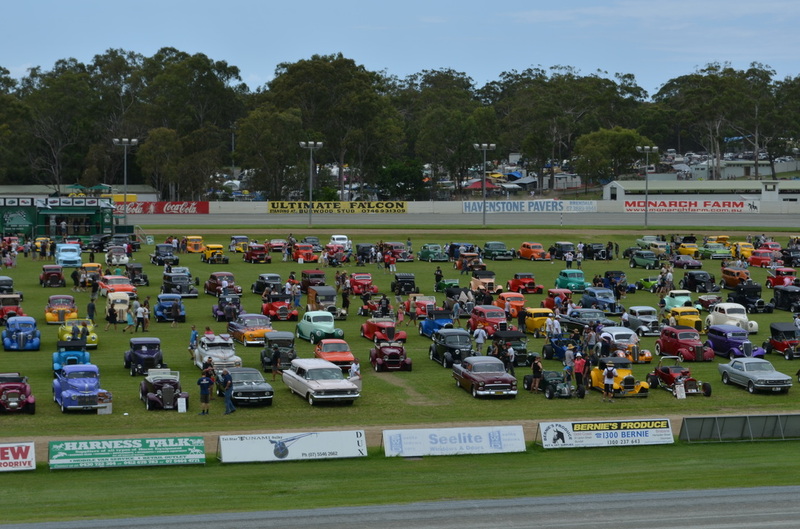 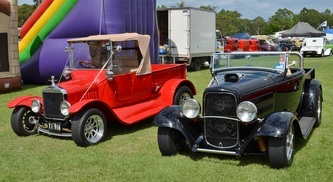 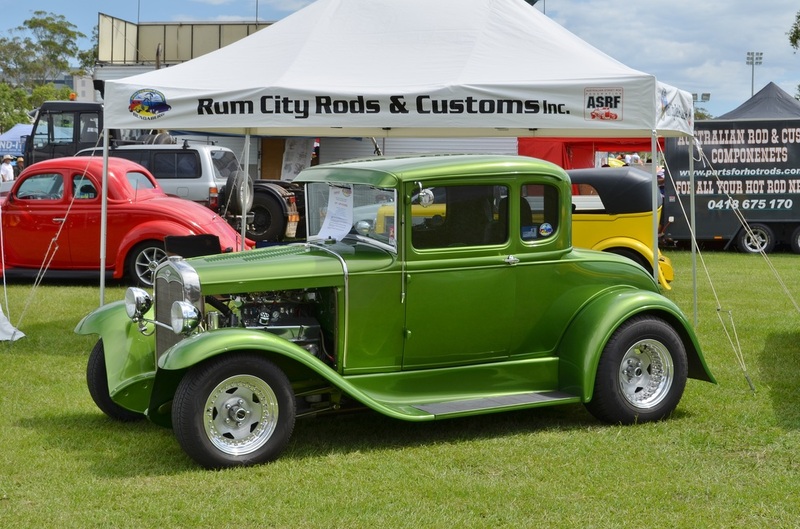 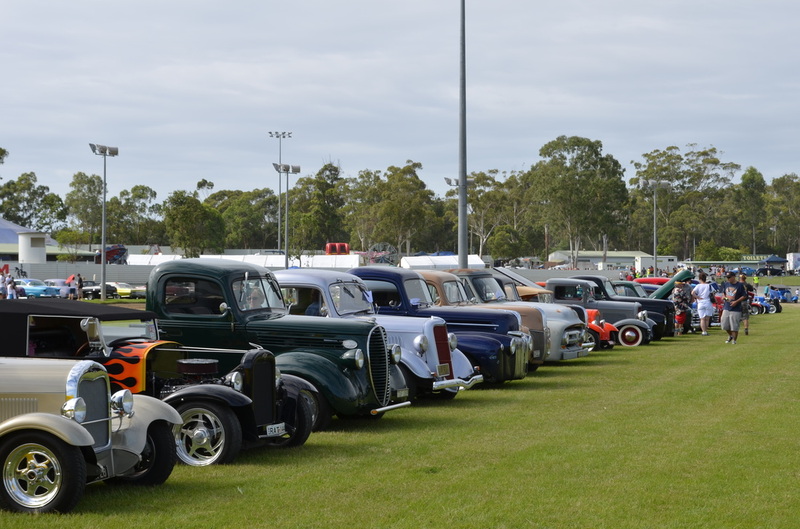 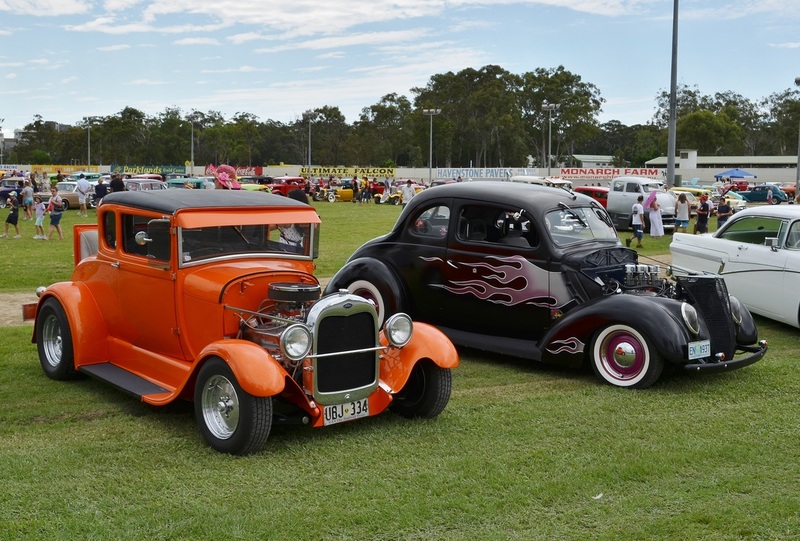 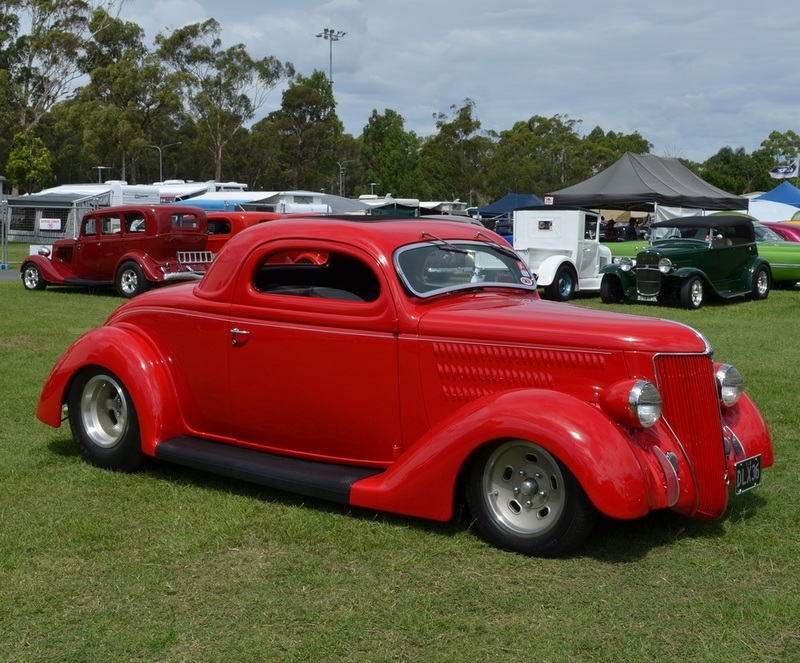 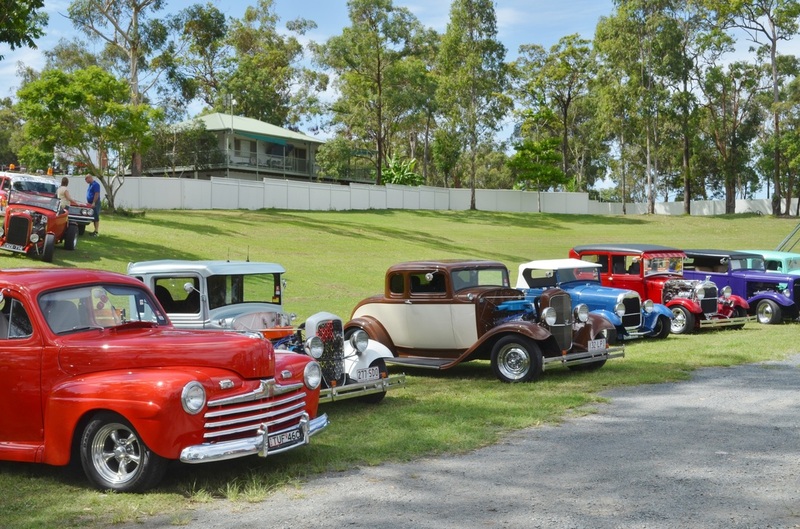 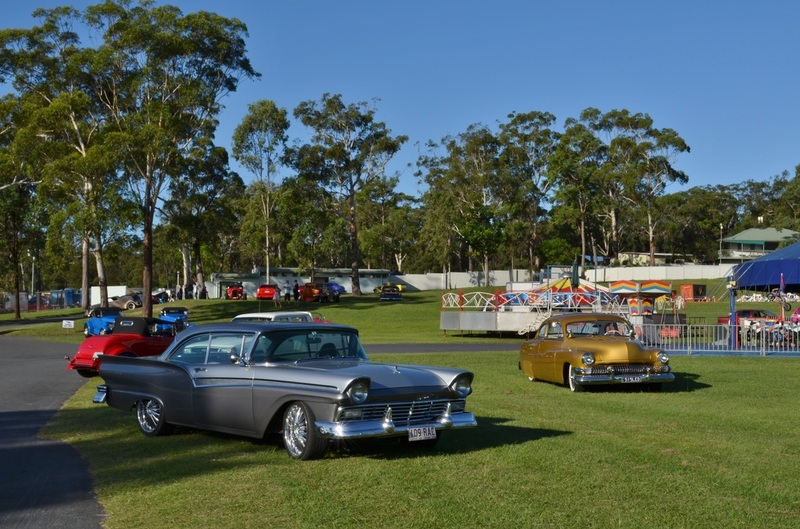 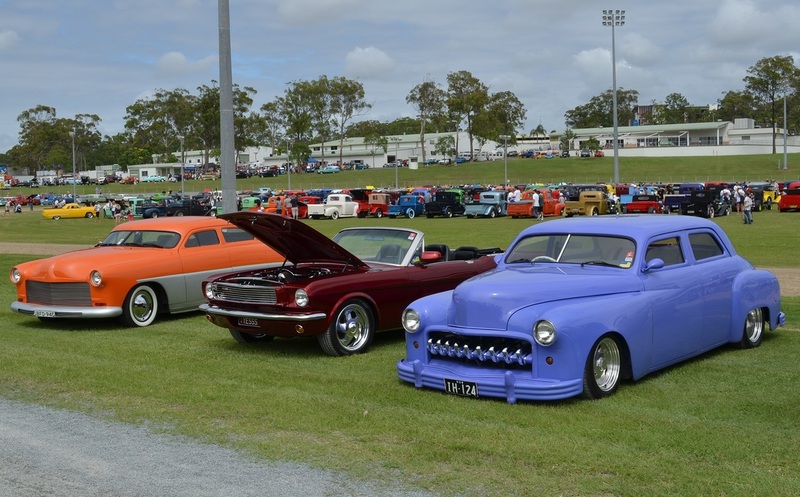 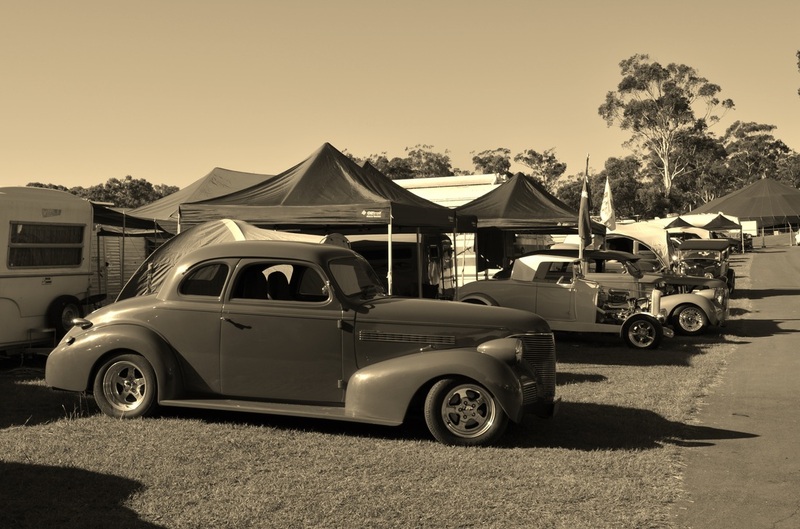 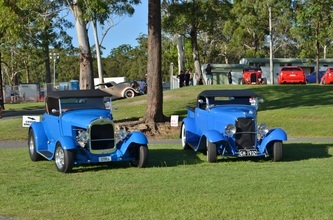 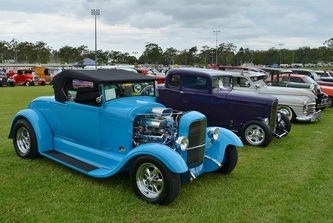 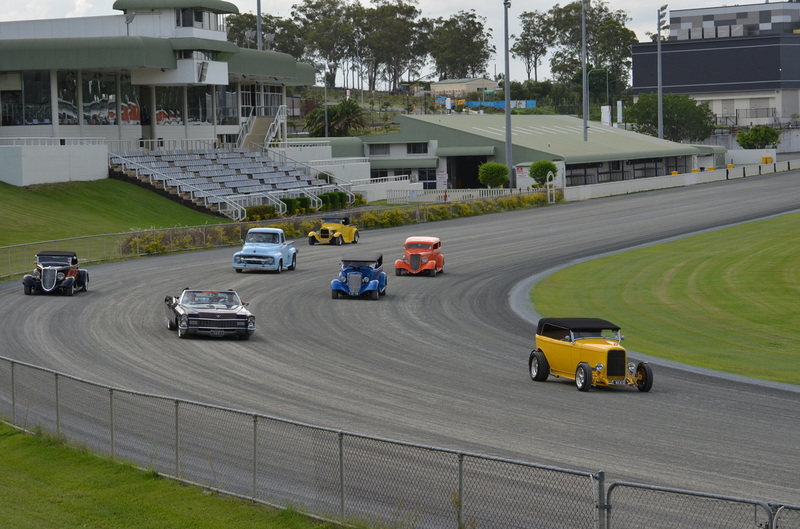 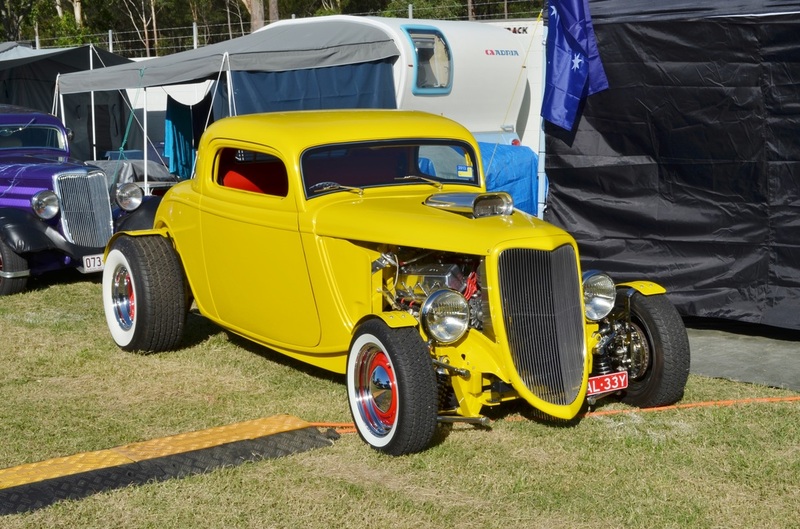 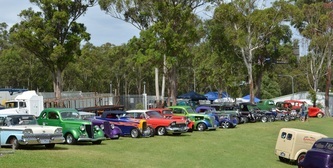 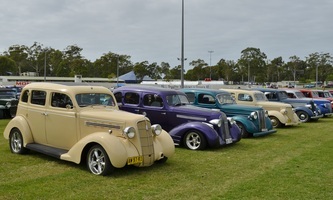 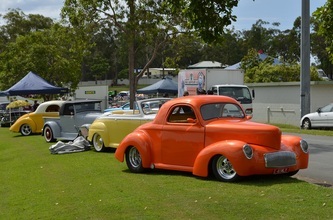 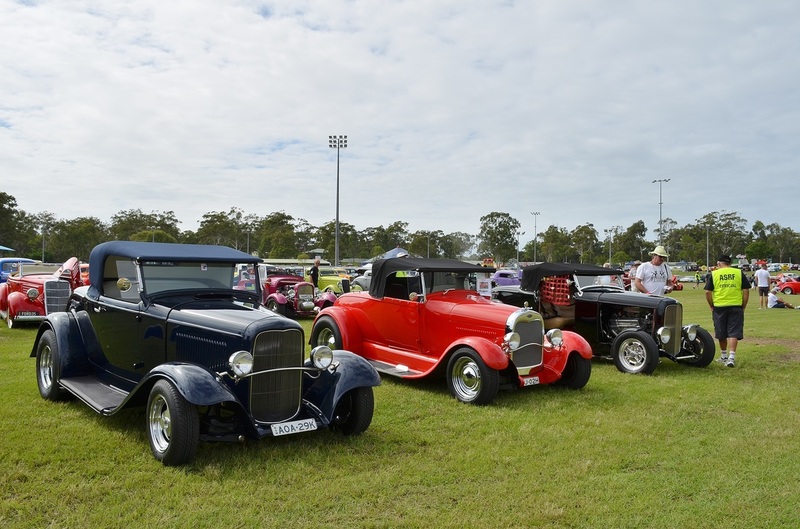 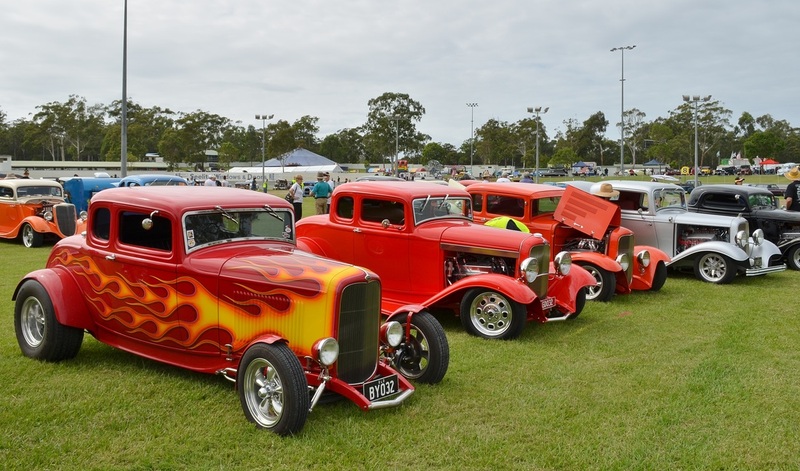 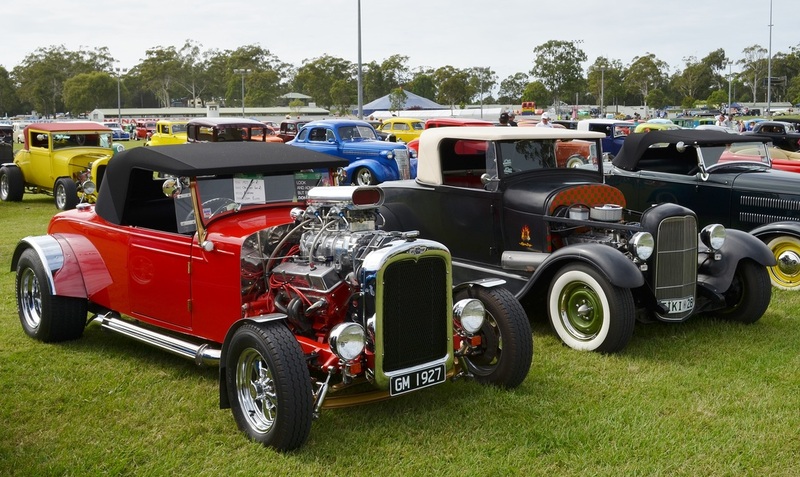 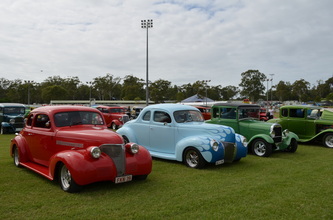 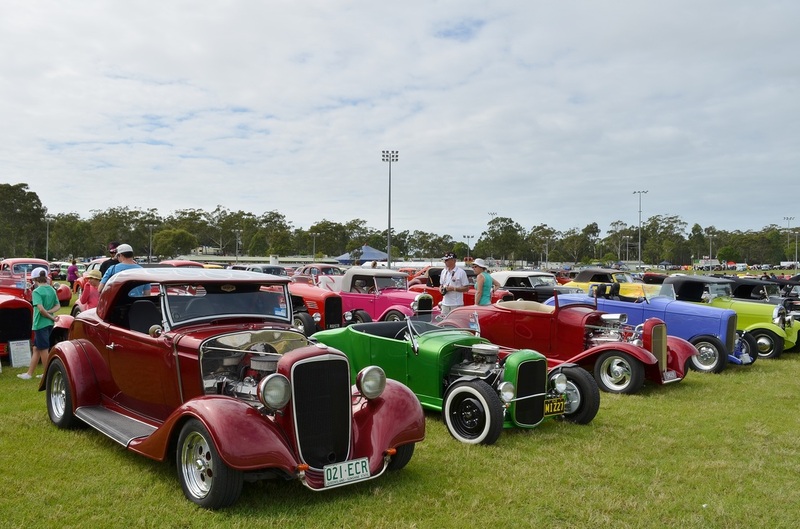 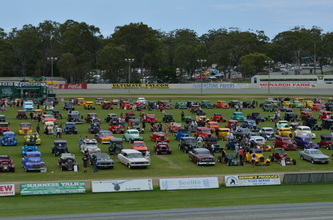 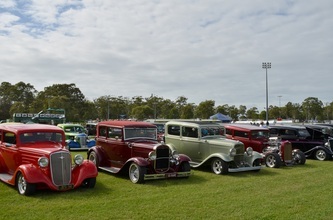 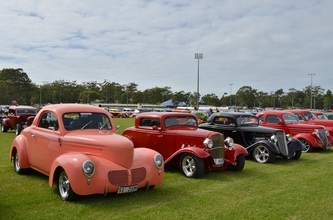 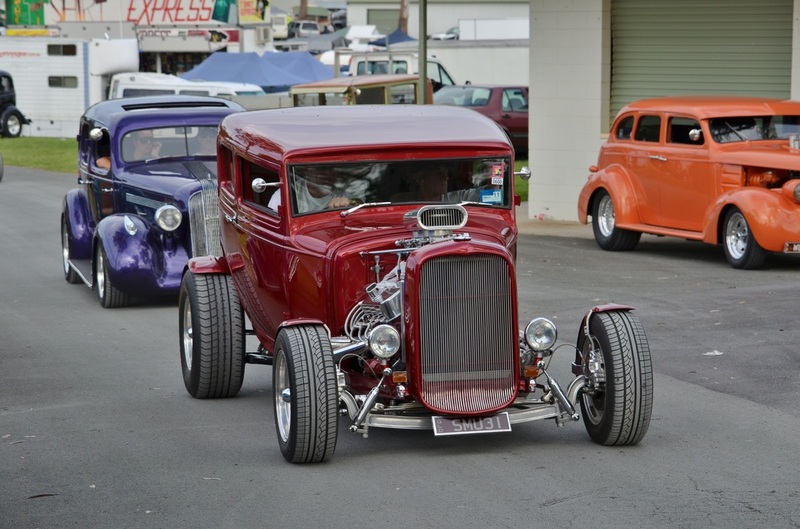 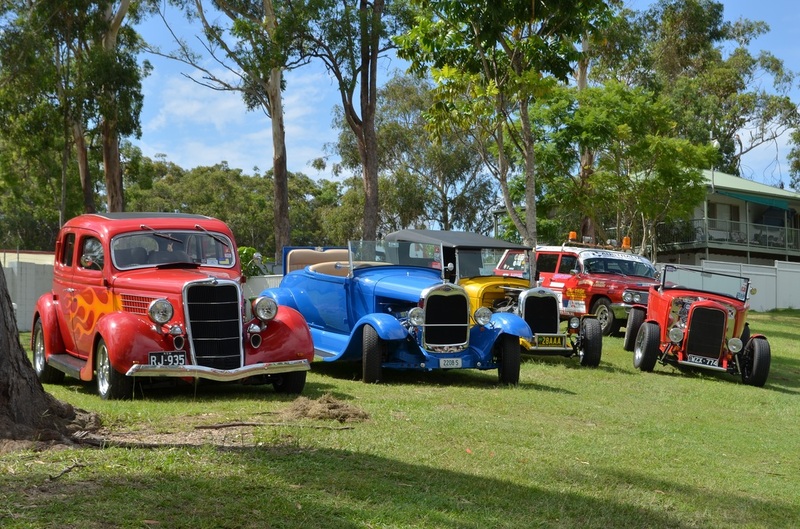 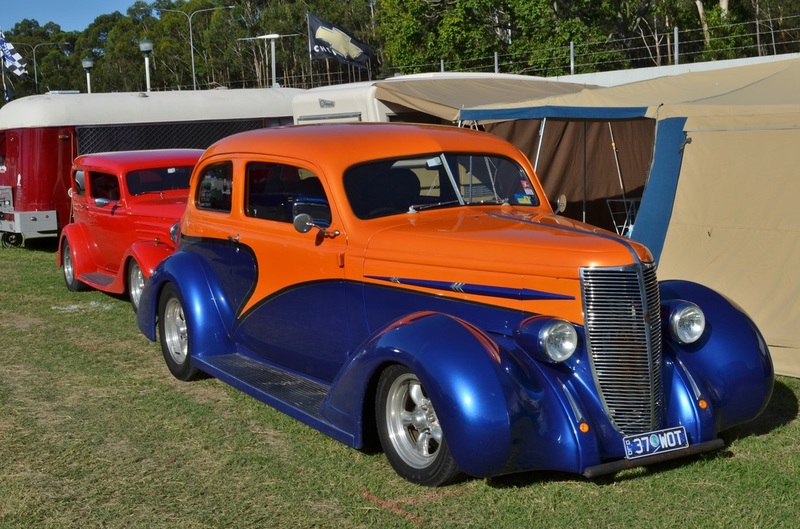 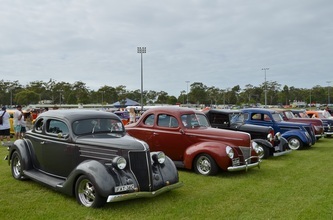 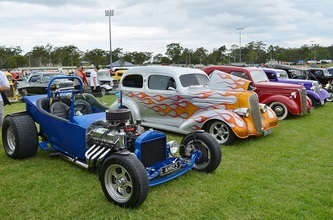 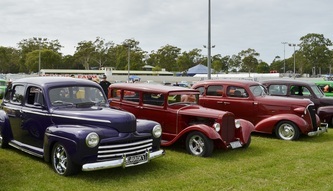 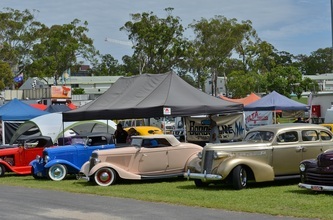 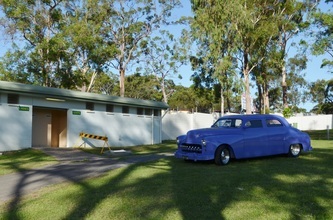 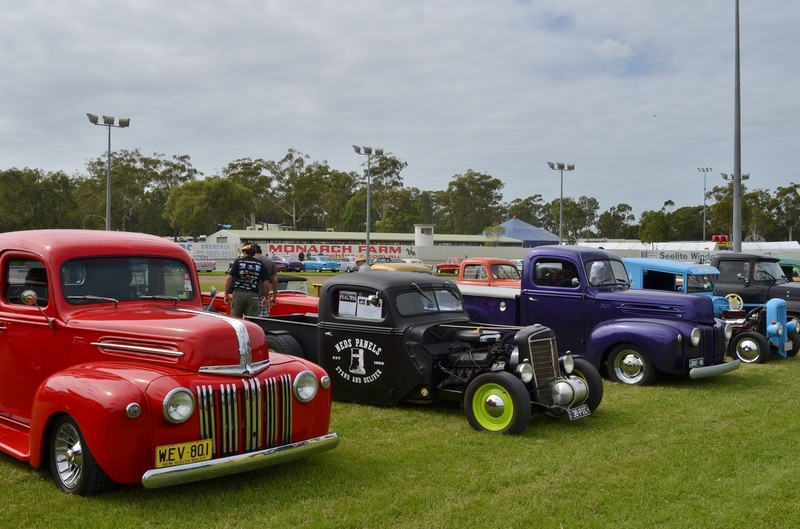 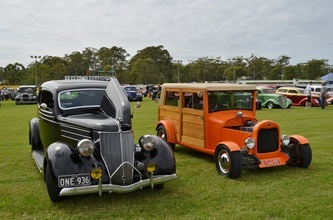 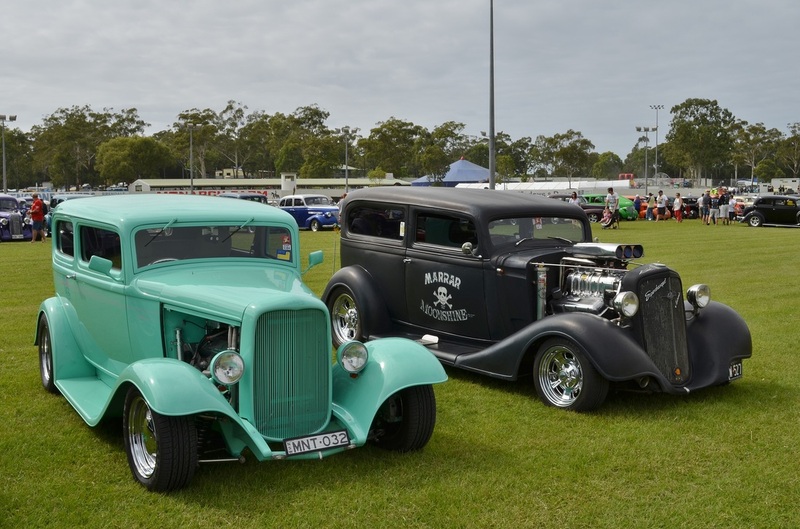 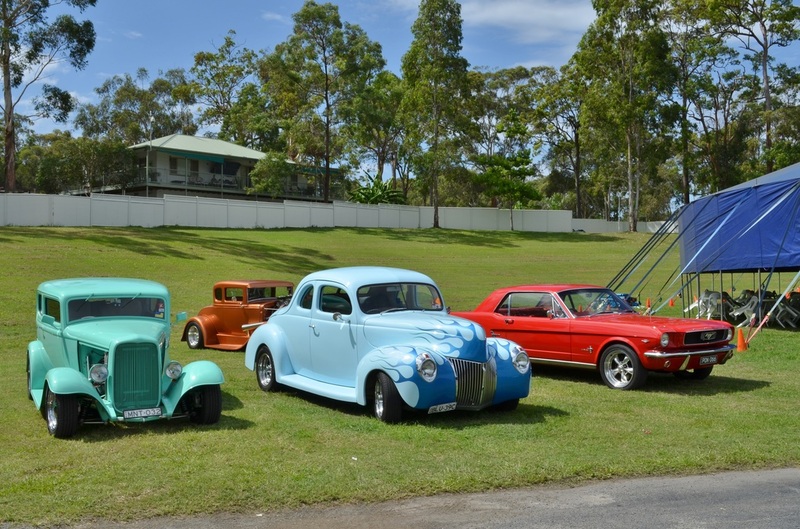 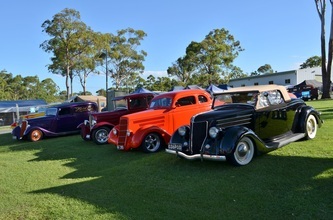 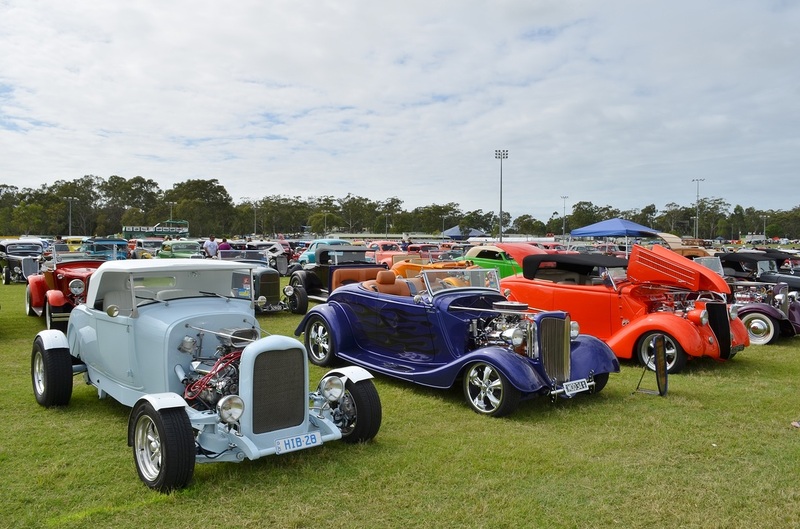 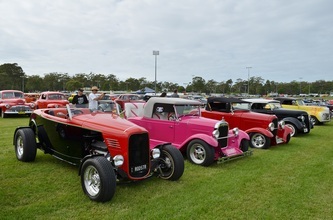 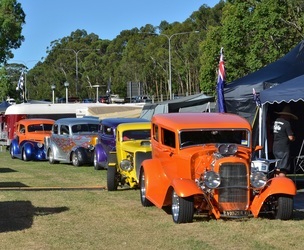 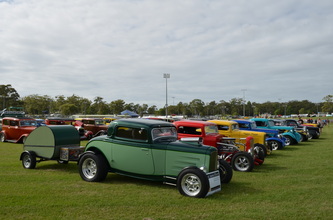 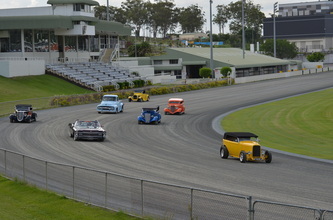 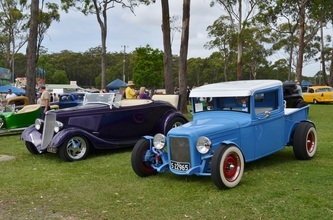 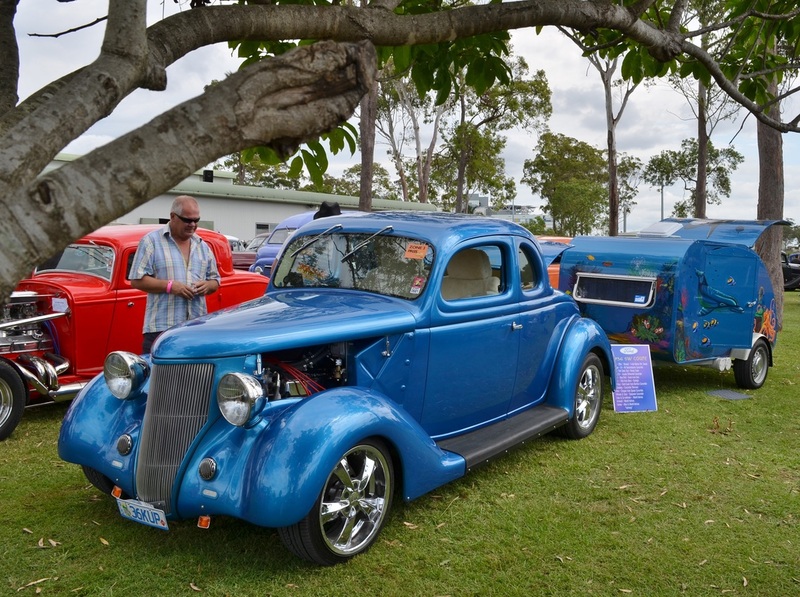 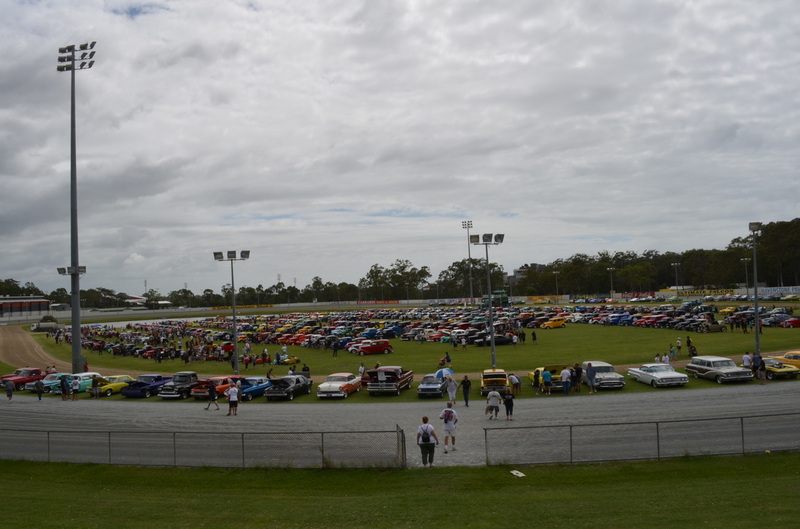 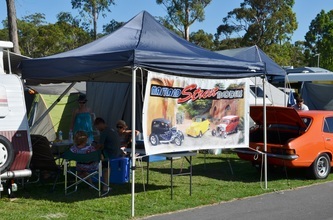 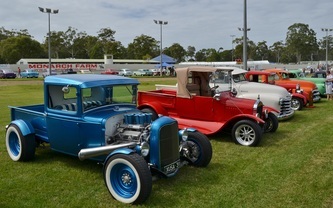 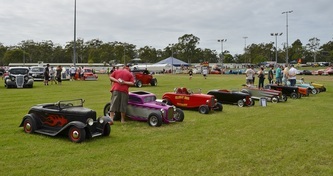 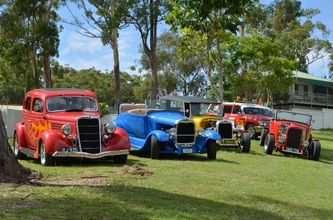 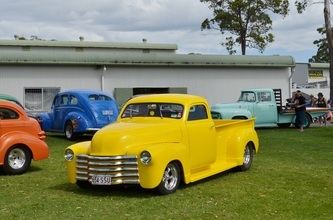 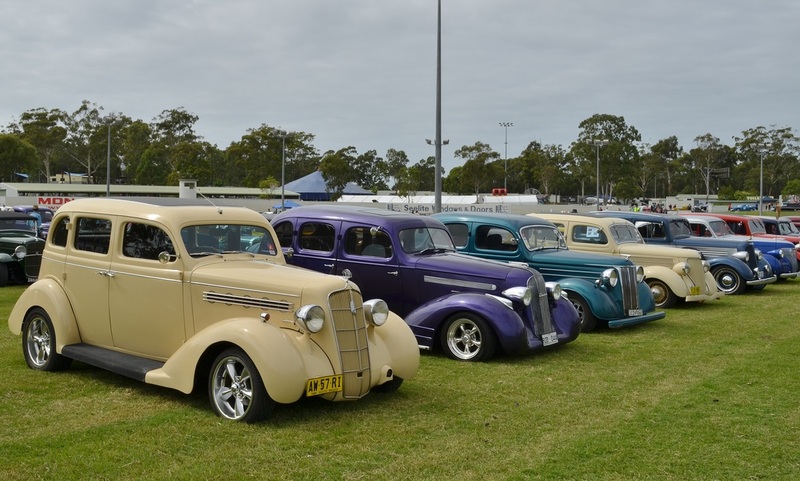 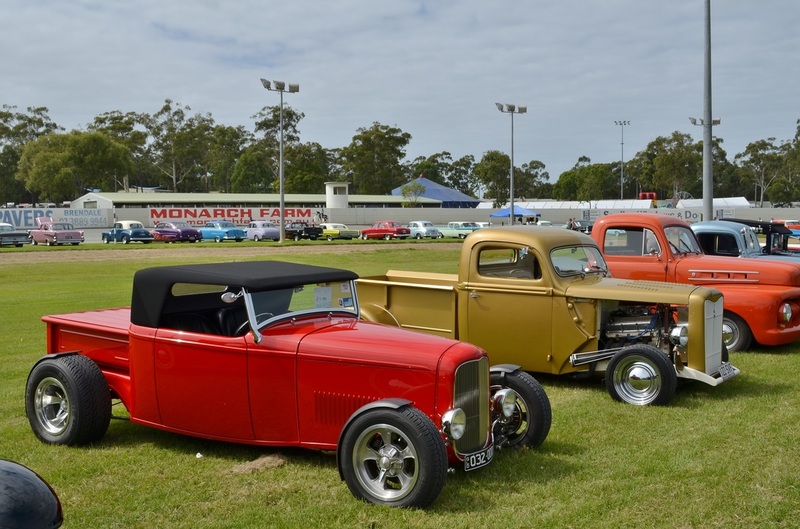 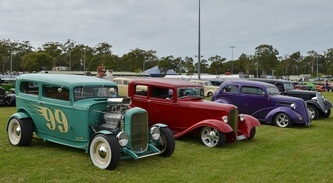 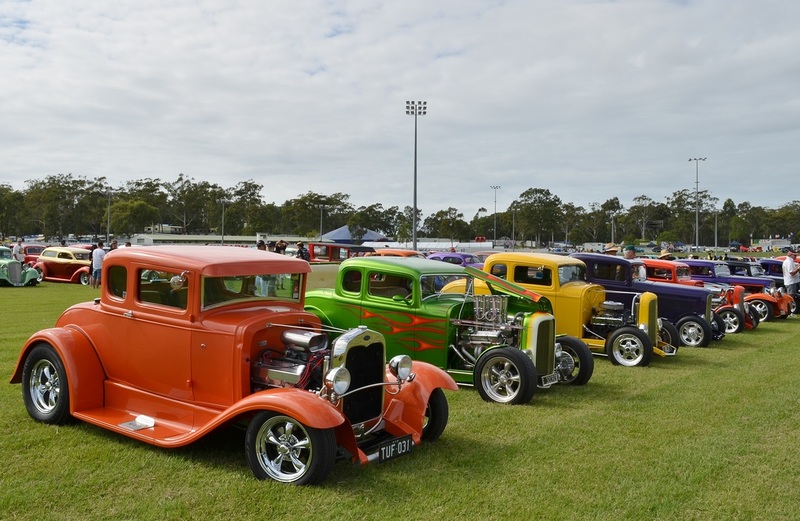 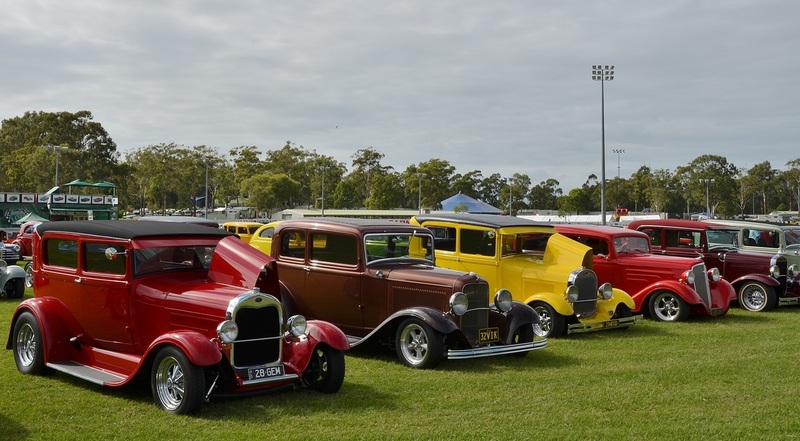 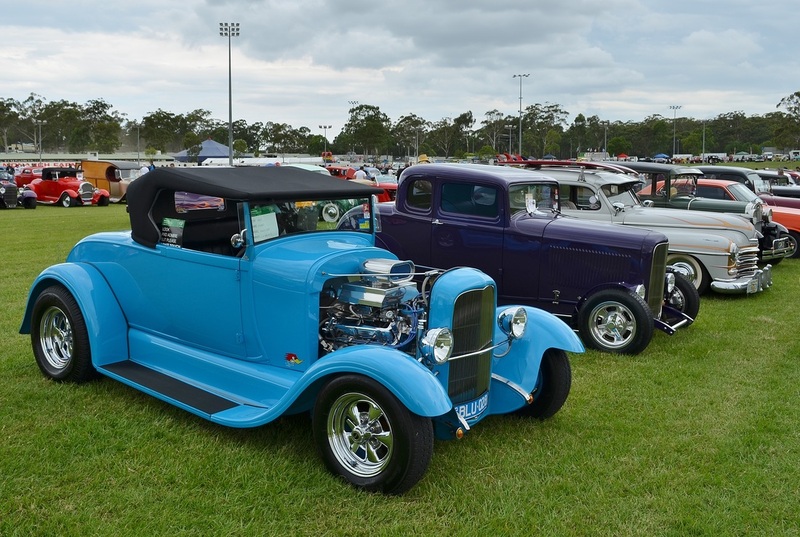 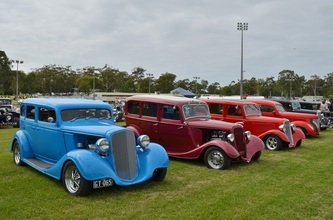 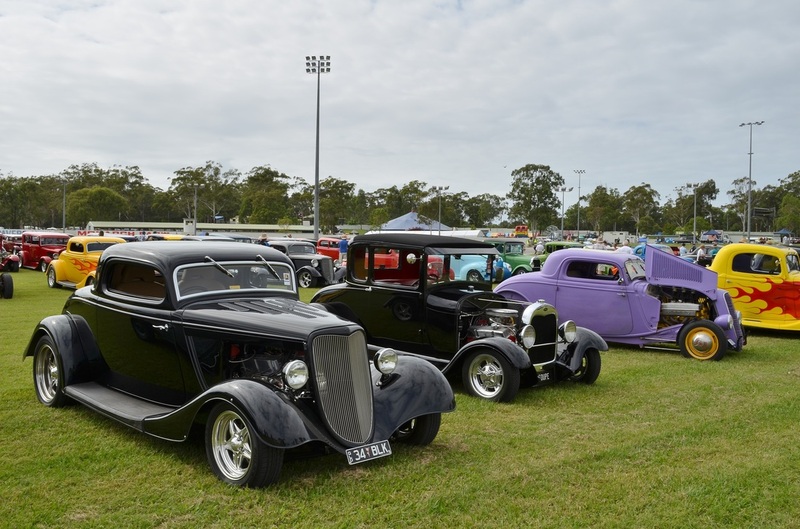 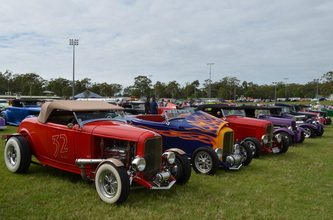 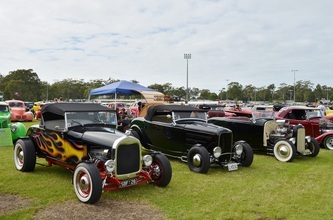 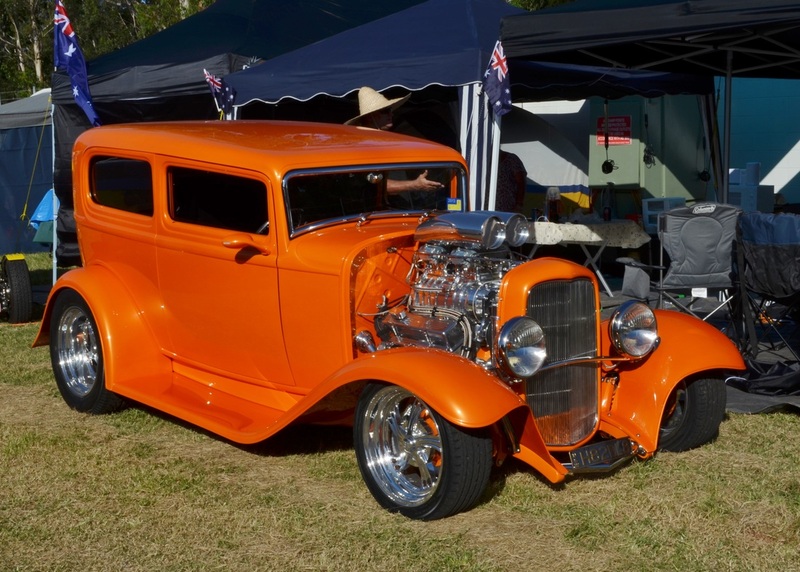 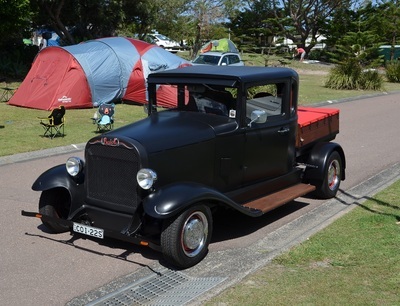 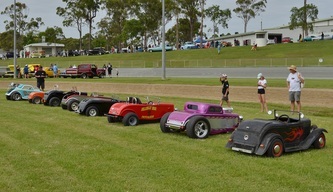 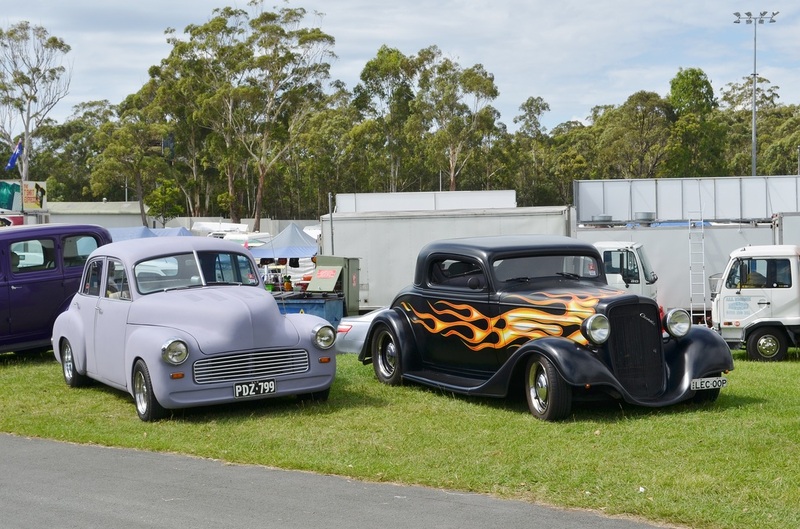 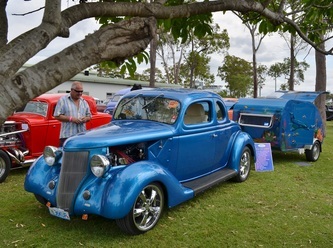 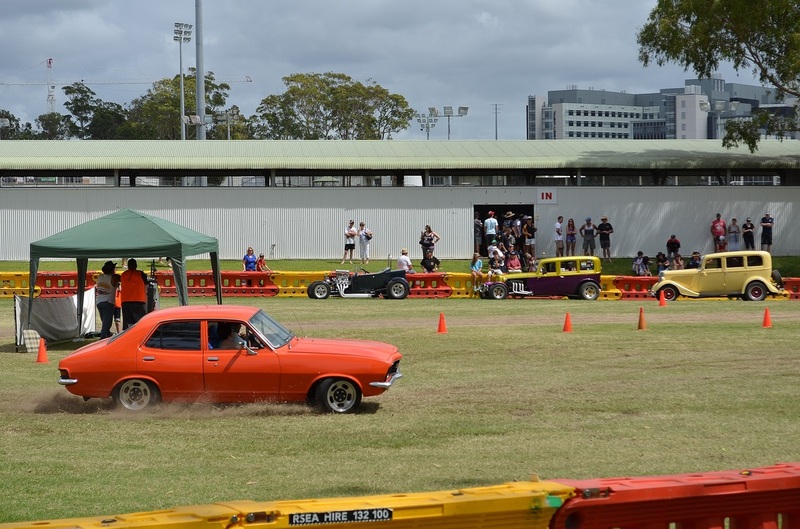 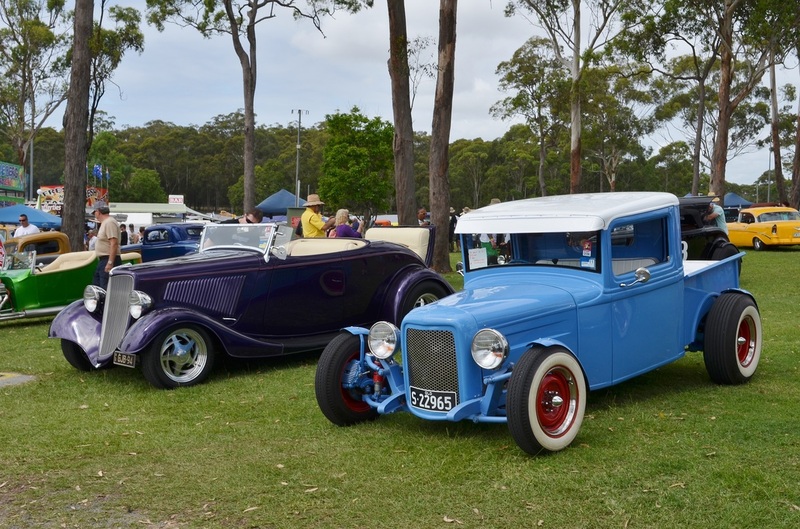 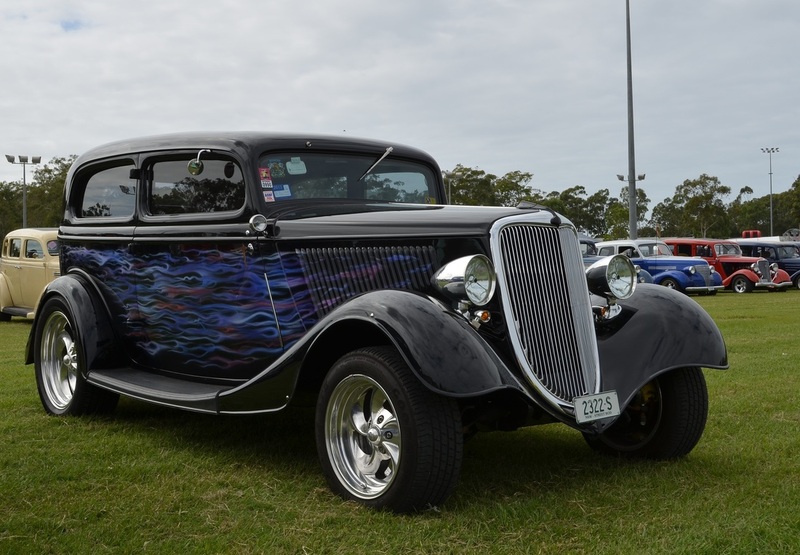 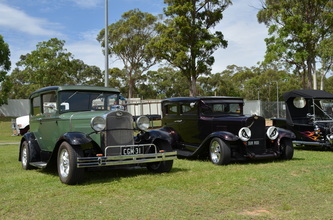 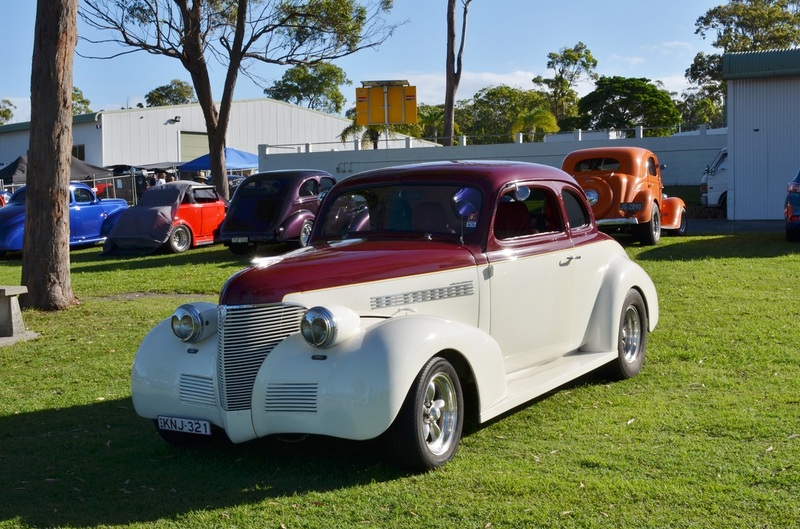 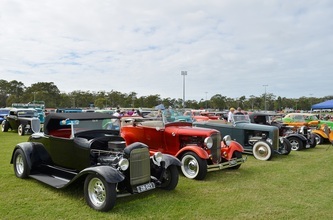 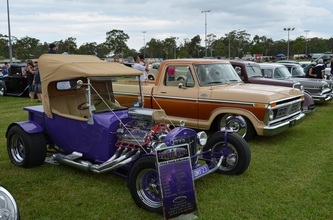 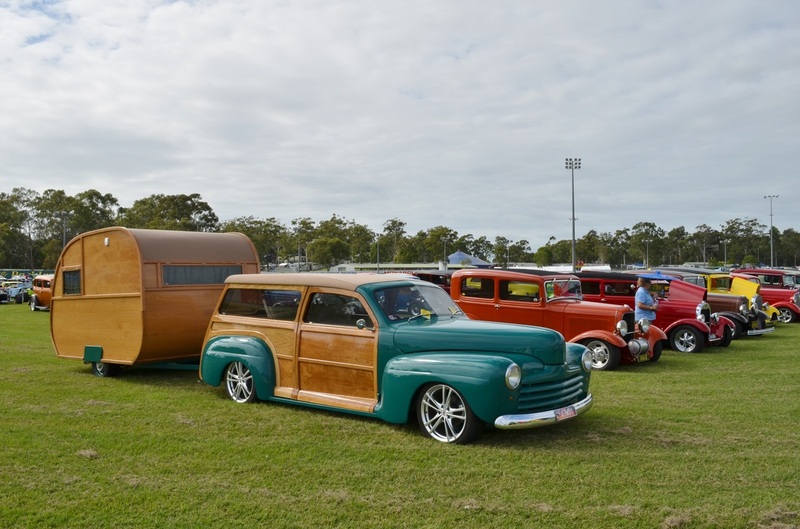 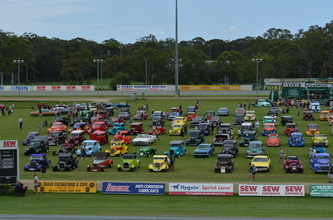 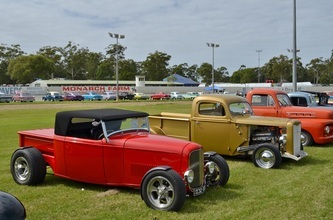 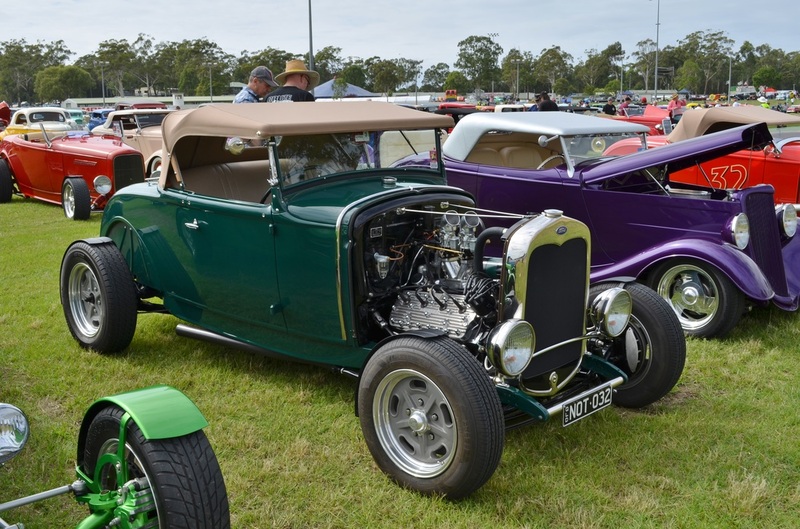 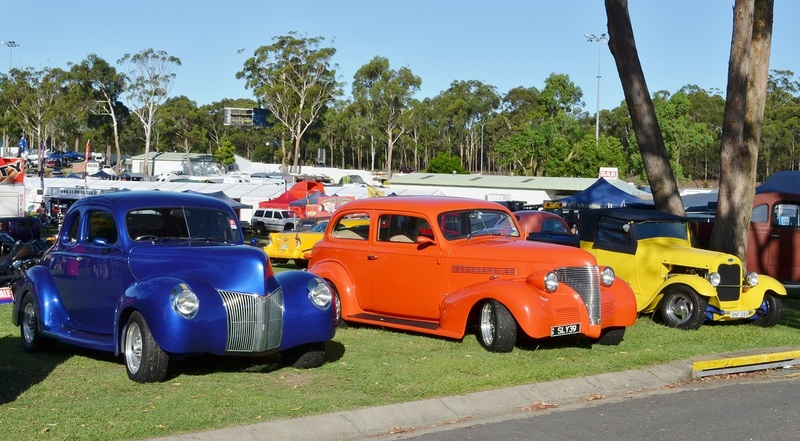 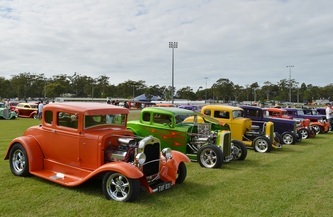 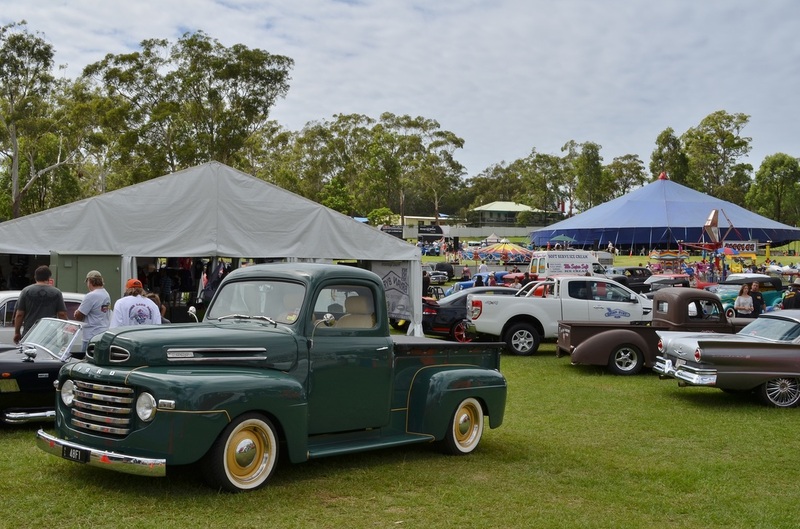 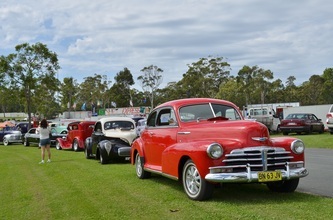 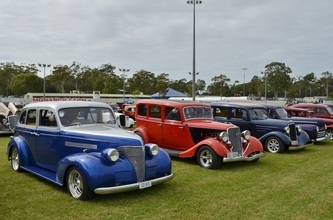 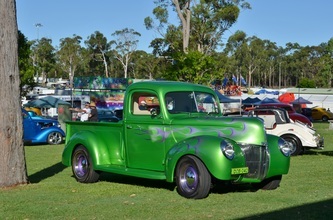 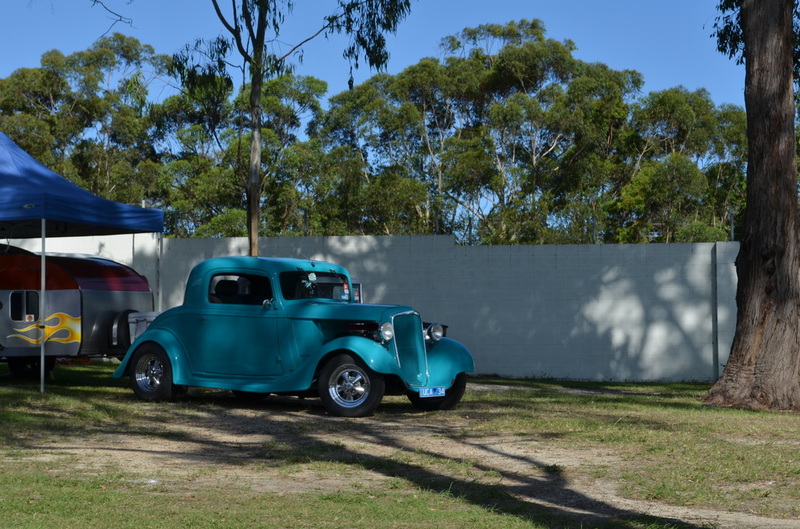 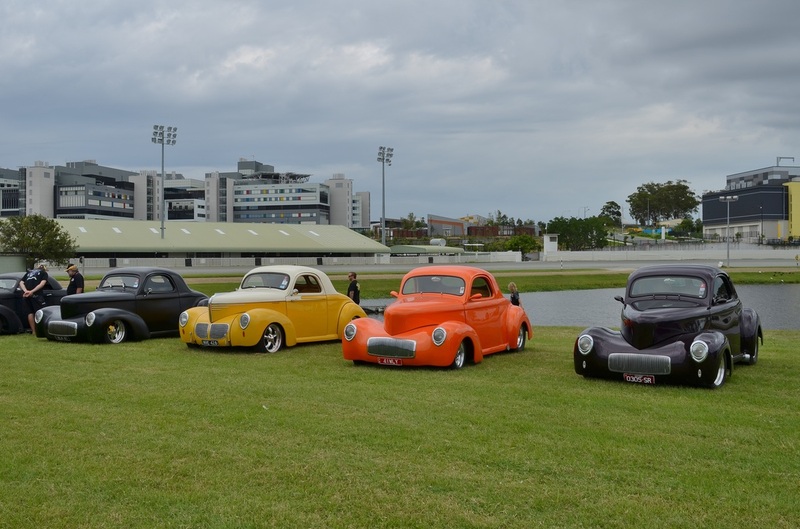 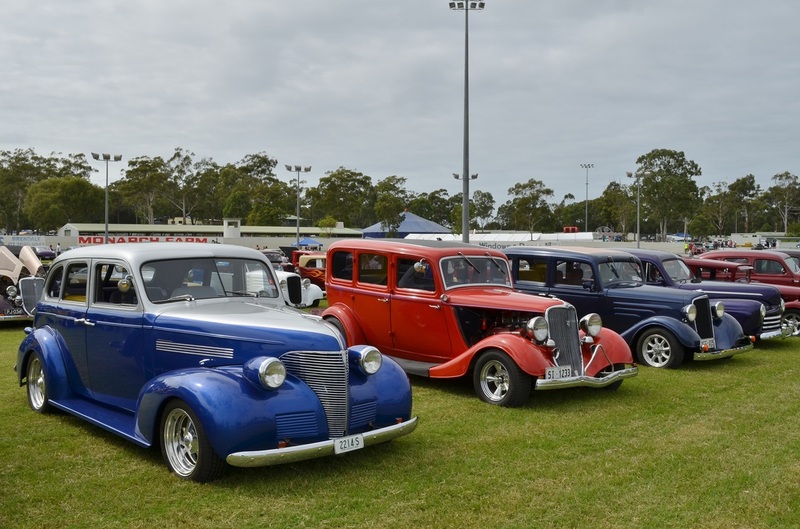 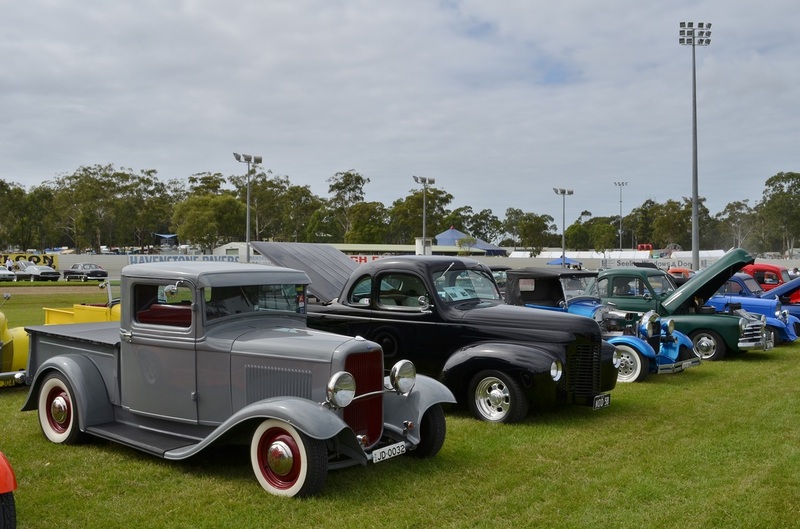 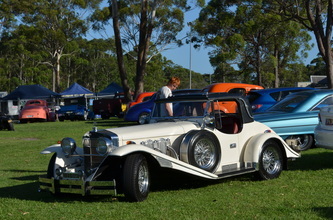 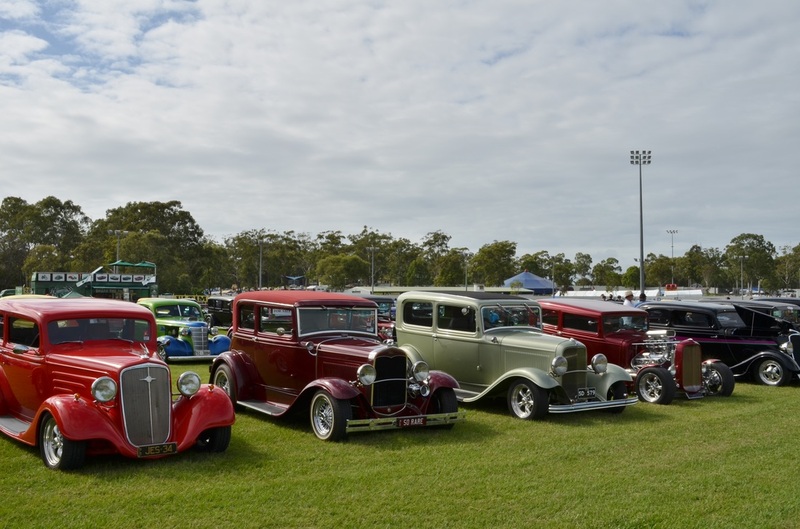 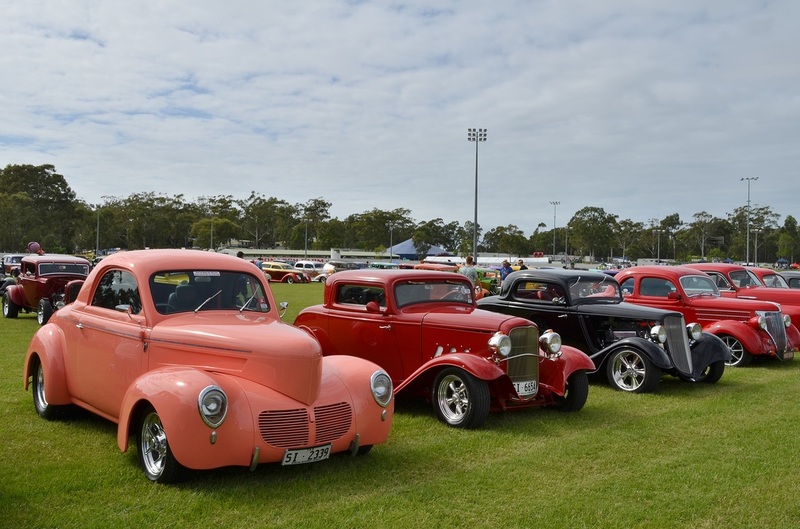 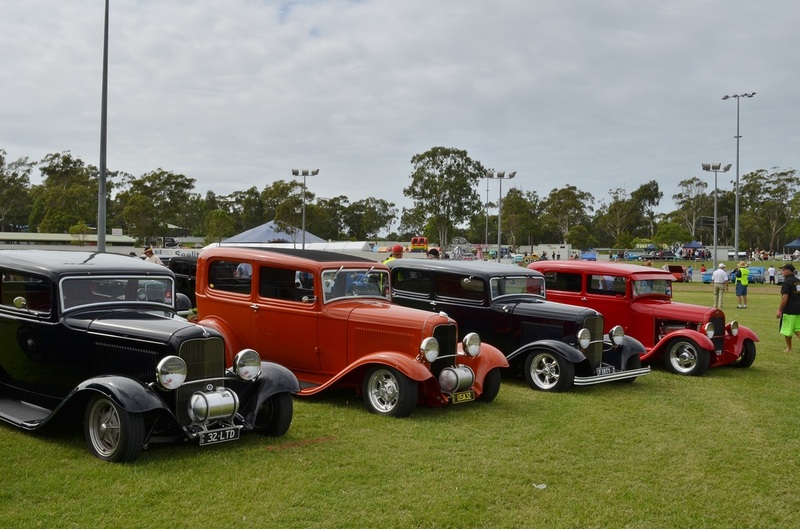 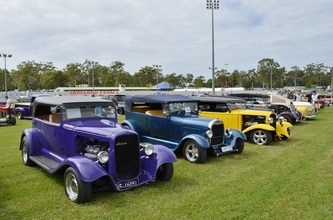 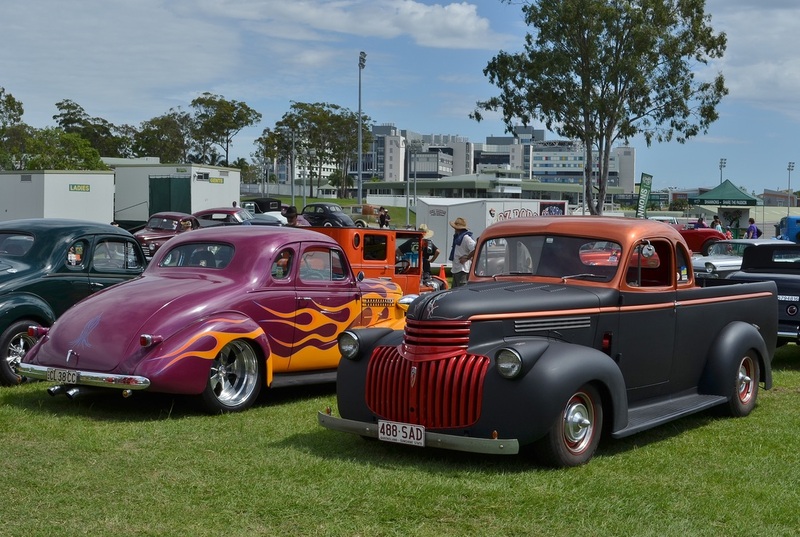 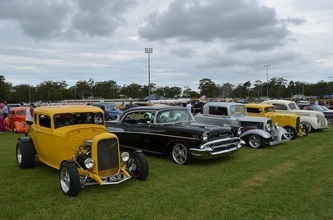 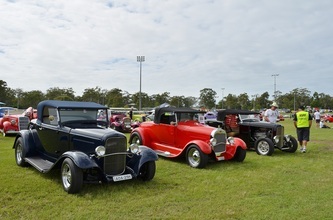 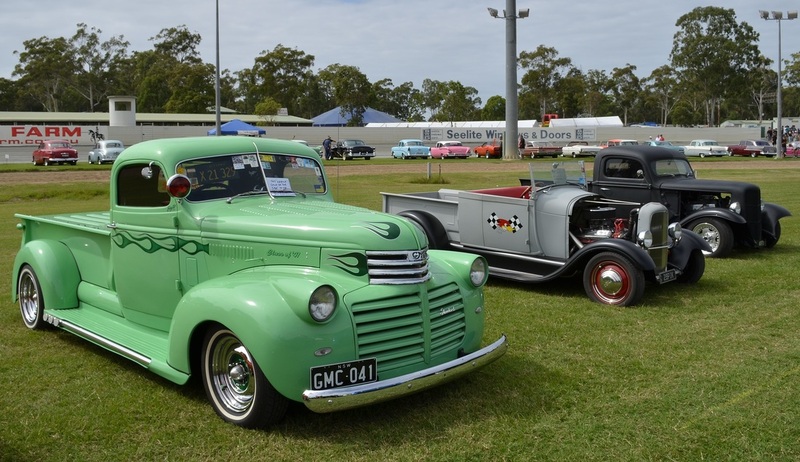 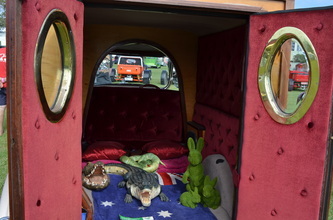 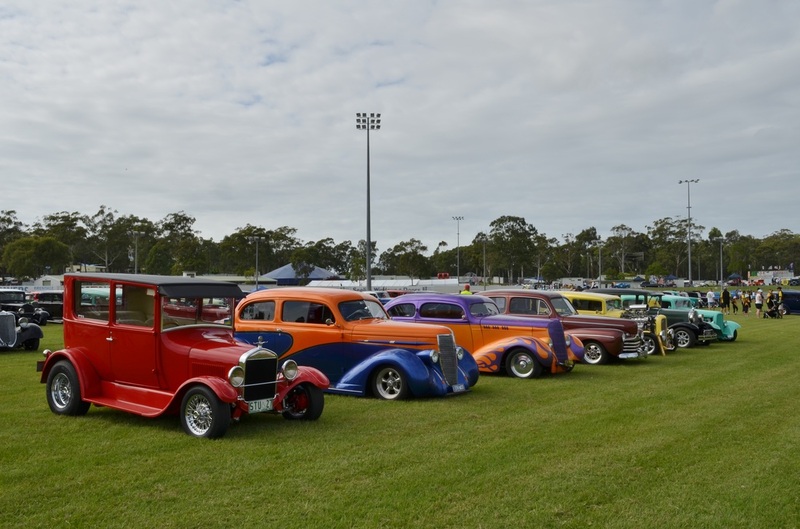 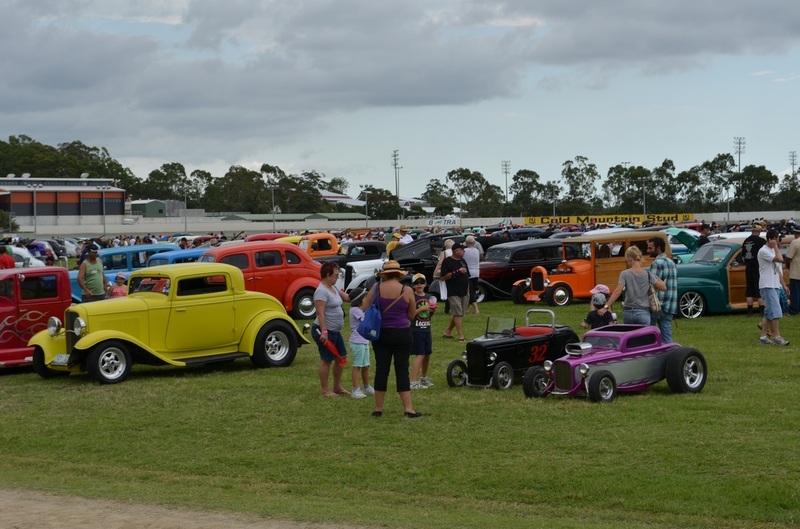 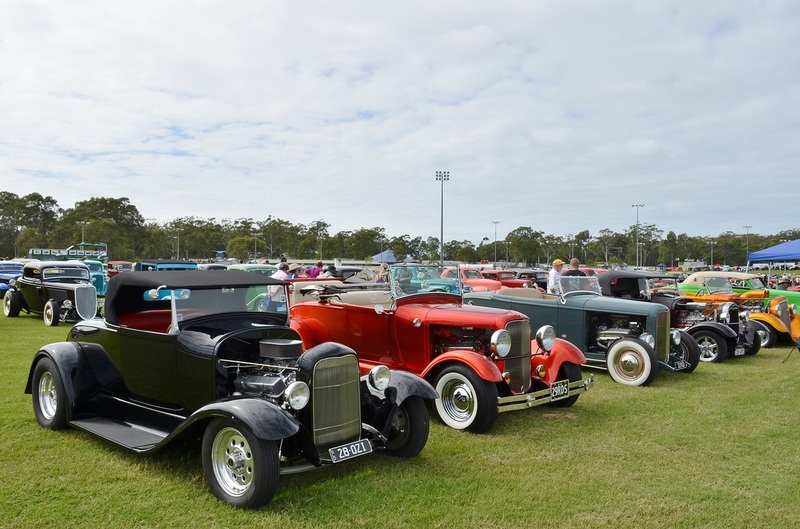 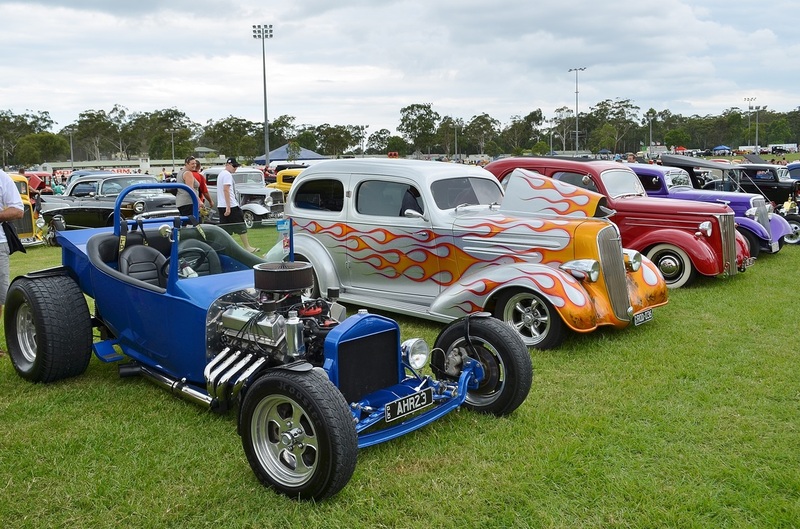 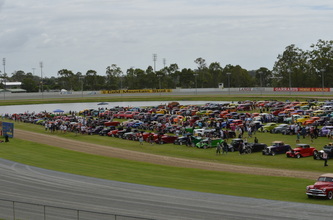 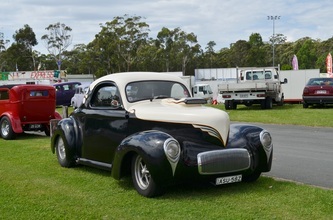 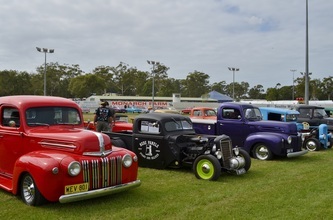 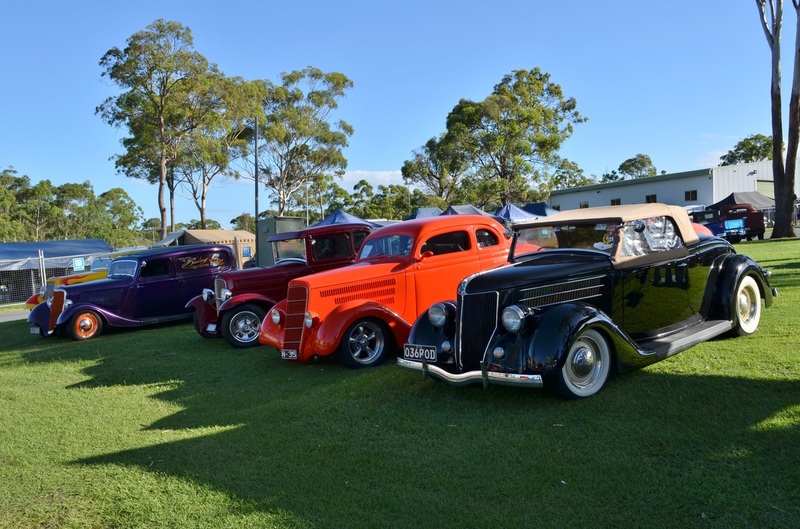 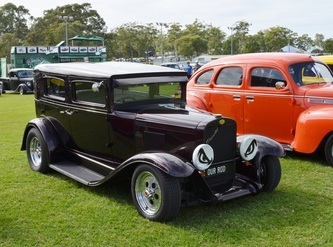 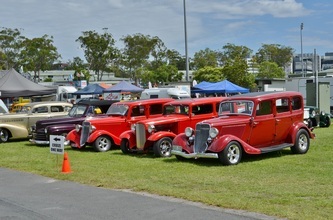 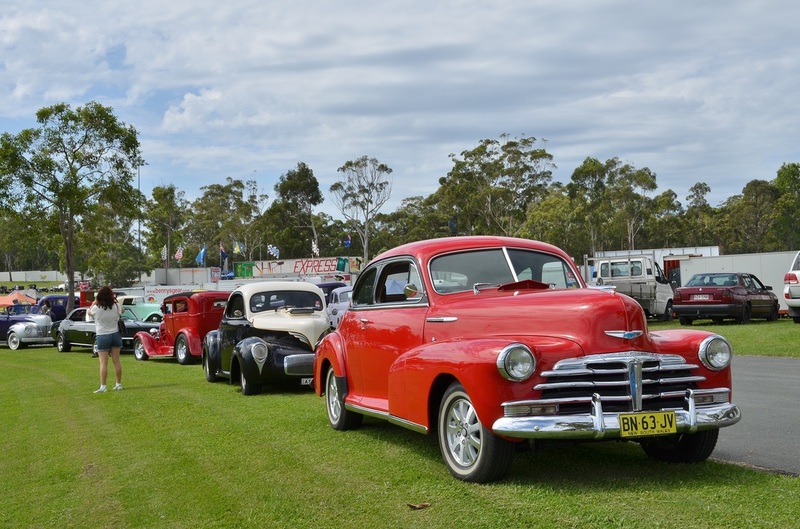 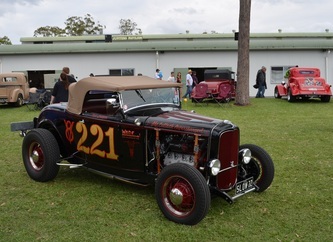 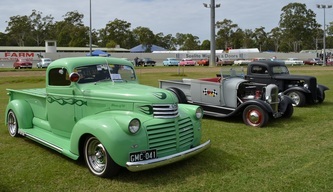 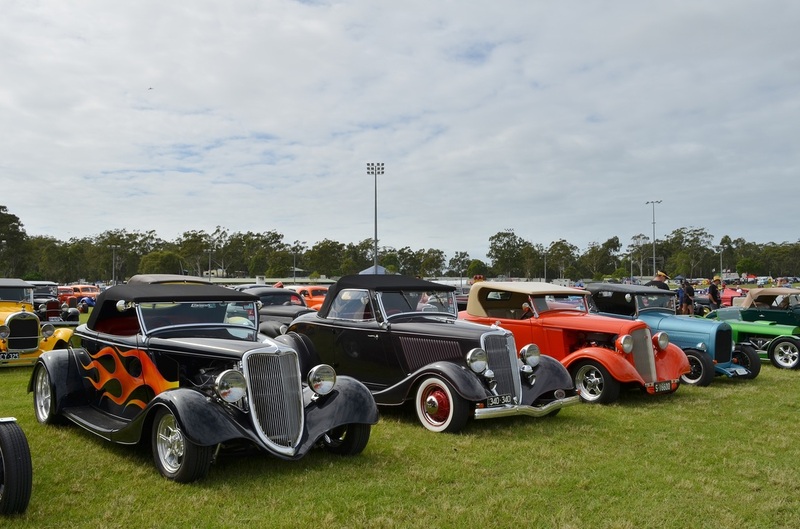 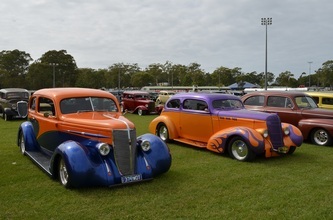 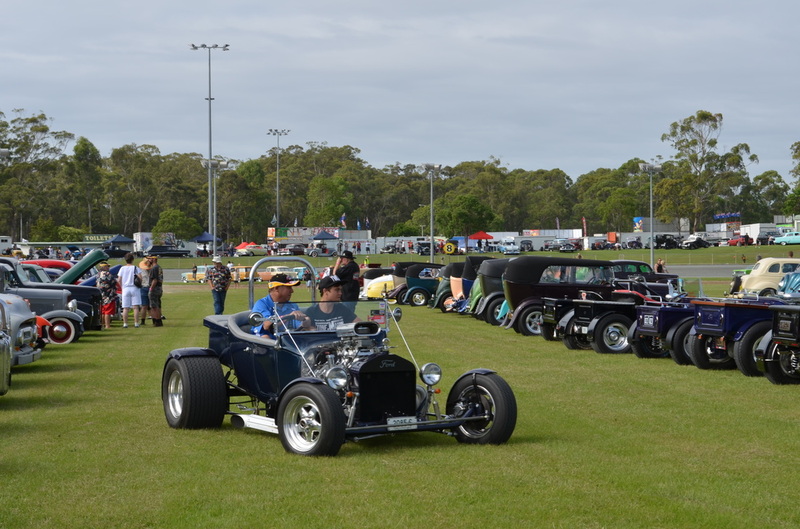 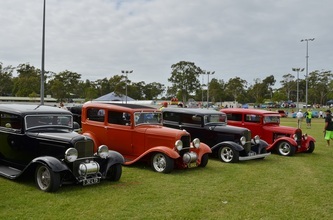 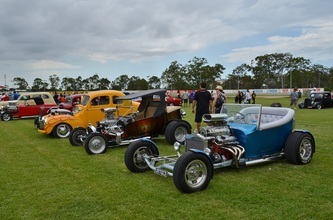 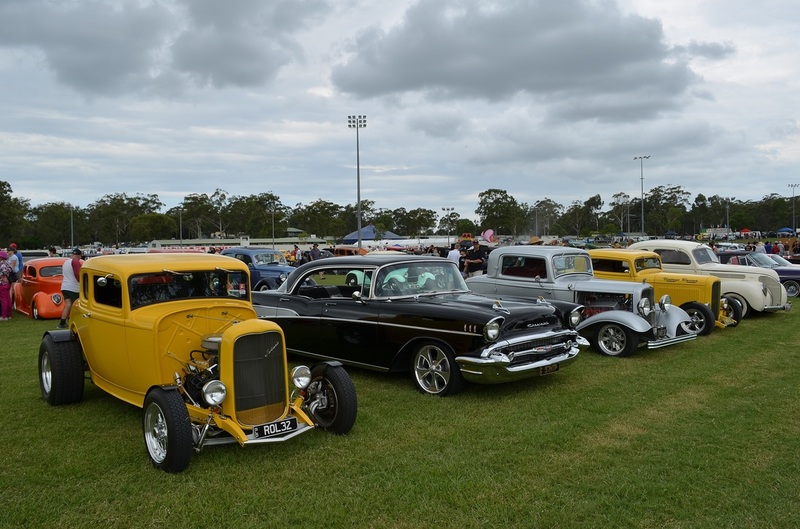 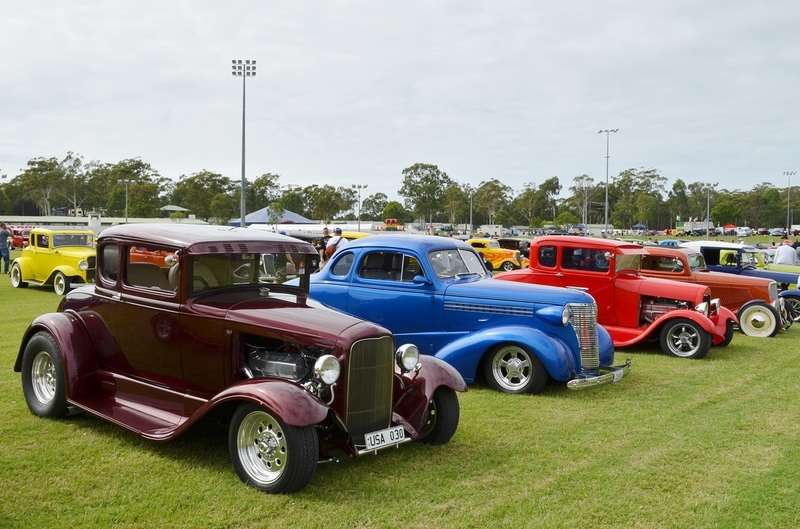 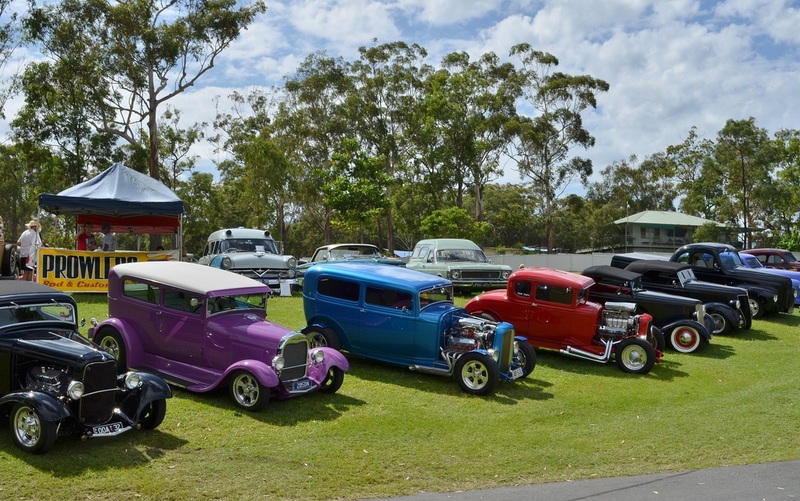 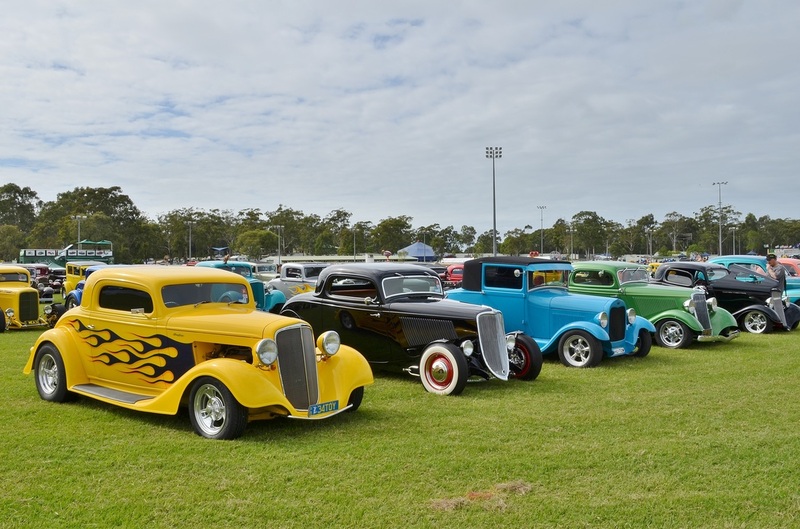 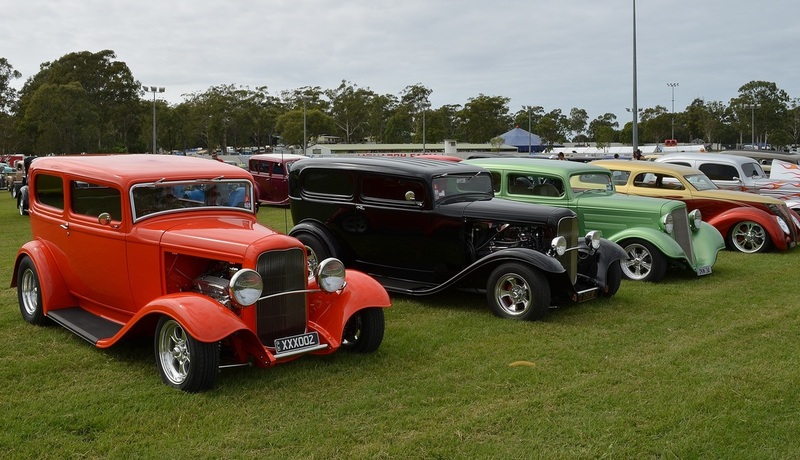 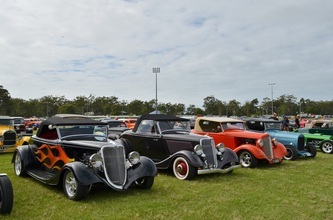 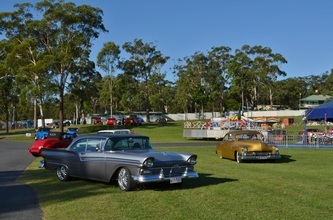 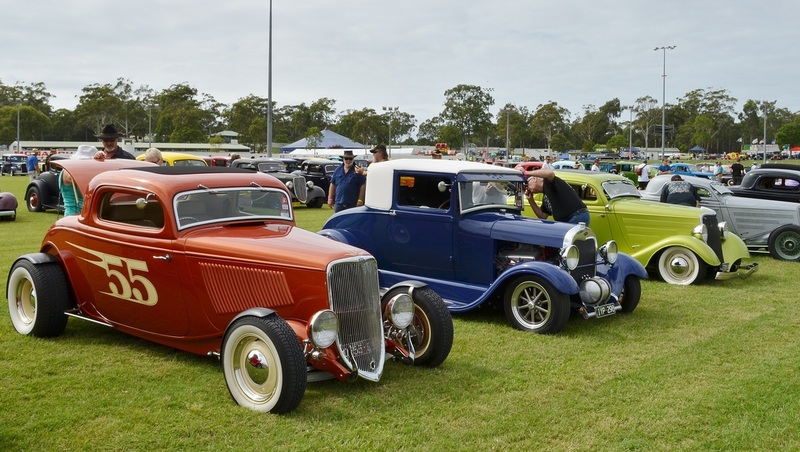 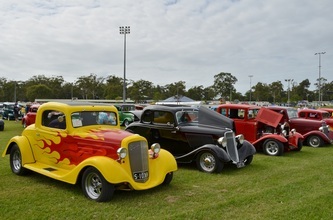 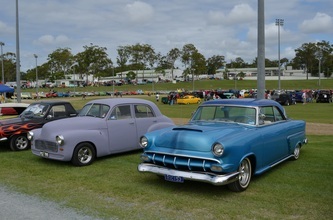 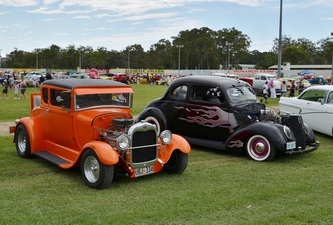 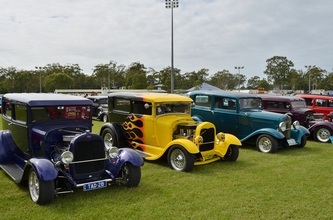 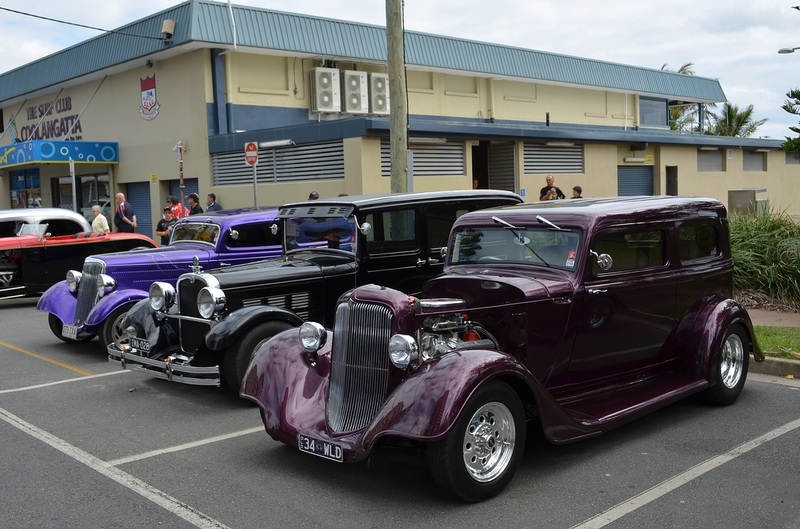 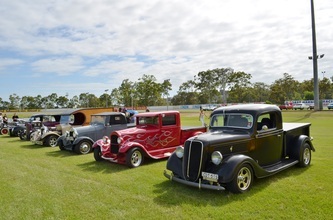 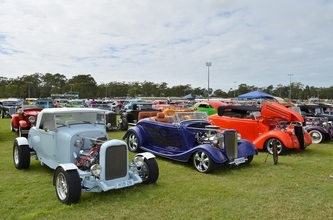 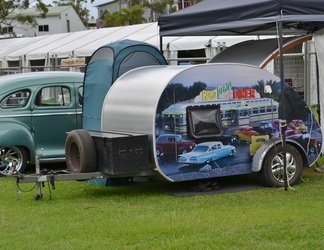 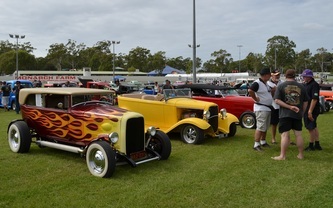 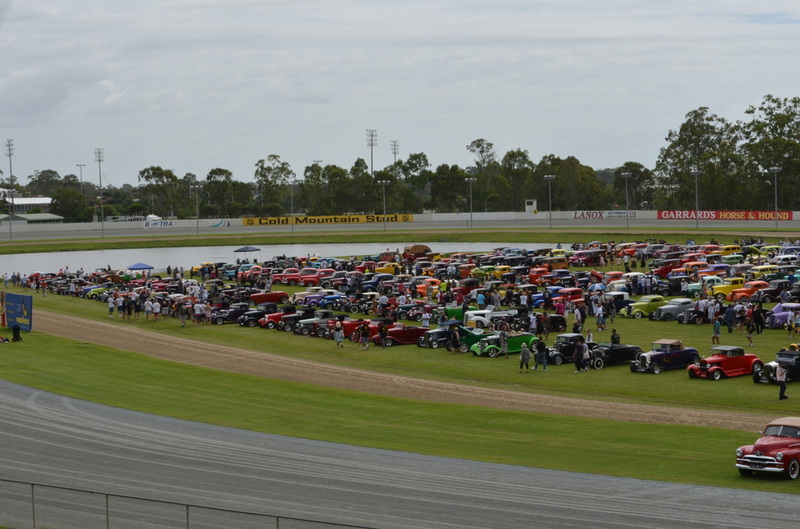 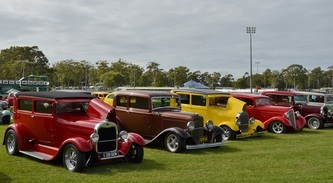 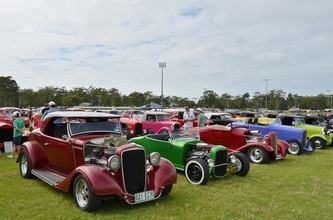 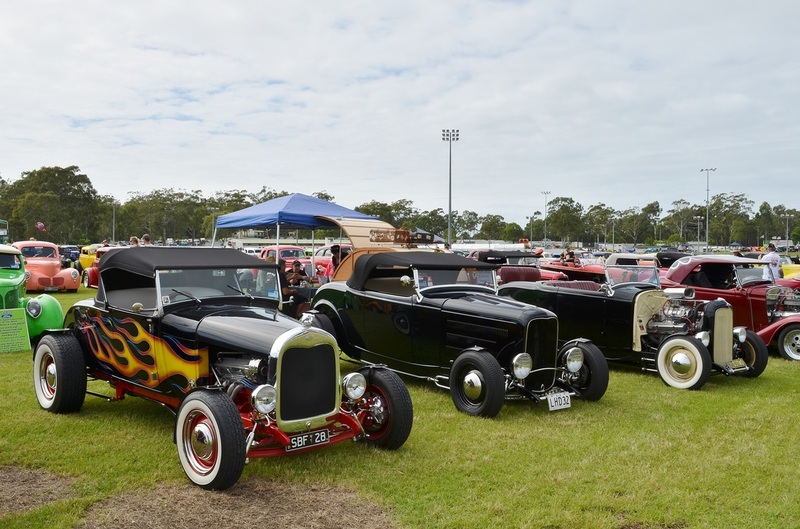 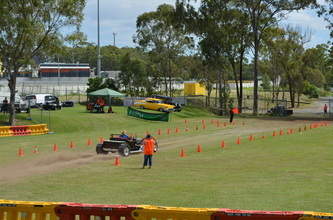 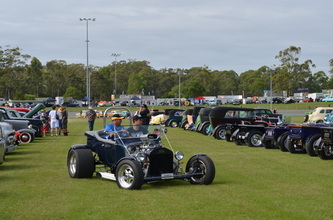 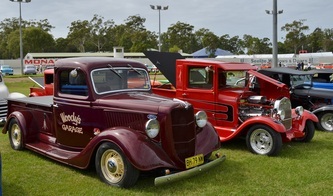 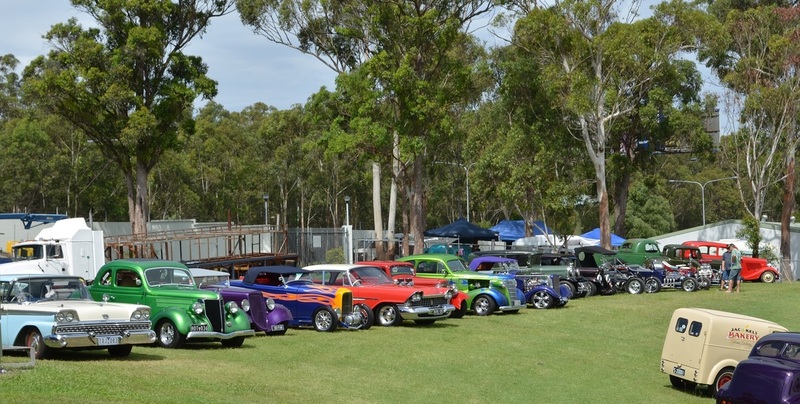 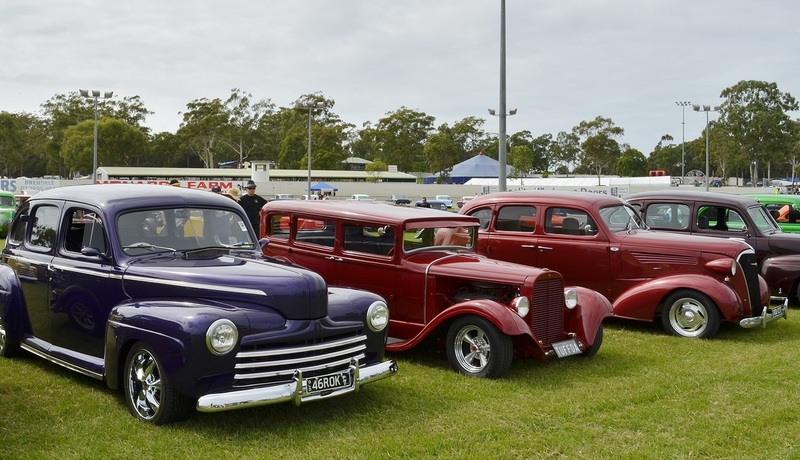 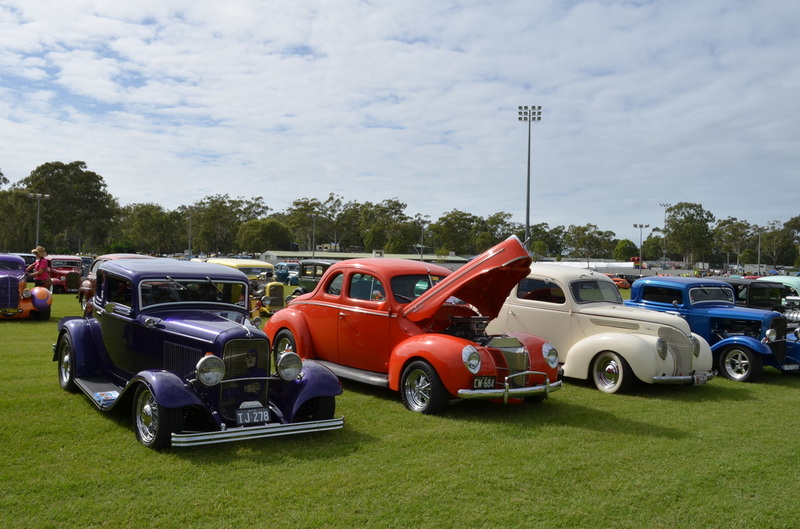 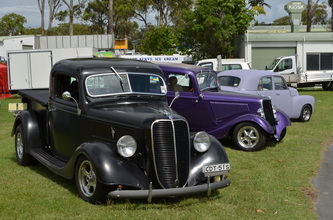 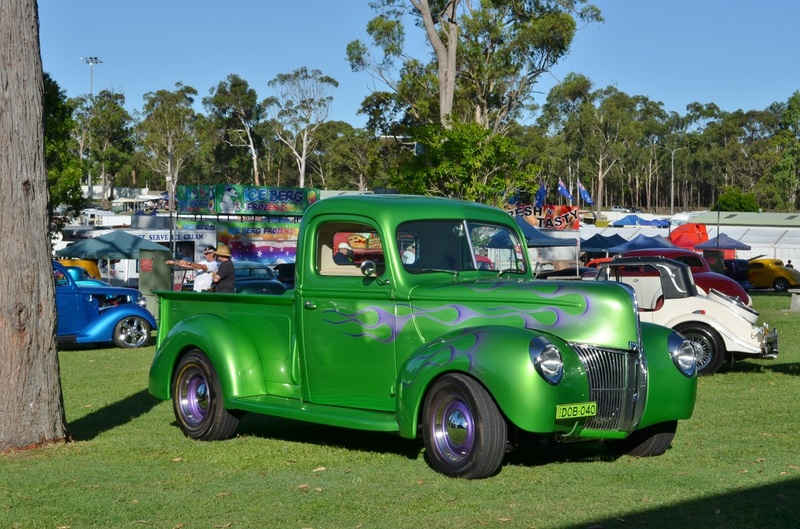 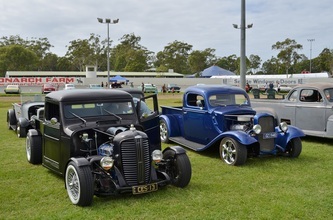 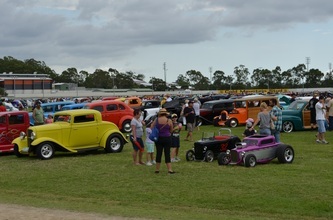 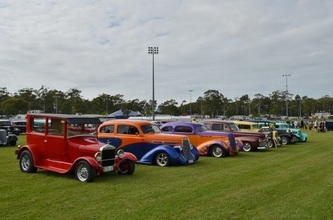 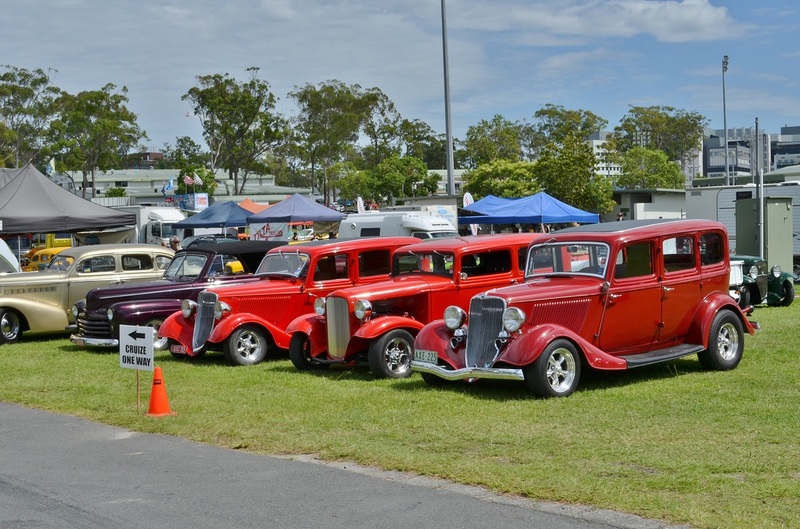 You can see a picture of our clubs "brains trust" in the show and shine area and it took them two days to go through all the rods on display. 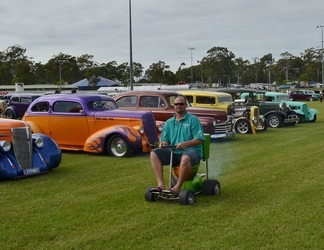 Ron got into the spirit of the event by spraying tyre shine on his legs, the only trouble was he thought it was aerogard. On Sunday the presentation took place and the rain decided to come, it bucketed down but by this time the event was nearly over and it could not dampen what was a fantastic week. 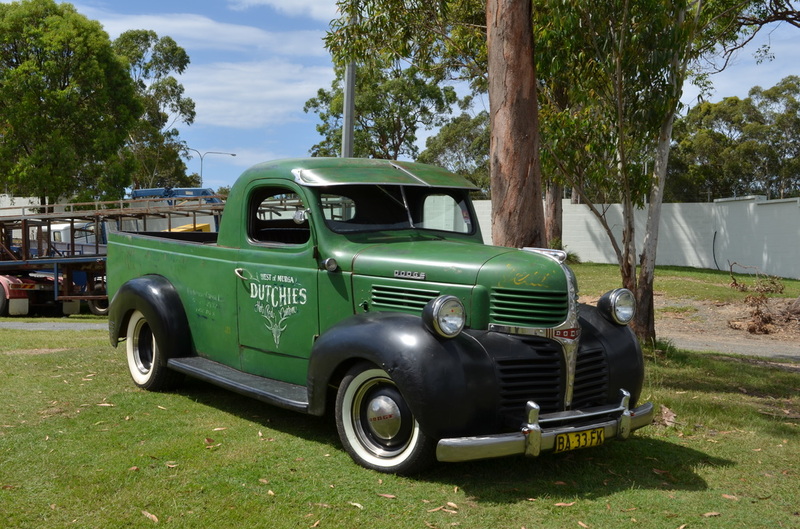 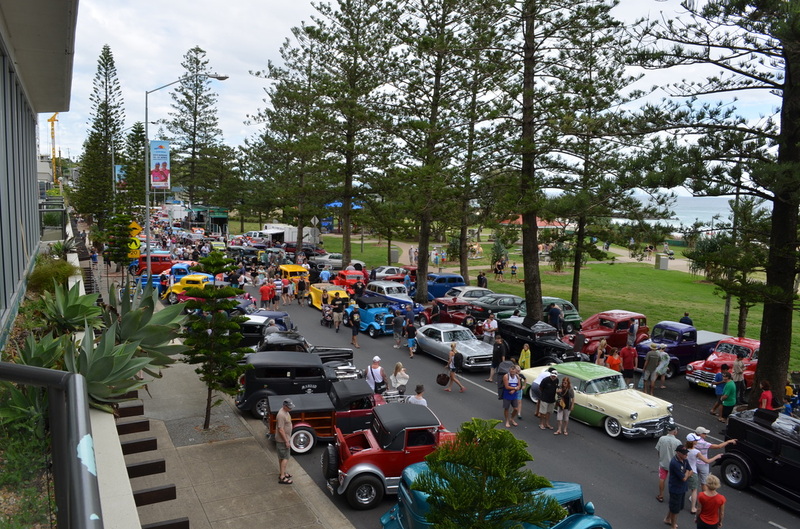 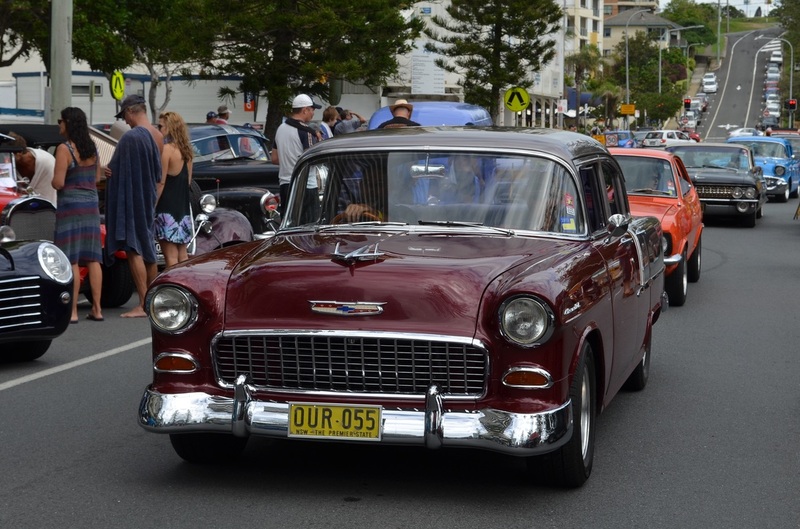 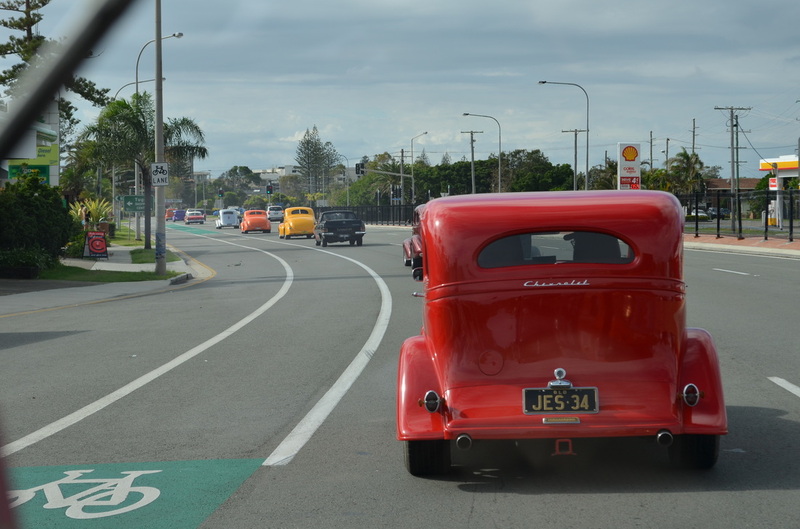 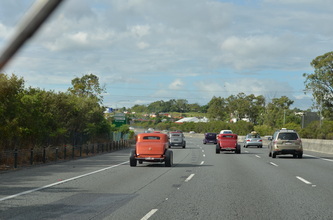 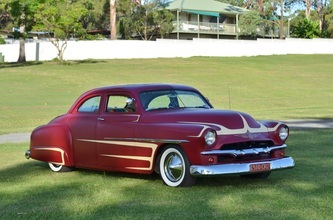 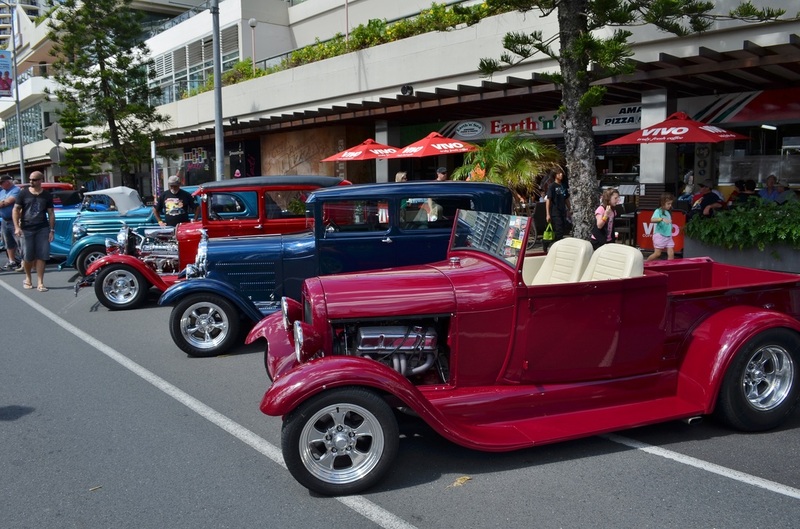 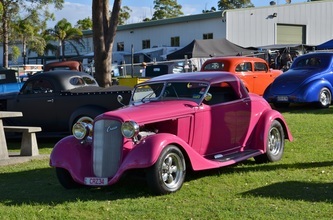 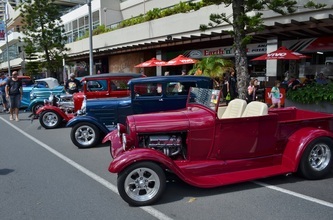 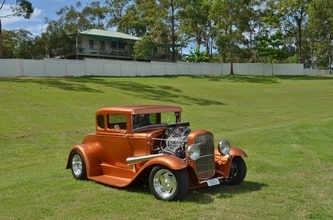 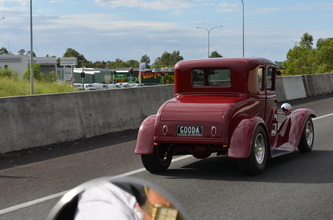 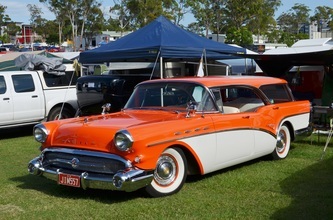 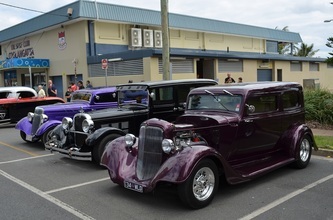 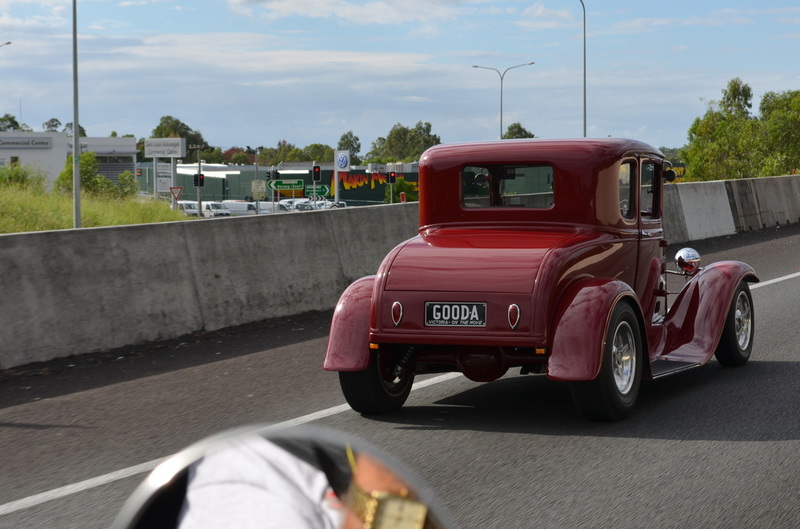 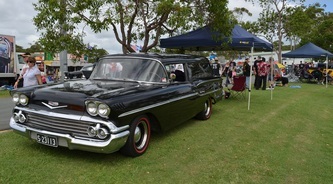 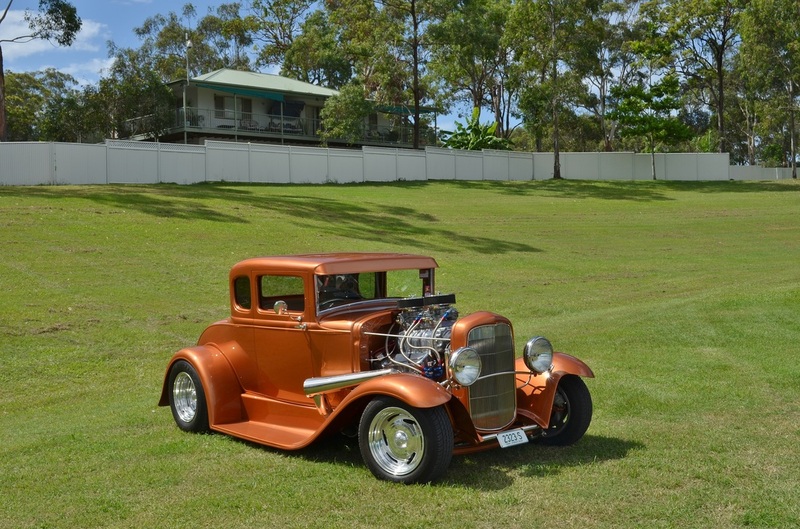 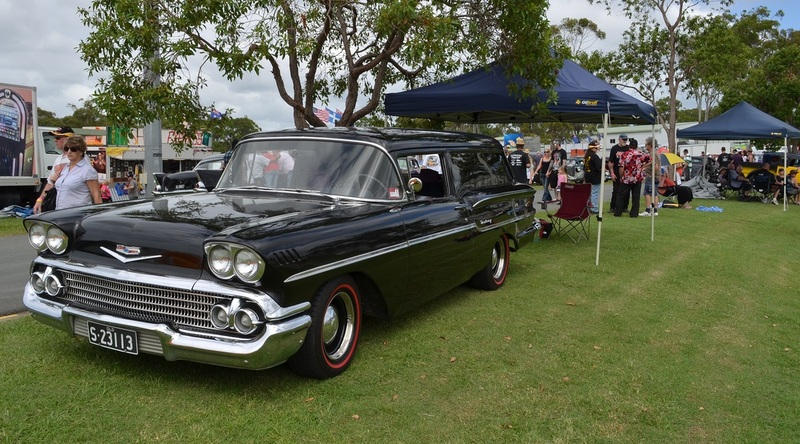 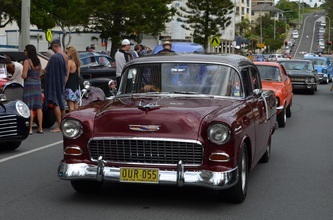 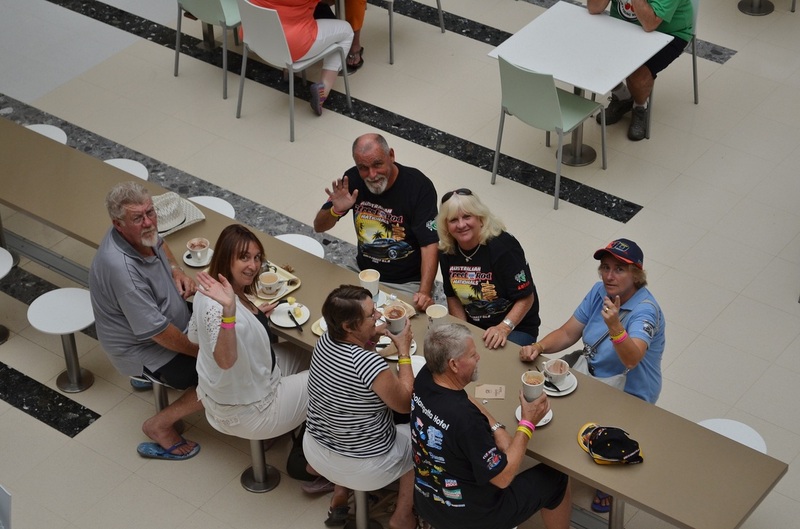 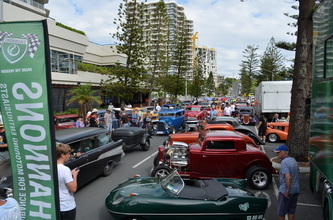 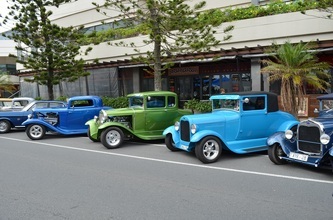 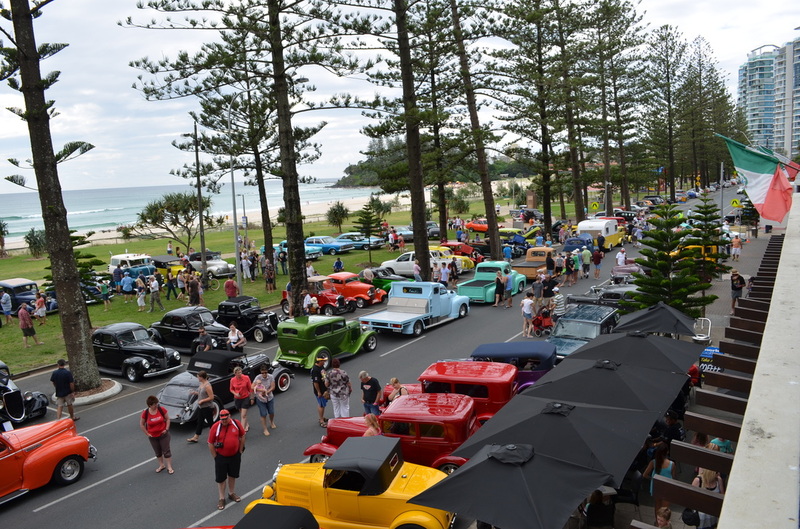 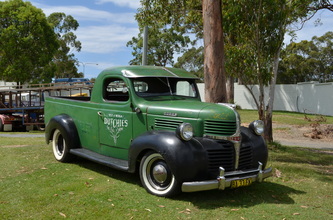 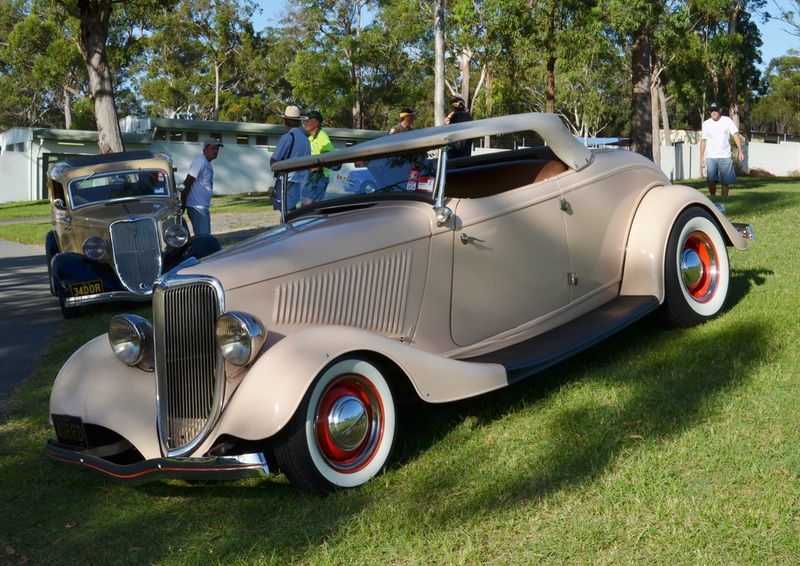 The last activity was a cruise to Coolangatta on the Monday. 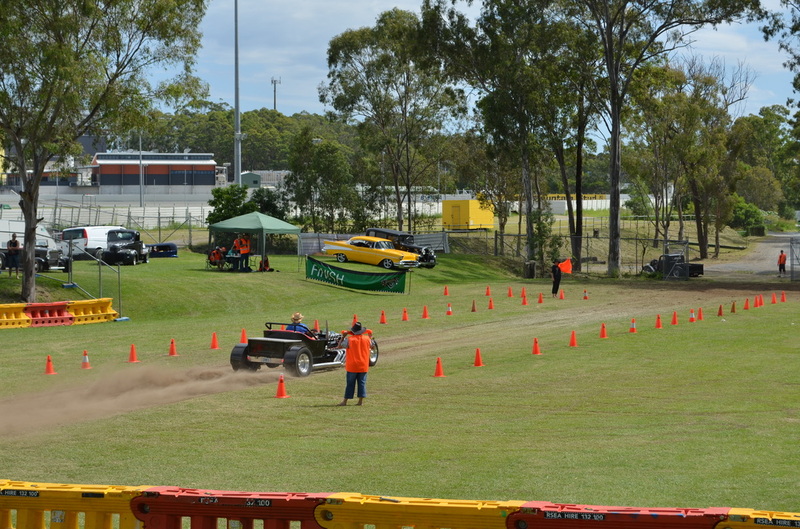 This was well attended and everyone had another great day. Congratulations to all those involved in running the event you did a fantastic job and really looked after all those who attended.